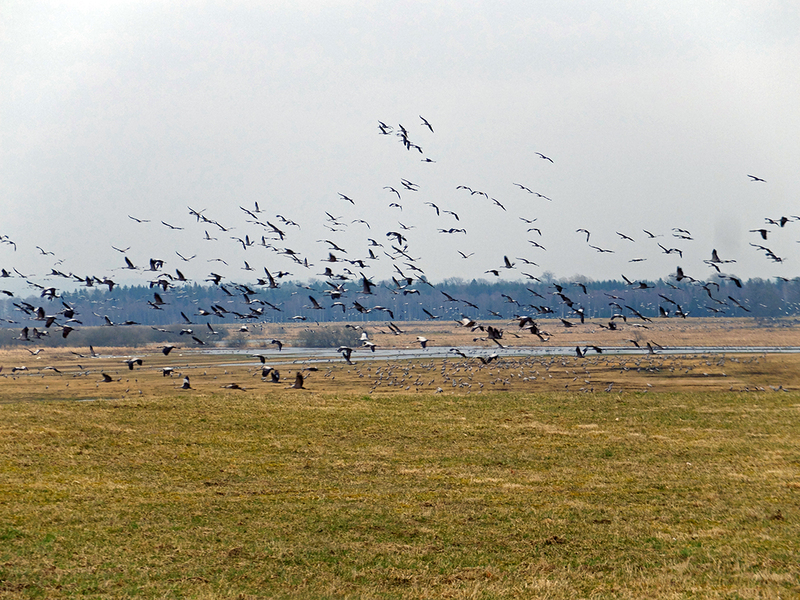 One of Sweden’s traditional signs of springs is the migration of the cranes. The cranes spend the winter in Spain and Morocco and migrate in early spring up through Continental Europe, making a last stop in Northern Germany before flying 500km in one day over the Baltic Sea to Southern Sweden. 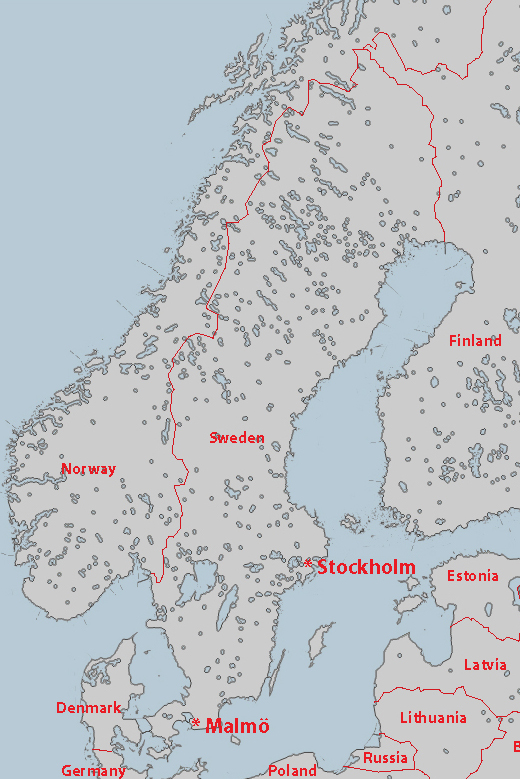 About of a third of Sweden’s 100,000 cranes rest at a particular shallow lake, Hornborgasjön, for a week or two on their way up into middle Sweden where they nest for the summer. 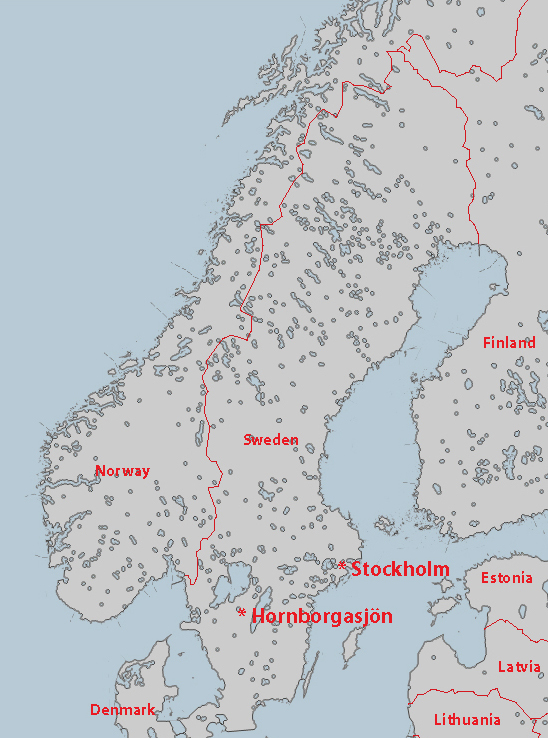 This migration route is probably pretty ancient but the big, concentrated gathering at Hornborgasjön can be dated to the mid 1800’s when the fields surrounding the shallow lake began to be used for vodka potato crops. The cranes were attracted to the nutrient-rich leftover potatoes that were easy for them to find and dig up, and they began to concentrate in large numbers at the lake. Somewhere in the mid 1900’s, the potato fields were converted into grain fields and the cranes lost their convenient food source. Out of ingrained habit, they still stopped at Hornborgasjön, but instead of leftover potatoes, they began to eat the budding grain crops. This was of course terrible for the local farmers, so the government started purposefully feeding the cranes on the shores of the lake. The cranes now mostly ignore the budding fields and converge at the lake every spring, creating a win-win situation where the farmers don’t lose their crops to the crane hordes and the local economy gets a huge tourism boost from the 150,000 bird enthusiasts that converge to watch up to 25,000 cranes congregate. 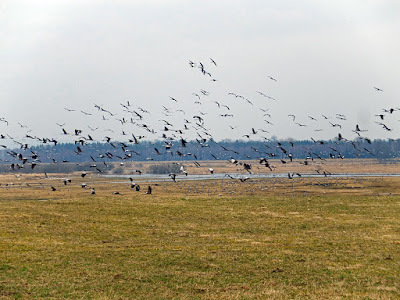 At first I thought it was really strange and unauthentic that the cranes migrate to this particular spot due to the government feeding them, but then I realized that the concentrated crane gathering wasn’t a natural phenomenon to begin with as it had been originally encouraged by the potato farms. Today’s feeding frenzy is the continuation of a 150-year-long human intervention and is an interesting part of the cultural landscape vs. natural landscape debate that pops up in so many contexts in Sweden. Carl and I had made plans to see the cranes a few years ago, but the date coincided with a small terrorist attack in downtown Stockholm and we were unable to leave the city. But this year, we finally made it out of the city and drove about 4 ½ hours south from Stockholm to witness the crane phenomenon. 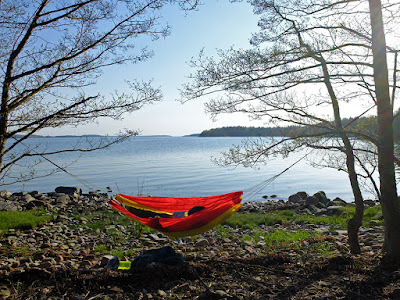 We tented in a nearby campground and spent all of Saturday watching the cranes and doing a couple of hikes around the Hornborgasjön nature reserve. I was prepared to see impressive numbers of cranes, but one thing that surprised me was their sound. Their call is like a purring goose honk and it made me both laugh and smile. We were also entranced by the crane dance where a pair of cranes will impress each other by bowing, hopping, flapping, and trumpeting in an ancient choreographed sequence. We were lucky to witness several pairs of cranes dancing at different points throughout the day. Cranes flying toward the water in the evening. They feed on land all day then sleep in the water where they are out of range from predators. The lake doesn’t just attract cranes—it is a popular migration stop for many species and there are large numbers of permanent populations, too. A few hundred song swans were also enjoying the free lunch. 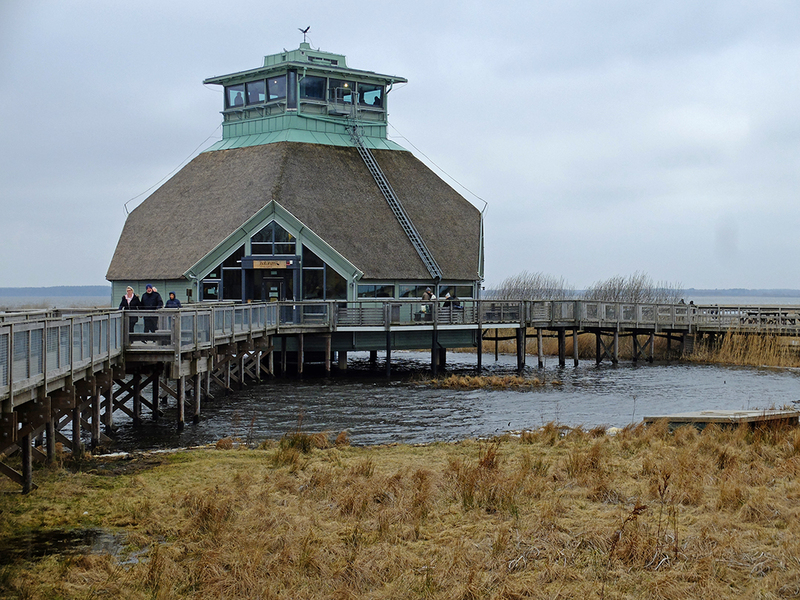 The nature reserve has a couple of visitor’s centers with good viewing points, miles of trails and boardwalks, and a number of bird hides for more intimate observation. We did a couple of short hikes around two very windy peninsulas and then did a longer hike uphill away from the lake through a gorgeous cultural landscape of ancient farms. Stone walls, small fields, towering oaks, and medieval-looking farm buildings have somehow survived the onslaught of modern, large-scaled farming techniques, creating a gorgeous patchwork landscape of rolling fields and forests. Saturday had been overcast but when Sunday dawned sunny, we decided to go back to the crane observation points to see if they behave differently when it’s sunny out. They seemed to have about the same behaviors—lots of eating, some flapping territorial disputes, a bit of pair dancing—so we moseyed on to the cloister part of our trip. One of Sweden’s earliest, most important monasteries and an equally historic and significant convent are both close by the crane lake. There are a lot of historical similarities between the two institutions. 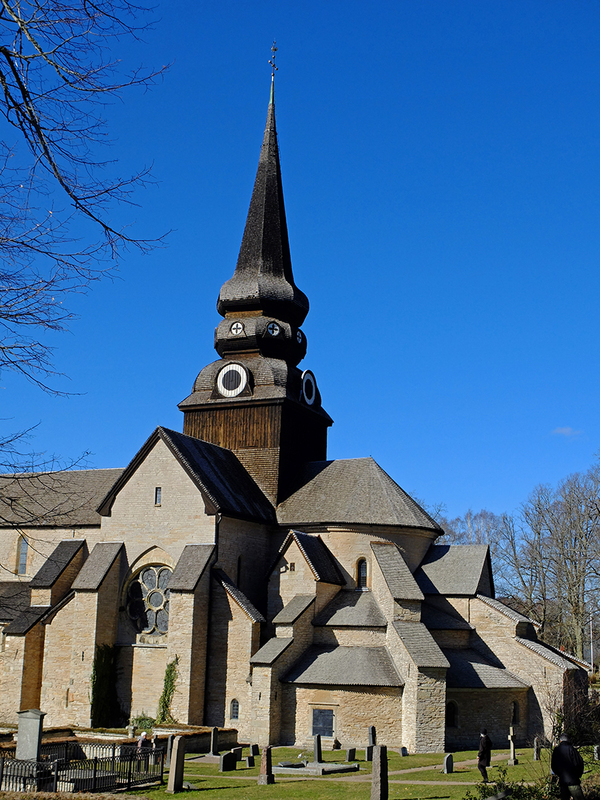 The Varnhem monastery was founded in 1150 at the estate of a noble family. There was already a small stone church, probably built by the family and serving the estate, when the matriarch Sigrid donated the estate to the church much to the family’s chagrin. 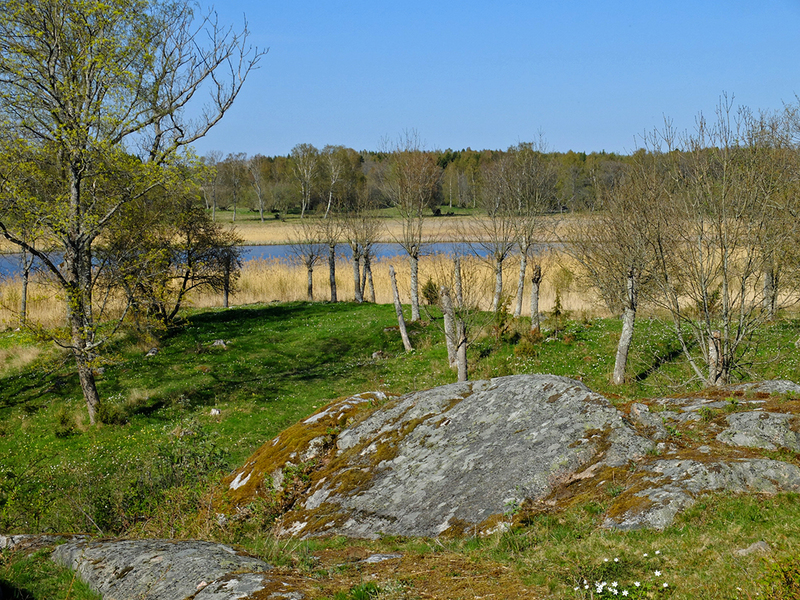 The landscape around Varnhem is still pastoral. The family proceeded to torment the monks to such a degree that they were forced to vacate the property for a few years. But new donations of land made it possible for the church to build a large monastery and church at Varnhem, and the small family chapel eventually fell into disuse and collapse. Varnhem. The monastery ruin consists of low stone walls. Varnhem was clearly an important political and religious site as several of Sweden’s earliest and most important kings are buried in the church. 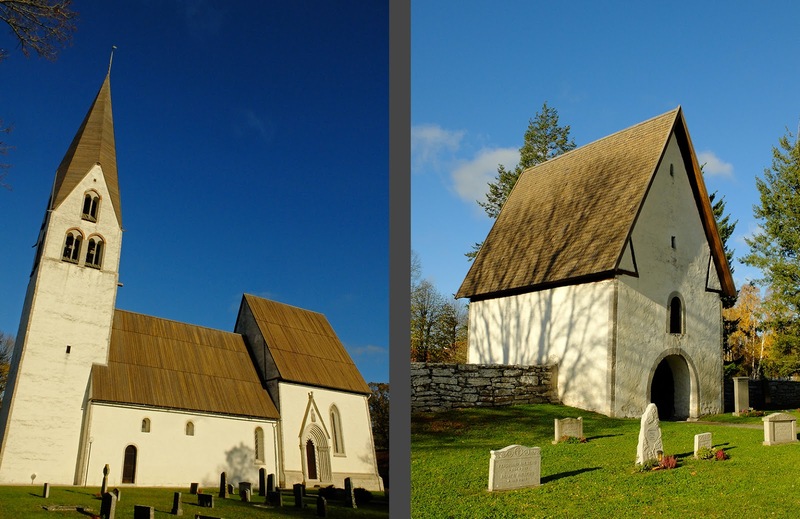 But there’s actually very little medieval written material mentioning Varnhem so we don’t even know that much about the various building phases, but the church’s current appearance dates to about 1260. After the Reformation, the state took control over all church property and the monastery closed. The monastery was burned by the Danes in one of their many attacks on the region, but the church was kept in repair because it continued to serve as the parish church. 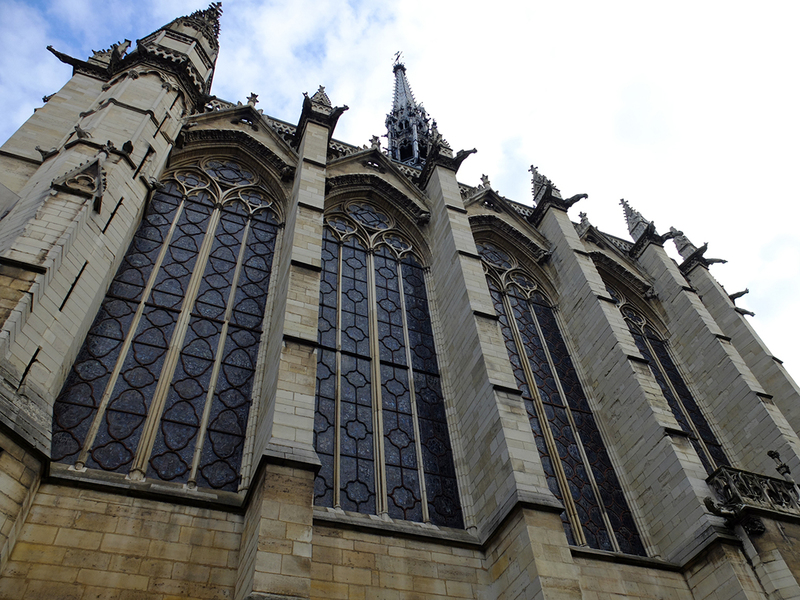 Varnhem is a very beefy church with none of the light, soaring, airiness of its Gothic role models in France. 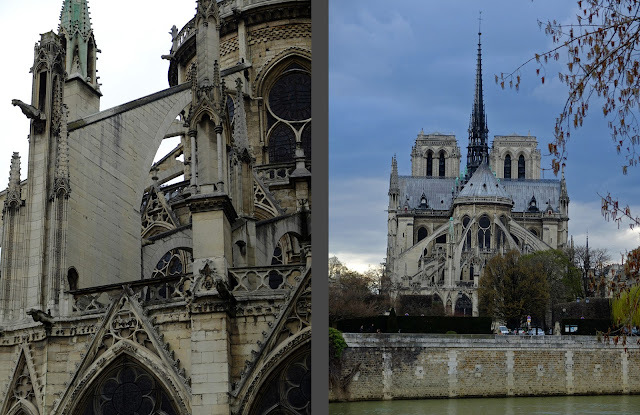 There is nothing “flying” about its buttresses, and the chapels and buttresses radiating around the apse are so chunky that they almost create an architectural style of their own. Gudhem was founded as the “daughter” convent to Varnhem in 1170 at the site of an ancient kungsgård or “King’s farm.” Before the monarchy settled in one capitol city, they constantly moved around to their various estates to keep tabs on the political situation, collect taxes, and so on. Gudhem, as one of these ancient seats of the monarchy, was a politically important location just as Varnhem had been. The siting of Gudhem and Varnhem shows that these medieval church institutions were extremely powerful, wealthy, and important. Which is precisely why Gustav Vasa put a stop to them in 1527 with the Reformation. Gudhem church and convent church ruin. A pretty cool gravestone from 1638 in the church. Like Varnhem, Gudhem’s convent used the existing Romanesque estate church until 1250 when the convent received a large donation from Queen Katarina and a large convent building and convent church were built. Because the nuns were supposed to be sequestered away, the local village continued to use the older parish church. 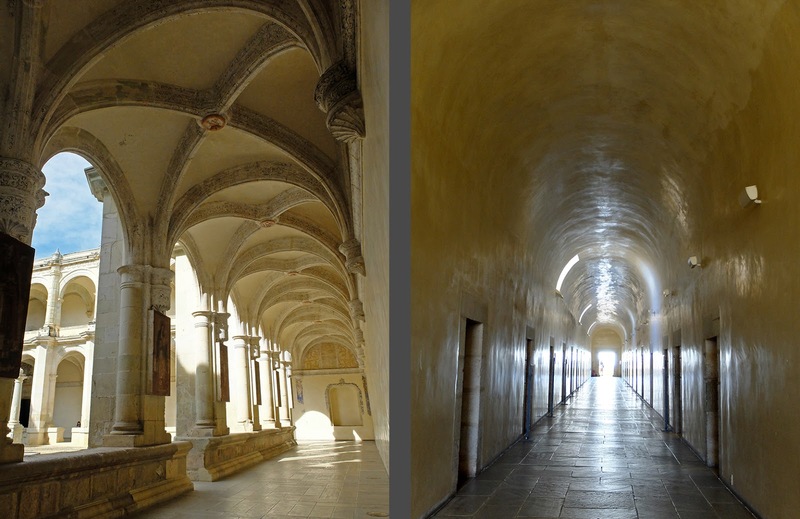 After the Reformation, the convent and convent church were left to decay and the parish church continued to be used. 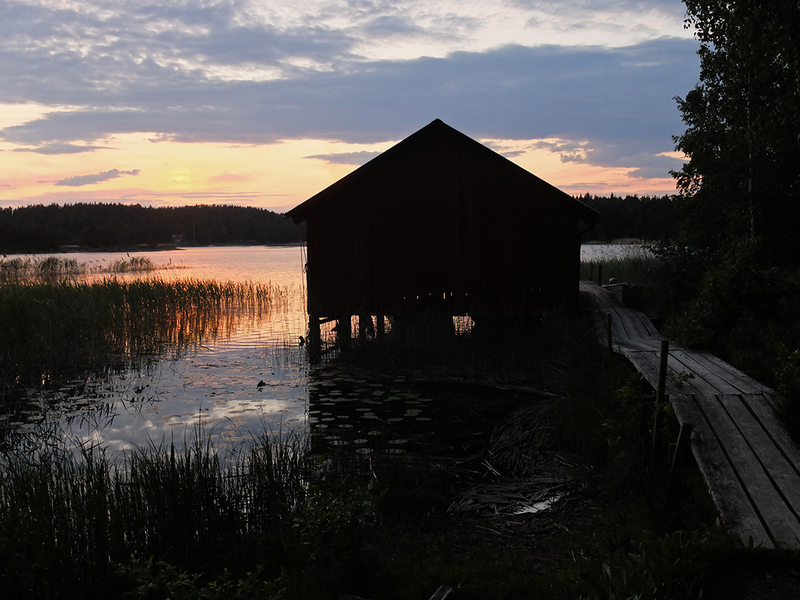 The area around Hornborgasjön is a truly ancient cultural landscape and 10,000 year-old relics of human habitation have been found at a couple of sites around the lake. More visible to the tourist eye are the burial monuments at Ekornavallen, an archeological site just upriver from the lake. Here, different types of burial monuments span from 5,000 years ago to about 1,000 years ago. The four Stone Age passage tombs with their gigantic slab construction were the most impressive and intriguing. The slabs weighed 15 tons and held the remains of several (usually 10-50) people. and the Iron Age was represented by a series of stone circles and standing stones. 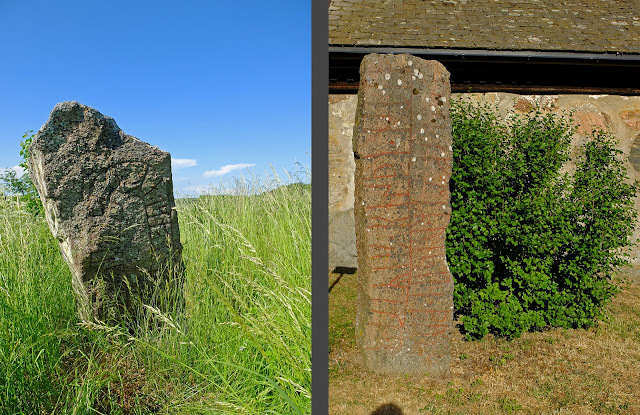 These standing stones were also constructed of gigantic slabs, but these stones were probably pilfered from the Stone Age tombs. In addition to the age and size of the monuments at the site, I was also fascinated by the 4,000 year long continuity of using this same site for ritual burials and impressive grave monuments. I was almost surprised that the area’s first church or the monastery wasn’t placed at Ekornavallen to stamp out the pagan tradition. Our weekend was all too short and before we knew it, it was time to start our drive back to Stockholm and our lonely cat. The area around Hornborgasjön is beautiful and fascinating and littered with Stone Age and Medieval monuments, far too many to see in one too-short weekend. Good thing we’ll be back for a long weekend later this spring! In an effort to cement my backcountry skiing skills, Carl and I went on not one but two big ski trips with UCPA this year. 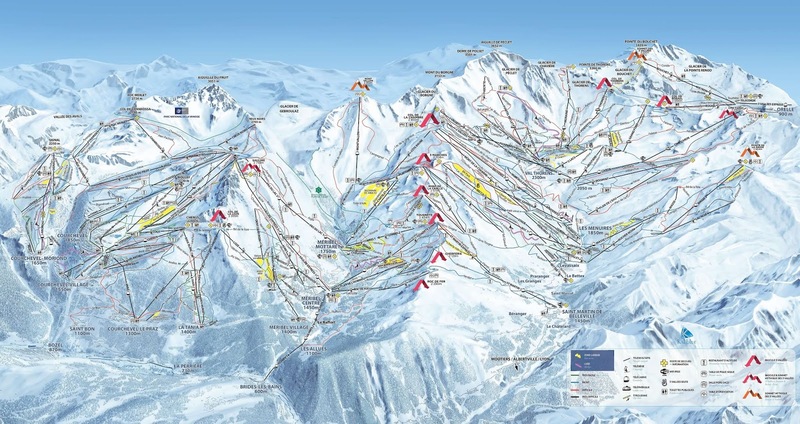 First to La Plagne (below) and most recently to Val Thorens, both in France. 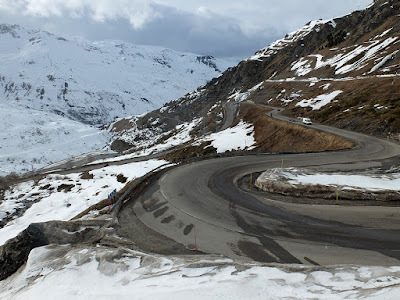 We have been to Val Thorens before but my experience the previous time had been a bit mixed. This time, my instructor was amazing and I had a really great experience despite less-than perfect weather. I’ve also made some progress in my backcountry skiing, though not quite as much as I had hoped. Val Thorens, not the world's most charming ski village, but the pistes through town sure are handy. Our first day of skiing was just Carl and I before the group lessons began. The visibility was terrible, the snow was wet and heavy, and the slopes were bumpy. In the middle of our first run, I nearly burst into tears thinking that I had forgotten how to ski. My legs were tensed in pain and my form was awful and I was having trouble on a relatively easy slope. Carl was doing better than I was, but he was also struggling more than usual. So we decided that it was high time for a cappuccino. The plus side to the warm weather (and the wet, heavy snow) was that we could comfortably sit outside, enjoy our caffeine, and look at the craggy peaks around us. After our break, we both relaxed, skied much better, and had TONS of fun. We still couldn’t see the contours of the slope very well, but I managed to let go and just trust myself. It worked, and I floated down the slopes again and again and again with a huge smile on my face. We were having so much fun that we didn’t stop for lunch until 2 p.m.. We treated ourselves to an incredibly tasty, gourmet French lunch. Carl had the best leg of lamb ever and I tried a “cheese box” which amounted to an entire wheel of cheese in its original wooden box roasted in the oven to gooey perfection. 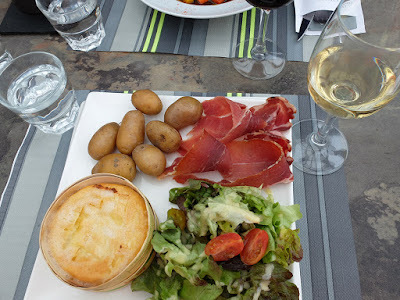 It was served with bread, potatoes, and different kinds of prosciutto to dip into the cheese, much like fondue except without the wine in the cheese. The combination of the melty cheese with the prosciutto was heavenly. Our waiter even paired perfect wines with our meal. We sat and enjoyed our meal for so long that we didn’t really feel the wine by the time we got back on skis, but considering the long week ahead and the late hour, we began the journey back to the UCPA center anyway. The next day, Monday, the visibility was even worse as it was snowing quite a bit. Despite the bad visibility, I was glad that it was snowing because the snow hadn’t been super impressive when we arrived—there was a good bit of bare ground visible on the sunny side of the valley. Our “test” to make sure that my groupmates and I were worthy of the backcountry group was to ski a black mogul run with no visibility. I skied quite slowly and it certainly wasn’t my best performance, but I was deemed worthy anyway. We spent the morning “off-piste” but beside the piste. After lunch, the winds were so strong that the resort closed. Tuesday dawned clear and beautiful, but the avalanche risk was very high. This time it wasn’t the visibility, but the avalanche risk that kept us fairly close to the slopes. 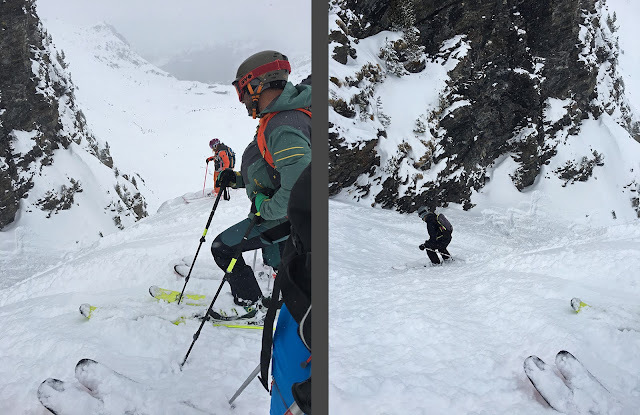 We even watched a crazy off-piste skier set off a thankfully small avalanche—if it had been any bigger, it could have buried the three crazy skiers standing just under the danger zone as well as the several skiers on the mountain face. By the afternoon, the avalanche risk had diminished somewhat (the avalanches that were most likely to start had already started). 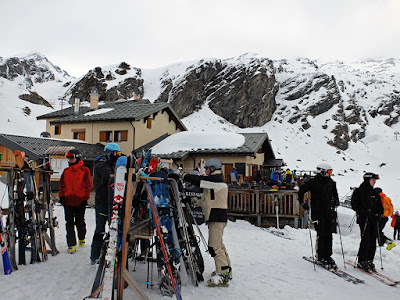 We had a lovely, long lunch sitting on our skis in the sun overlooking the mountains, and then skirted around the mountain to a little-skied face. 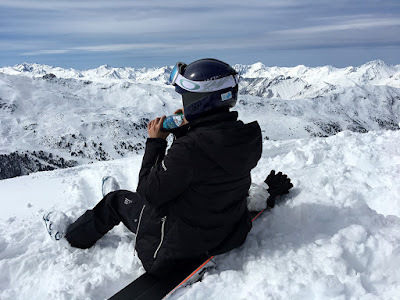 I re-discovered that I do pretty darn well skiing off-piste on steeper slopes, but that I struggle more on the gentler parts where I ski too slowly. After this long run, we took a lift up on the other side of the valley and could see exactly where we had skied from the top of the ridge down to the lift station, more than 1000 meters in height. Super cool! On my birthday, we awoke to 30cm of new, fluffy snow and perfect visibility. What a birthday present! 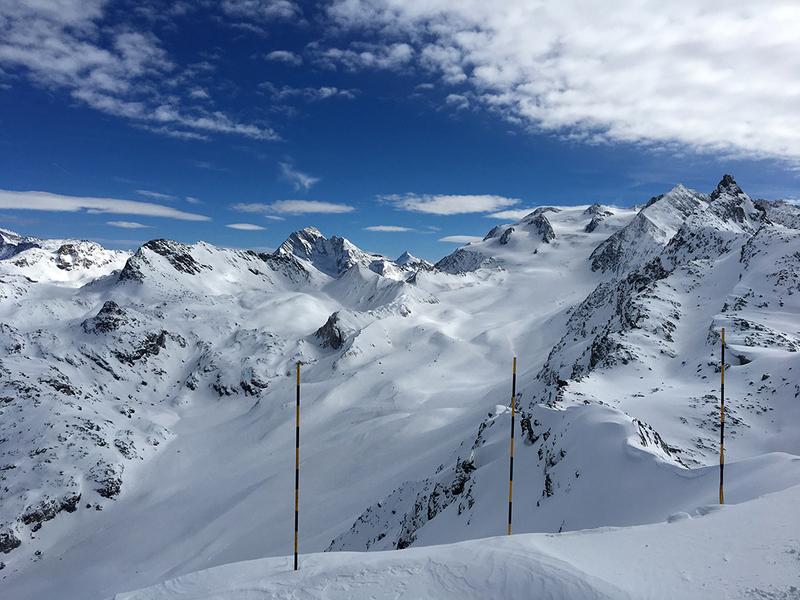 We were finally able to ski way, way off-piste and our guide took us on an fantastic, un-skied route from one of the area’s highest ridges down into the lowest stretch of valley. The off-piste conditions were perfect, and for once, I skied really well. For the first time, I experienced how effortless powder skiing can be when your technique is right and when the snow is perfect. It was amazing! My good form and the perfect conditions didn’t last for forever, but that little taste let me finally understand what it is I’ve been striving for. And to know that I can, in fact, achieve my goal, with a little more work and a lot more just letting go and trusting my ability. Now I just have to get confident in less-than-perfect snow. At the top of the last run on my birthday, our guide reminded us that she knew exactly what we were all capable of, and that she wouldn’t take us anywhere that she didn’t absolutely know we could ski. It was a bit reassuring in a way, but her little speech also made me a bit nervous about what was coming. We were obviously headed toward a challenge. At the top of the slot canyon, me dropping into the slot. And in any of my previous off-piste groups, I probably would have panicked when we got to the top of the nearly vertical slot canyon that we were about to ski down. But I didn’t panic at all. I just dropped into the slot and took it one turn at a time. One turn, slow down, stop. One turn, slow down, stop. I was exhausted from all that stopping by the time I got down to where the slot opened up, but I was quite proud of myself for being so calm and for actually turning instead of just sliding down like some of my other groupmates. 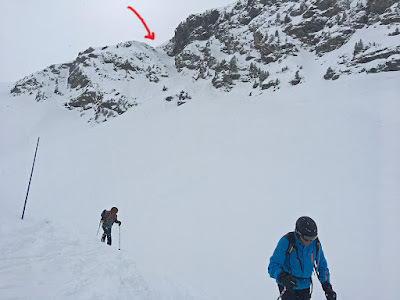 The red arrow points to the slot we skied down. On our last guided day, the conditions were extremely poor. It had snowed all night, so there was about 30cm new snow on the slopes. It was still snowing and blowing like crazy, but the temperatures were so warm that all that new snow was wet and extraordinarily heavy. Visibility was null—I have skied in a lot of bad visibility but this was a whole new level. In order to follow the group, you couldn’t let the person in front of you get more than a few feet ahead lest they disappear into the fog. The avalanche risk was back to being extremely high, and coupled with the extremely bad visibility, all off-piste groups were required to stay on-piste. My instructor said that we were unlikely to ever ski in worse snow, so it was perfectly natural if we weren’t at our best. I certainly wasn’t at my best, but I still managed, even on an ungroomed, black mogul run. We spent a good part of the afternoon doing an avalanche training exercise with Carl’s group. First, my group buried three backpacks with transceivers in the snow. We skied down a short ways and watched Carl’s group search for the bags with their transceivers. They quickly found two of the “victims,” but the third remained buried. After a while, it was apparent that the instructor had forgotten to turn on the transceiver in the third bag. Both groups lined up shoulder to shoulder with their probes and probed the snow in front of our left foot, in front of our right foot, and then in the middle. One step forward. Repeat. Repeat. Repeat. After at least a half hour, we found the bag. Having to do a probe line wasn’t our instructors’ intention, but it was a good exercise for finding victims without transceivers, and it was good advertising for always, always, double (triple) checking your transceiver. I really, really liked my instructor this trip. She was patient and kind, gave exactly the right amount and very personalized technique tips, and I always felt perfectly safe. Another factor that made the week so good was that my group was comprised of kind, patient souls. It felt good that I wasn’t the only person struggling here and there, and the more skilled group members were always helpful and kind to those of us that were a little less experienced and a little slower. The last half day of skiing was just Carl and I together without a guide. The day was gorgeous and sunny and we did a “ski safari,” visiting all of the highest point of the lift system and skiing down down down back into the valley and to the next lift over. I haven’t come quite as far in my backcountry skiing this year as I had hoped, but after our week in Val Thorens, I feel more confident that my ultimate goal is within reach. Next year, I think I’m going to return to an on-piste group to focus on improving some of my technique flaws before doing another backcountry group. As usual, Carl and I were disappointed in Stockholm’s snow this year. 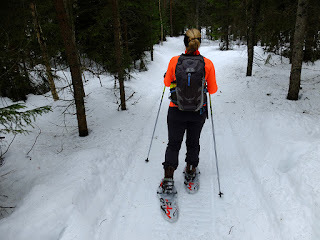 We did manage to go skiing on a lit trail after work one evening, but the snow didn’t stick around long enough for a longer jaunt on the weekend. 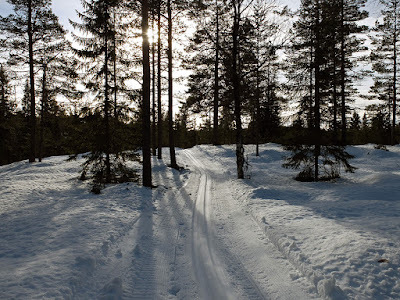 It’s now becoming a tradition for us to book a last minute cross country weekend up in Dalarna which is a couple hours north and inland from Stockholm and generally has much more reliable snow than the city. 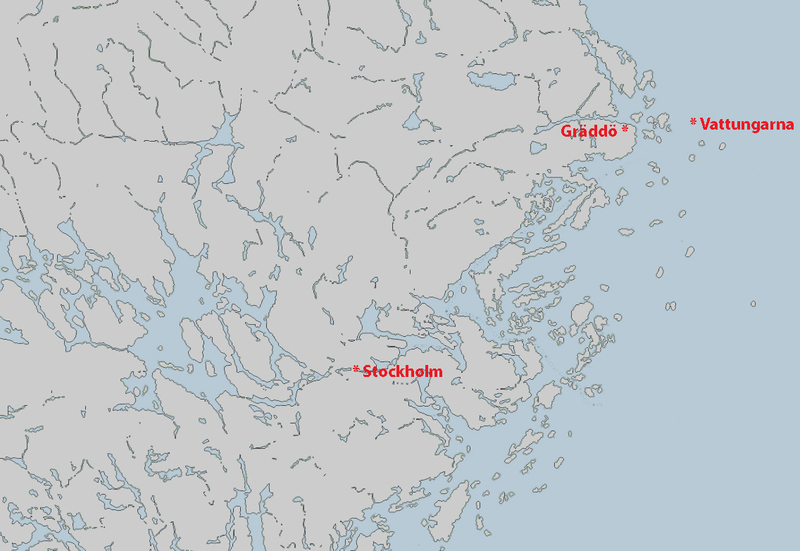 On our previous trips to Orsa and to Gyllenbergen, we rented a car in Stockholm and drove up after work. The distance isn’t all that far but on Sweden’s two-lane roads, in the snow, and in the dark, the drive up into the heart of Dalarna can be a long and exhausting journey. 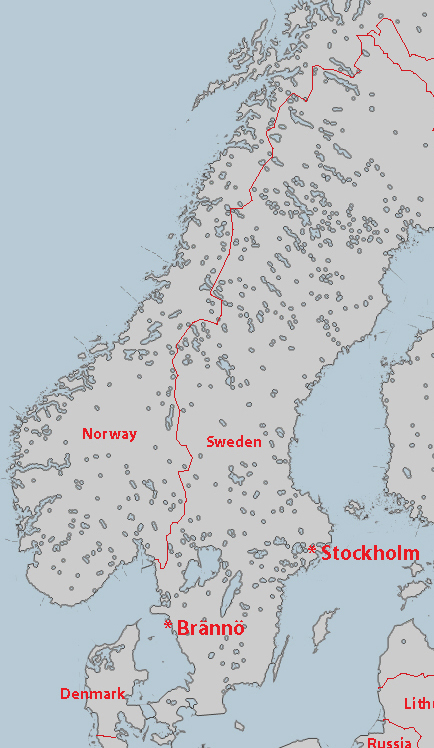 So this year, we took the train from Stockholm to Falun, and then rented a car from there. I had been a bit concerned that travelling on the train with our skis and then having to walk to the car rental would be annoying, but we chose the train station based on having a very convenient car rental place nearby, so the trip and transfer went quite smoothly. In the past, we’ve stayed at relatively inexpensive hostels (but with our own room), but this year, we chose a more luxurious route and rented a super cute little cabin at an extensive cross-country ski area. The cabin was practically ski-in-ski-out, but for cross-country! 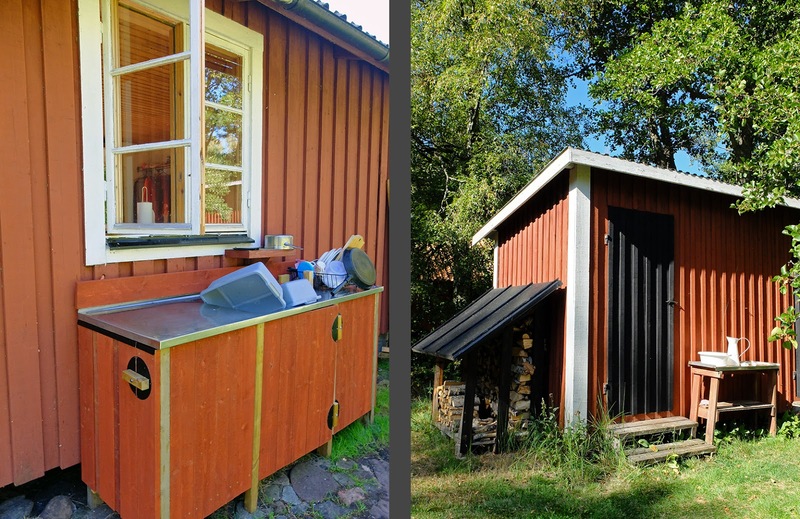 The cabin “hotel” at Sörskog consists of three small cabins, a kitchen/bath/sauna house, a woodshed, and a well-equipped room for waxing your skis. While the bathroom is separated from the cabins which isn’t super ideal, each cabin has its own WC and shower which was nice because you didn’t have to worry about all of the toilets being occupied. The interior of the cabin was traditional pine weekend cabin meets Scandinavian chic. It was really well done—evoking nostalgia without being too country or cutesy, while being a bit understated and chic without feeling cold or impersonal. Our cabin packed a lot of function into one room. There were four super cute built-in bunks with privacy curtains that were definitely inspired by Dalarna’s traditional built-in beds. The cabin also featured a small kitchen (no running water), a dining table, a desk, and our favorite, a wood-burning stove. The only thing missing was comfortable chairs for reading in front of the fire. We made do with the dining chairs but comfy reading chairs would have really made the cabin perfect. 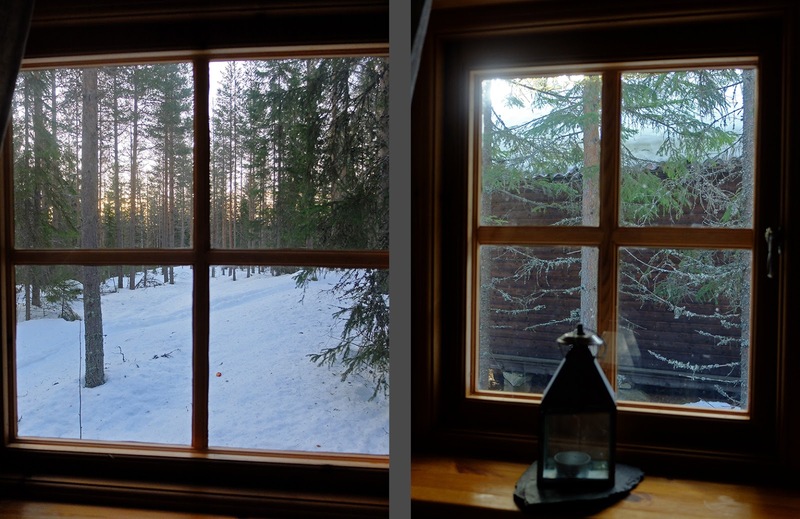 The cabin’s windows looked out into the snowy forest. It was such a beautiful scene and it really tugged at my heart. Maybe we should live in a little cabin in the snowy woods instead of in the middle of slushy Stockholm after all? 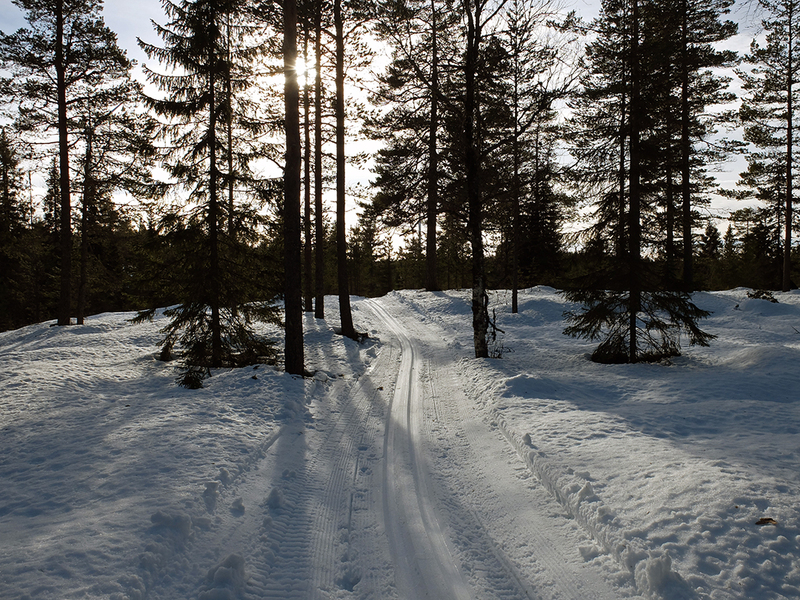 Unfortunately, even in Dalarna, even in February, the snow was unreliable this year. There was actually a good amount of snow on the ground (maybe about a meter or three feet) but it had been above freezing the week before we arrived. The warm temperatures made the cross-country trails extremely icy, and even the slightest of downhills felt like an Olympic bobsled track. I took my skis off and walked down a couple of the hills because I was just too nervous to risk flying down the hills with no way of controlling my speed or stopping. Another downside to our trip was that I came down with a cold the day before we left town. I managed to have fun skiing, but I was definitely not skiing on a full tank and I was too exhausted at the end of the day to fully enjoy our cute cabin and the cozy wood stove. I was in bed by 8:30! But despite the icy conditions and my cold, we had a lovely weekend of skiing. The first day, we set out on an 18km trail but cut the day short at 13km because the trail was just so icy and impossible, and because it started to rain. The trail climbed up a couple of low mountaintops, and at one peak we stopped in a little wind shelter for fika with coffee and tea. At the next peak, we skied a good bit off the trail to reach an open meadow with a bit of a view down into the valley and the next mountainside over. We tramped down a well for our feet and then sat on our skis for lunch. Toward the end of our lunch break, it started to rain, so we skedaddled back toward the cabin. I put forest in quotation marks because it was a tree plantation, but one area was actually relatively old, diverse, and forest-feeling. We snowshoed a couple of kilometers to a historic fabod or shieling area (summer grazing area) which is now converted into somewhat modernized summer cabins. Each cabin could sign up for a private sauna time, so we enjoyed the wood-heated sauna for about an hour before starting dinner. Such luxury! I’m still not suuuper into saunas, but the warmth is lovely up to a point, until I start getting sweaty. Carl stayed in much longer than me. On Sunday, we learned our lesson from the previous day and stayed down in the valleys and on a very flat trail which looped around a series of bogs. The loop was about 5 km long and we went around and around. After two loops, we stopped a bit off the trail and had fika in a little shelter with a bench conveniently placed in the sun. After a third loop, the shelter was no longer in the sun, so we sat at the edge of the trail on our skis and enjoyed another fika in the sun. Carl kept skiing for another couple of hours but with my cold, my body was just done. I headed back to the cabin, got the fire going again, and read sitting up in my bunk while enjoying the sun flooding in through the window onto my bed. It was just lovely. One of the perks with this particular “hotel” was that checkout on Sundays isn’t until 5 p.m., so we could keep our home base intact on the last day. It was perfect for my lounging while Carl skied, and it was very nice to be able to change out of our sweaty ski clothes before driving back to Falun and sitting on the train. 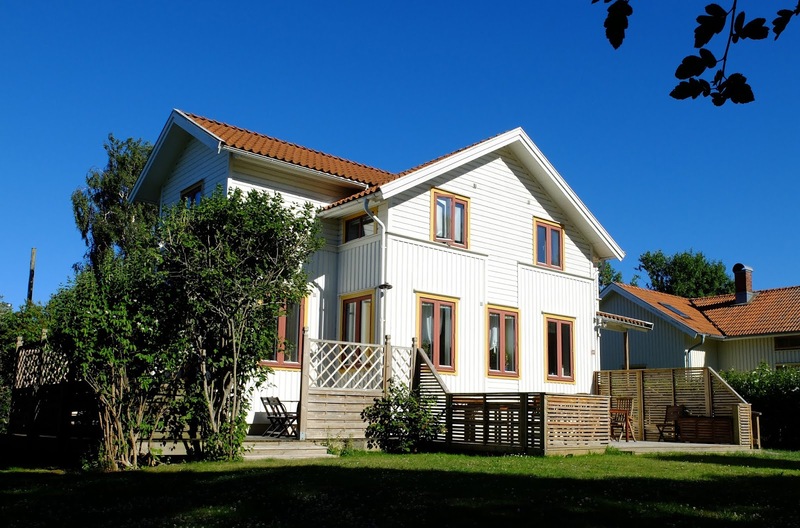 There’s not a whole lot to the village of Sörskog except for a couple of farms and the popular cross-country ski area. I’m not 100% sure what the legal framework is, but it seems like the local landowners lease (or sold?) land to an energy company who built a few wind turbines in the area. The cross-country trails are maintained and groomed by a local volunteer organization, but I think that the energy company contributes the money to keep the volunteer organization running—snowmobiles, gas, and signage certainly aren’t free and it’s hard to believe that the tiny community of Sörskog has enough resources for the impressive endeavor. 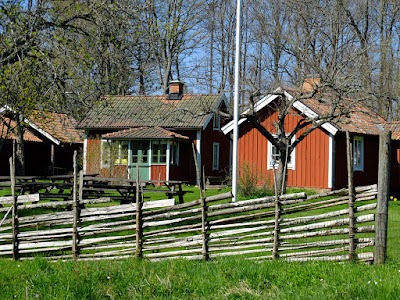 Left: A farmhouse in the village of Sörskog. Right: One of the area's wind turbines. In a culture that doesn’t even have its own word for volunteer (the English word has been Swedish-ized into voluntär) there sure are a whole lot of people who freely give their time to maintain the thousands upon thousands of kilometers of cross-country trails around Sweden. Thank you volunteers! Oh the Alps. Such beauty. Such copious, fluffy snow! Such delightful cheese! Carl and I totally lucked out with our UCPA trip to La Plagne (pronounced, approximately, La Pluh) as it snowed a lot right before and at the very beginning of our trip. We then spent the rest of the trip skiing through a minimum of half a meter fresh, fluffy, mostly untouched powder. It was magical snow! La Plagne is known as a family-friendly ski resort because its slopes are relatively easy—a black slope here is like a red slope or even a steeper blue slope in most other resorts. Skiing on the groomed slopes for a week wouldn’t have been the most entertaining skiing ever, but the groomed slopes were plenty of fun for the two days we spent on-piste. But the secret of La Plagne is the backcountry, off-piste skiing. Because of is unchallenging reputation, most backcountry skiers skip the resort entirely. 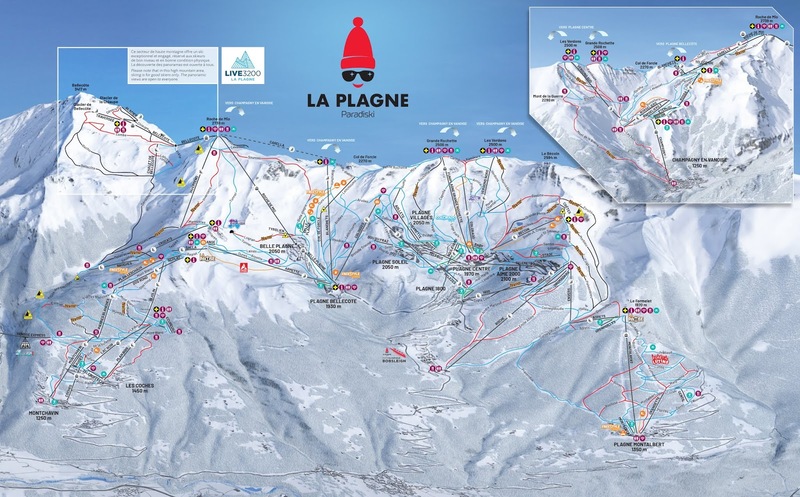 This means that unlike other, more popular backcountry resorts, La Plagne’s powder remains untouched for days on end, and there are plenty of challenging off-piste routes to keep a skier entertained for at least a week. 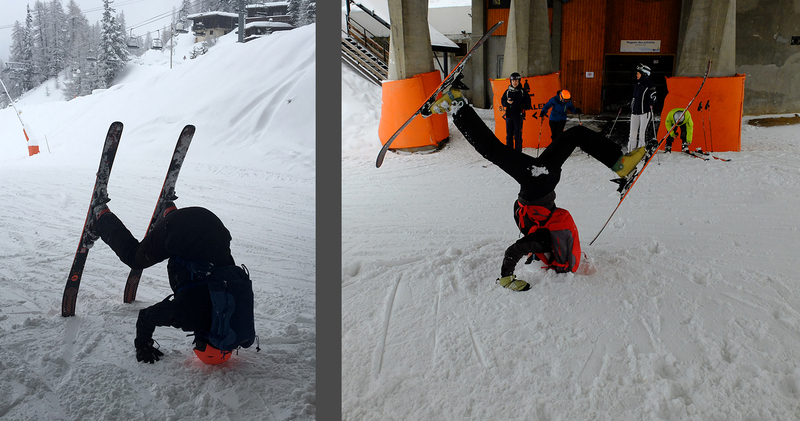 My off-piste skills are slowly improving but I’m still not totally up to speed. I get scared, and exhausted, and I need to keep working on my form. I definitely improved over the week, but I definitely have a ways to go before I’m confidently swishing down the mountainsides, especially when the terrain is really uneven. Ironically, I ski much better when the slope is steep than when it flattens out, I think because the speed of the steeper slopes forces me to have better form. I can’t say that the skiing was easy, but the few times I really got it right, it was pretty darn blissful to bounce-turn in all that fluffy snow. One particularly memorably scary run involved skiing down a knife’s ridge. Because the ridge was bumpy and went both up and down, you had to keep up enough speed to make it up the next hump. After the ridge, we had to edge along a cliff contour. That part of the track was icy and very fast, and I was absolutely terrified the entire time. After the cliff face, we then had to climb for about 15 minutes, side stepping up the steep mountainside to make it over a small pass. The long, untouched run on the other side would have been absolutely magical, but I was too exhausted from the fright and from the climb to enjoy it. I really need to get over my fear of heights and get in better shape to be able to enjoy these magical runs! The avalanche risk was high a few of the days of our trip, so we had to stay down lower, taking advantage of the protection of the forest. 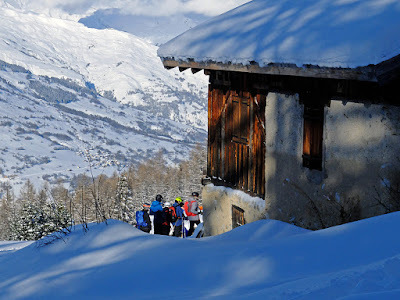 One day, we started at 2740 meters (well above treeline actually) and skied all the way down to about 800m over a series of Alp farms, past ancient farm buildings, and through the gorgeous, idyllic landscape. We skied down much farther than the lowest lift, so UCPA arranged a bus to take us back up to the center. Tragically, a ski patroller with 40 years of experience died in an avalanche during our stay in La Plagne. He and a co-worker were patrolling the same backcountry area that we had skied two days before when they were caught in an avalanche. One patroller managed to float up during the avalanche with his air bag, but the other patroller was caught under the snow. The safe patroller called a helicopter rescue, found his companion using their transceivers, and managed to dig him out while he was still alive. But tragically the patroller died, probably of internal injuries, after arriving at the hospital. Even very trained, very experienced, and very prepared skiers can get caught unawares. It was just so sad. As usual, my group was super friendly and I really enjoyed getting to know my groupmates who were about half and half French and Swedish with one Englishman mixed in. When I was struggling the most, my groupmates were extraordinarily helpful and patient. In an effort to conserve and maximize my skiing energy, I didn’t participate in much apres-ski this year. I probably would have been more tempted if the temperatures were higher, but hanging out on cold, crowded patios drinking beer just wasn’t super enticing this time around. On the last day with our backcountry guide, my group ate lunch at a super cute cabin that had once been a farm building and was somewhat recently converted into a restaurant. All the cheese served in the restaurant is still produced on site. Our guide had ordered a traditional dish for the group ahead of time—it was like a potato gratin but the potatoes aren’t cooked ahead of time; instead, they’re in the oven for several hours until cooked soft in the cheese and butter. So delicious! 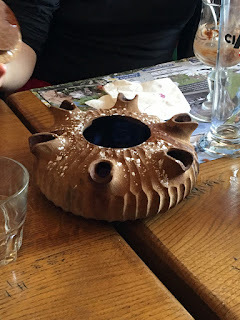 For desert, we shared a traditional desert drink of spiked coffee. The liquor is partly burned off, then the flame is blown out. It is served in a communal pot with six spouts, and the pot is passed around until empty. 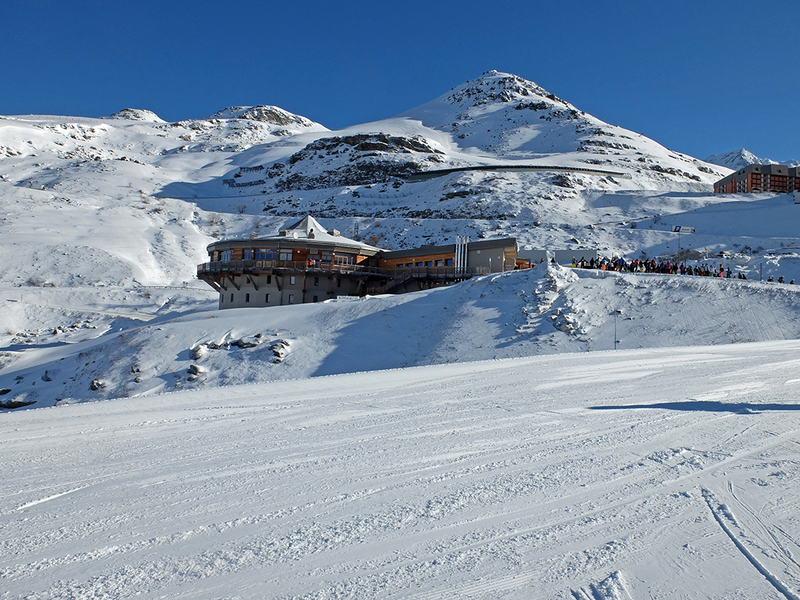 Hotels don’t get anymore ski-in-ski-out than the UCPA center at La Plagne—the piste literally runs through the building! Suuuper convenient! The rooms at La Plagne were basic but clean and recently renovated, and featured incredible views of the surrounding peaks including Mont Blanc! As usual, Carl and I strung up a drying line across the room—otherwise we would have had very wet (and cold) ski clothes. Even though the week was pretty cold with daytime temperatures down to -15 degrees C (5 degrees F), the backcountry skiing was such hard work that I was dripping sweat most of the week. The food at La Plagne’s UCPA center was edible, but not amazing, although the cheese buffet may have been the best UCPA cheese buffet yet, and that’s saying a lot! As usual, my UCPA experience was a bit mixed. As always, I pushed myself to the limit and was disappointed at not making as much progress as I had hoped. But as always, I did actually improve, and some of the runs were just magnificent. and exploring the charming city on foot. We also got reacquainted with her lively, colorful neighborhood walking the dog several times a day. One afternoon, we took a taxi out to a warm spring and bathed in the beautifully landscaped gardens. The city was bursting with hibiscus, bougainvillea, and other tropical flowers, and even though it was winter, the city was surprisingly green and verdant. One of the most interesting aspects of San Miguel is its stark contrasts, not least of which is the contrast between the dry, nearly desert landscape with the rich, verdant watersheds. 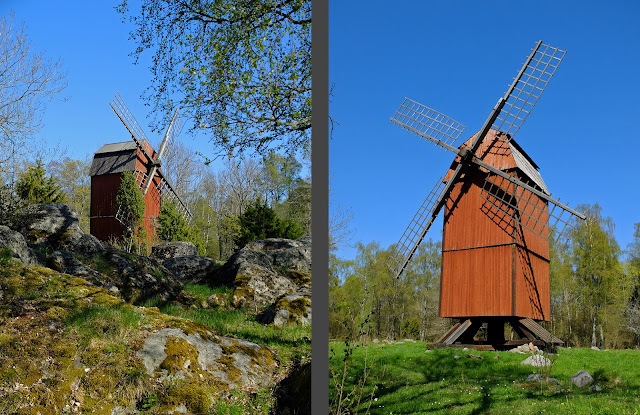 These two scenes are within a mile's walk from each other. I’m really not one for beach vacations and I usually prefer snow over sun when choosing vacation destinations, but I have to admit that hanging out in San Miguel’s not-too-hot-not-too-cold sunshine was a good tonic for feeling cooped up in the office working long hours for most of the fall. And San Miguel de Allende is a lovely not-too-big-not-too-small city. Its colonial architecture is feast for the architectural eye, and I’m always super intrigued by what lies behind the magnificent walls. 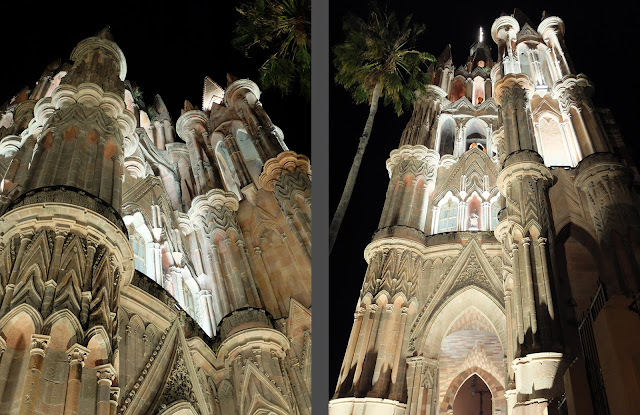 We’ve never been in San Miguel for Christmas and we spent a couple of evenings walking around, looking at the lights and lit up churches. There is nothing lagom (moderate) about the central jardin square and all its fairy lights and glowing stars. Although we’ve visited all of San Miguel’s churches before, we did another round to see the various gaudy creche scenes. The disco-lit Jesuses were a bit much for my taste, but I did find a couple of quieter corners that caught my eye. Carl and I then flew down to Oaxaca for the second week of our trip. 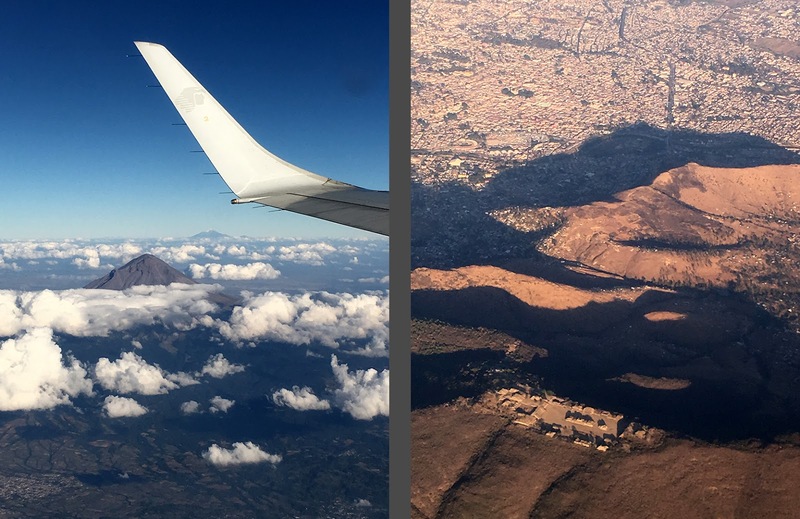 The sky and views back to earth were unusually clear and after leaving the ginormous Mexico City, we flew amongst volcanoes. On the approach into Oaxaca, we flew right by and had clear views of Monte Alban, the mountaintop archeological site that was the main impetus for our trip to Oaxaca. Oaxaca City, capitol of the state of Oaxaca, is fairly large and seemingly relatively prosperous. 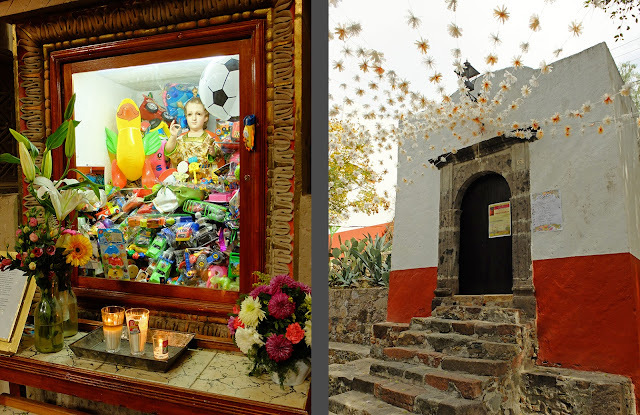 The colonial center is colorful and charming, but it’s not quite as dense or as perfect as San Miguel. The city is surrounded by nearby mountains and many street perspectives are capped by these towering mountainsides. The central Zocalo is very lively and is filled with absolutely huge trees as well as a bewildering density of street vendors and pedestrians. Around New Year’s the city was chock-full of tourists (a good number of Americans and a sprinkling of Germans but most of the tourists were Mexicans) and it was difficult to get a table at restaurants, but the crowds died down a day or two into 2019 and it soon felt like we practically had the city to ourselves. Because we booked our trip so late, we couldn’t find a decent hotel with a room available the whole week, so we ended up staying in two different places. Each had its charm, and both had lovely roof terraces. 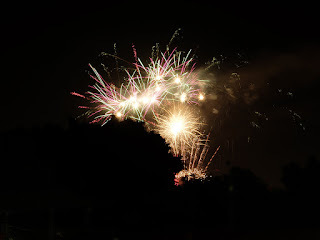 Roof terraces just might be my new favorite aspect of Mexico, and they sure are handy for watching New Year’s fireworks! I love being able to see the show without having to a) get out of my pajamas or b) stand around in a crowd. More proof of my true home-body nature. and I was particularly fascinated by the “portrait sculpture” on many of the church’s facades. One portrait sculpture was also partly a theater scene, complete with curtain! The interior of the city’s main monastery, Santo Domingo, is over-the-top with Baroque curlicues, but the cloisters (now a museum) were sober and contemplative. There’s a modern, artsy side to Oaxaca where colonial architecture meets simple, modern design. Some of the contrasts are just beautiful, and the level of handcraft is jealousy-inducing. The main impetus for our trip to Oaxaca was to visit Monte Alban, a Zapotec archeological site that was built in several phases over a millennium starting about 2500 years ago. 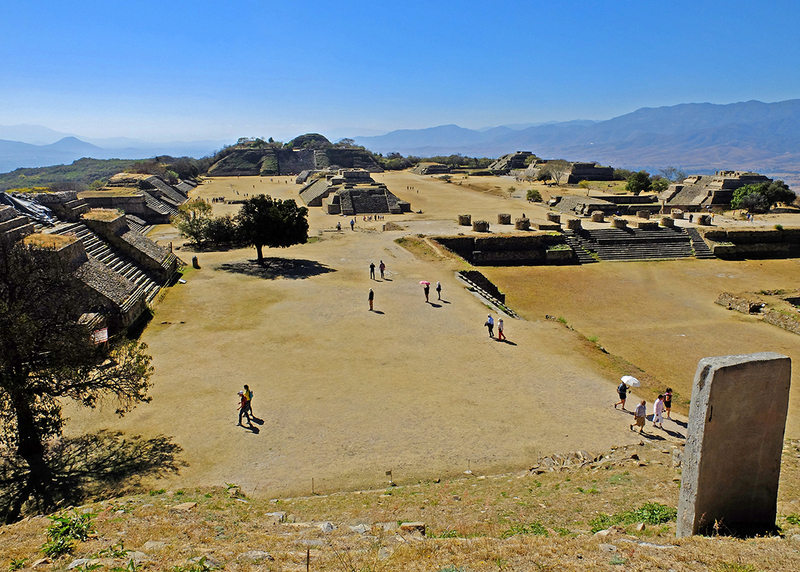 It’s hard to call Monte Alban a city, its function was more like a religious and political complex with controlled access and a calculated, designated route of moving through the site, a bit like the Acropolis. Commoners were most definitely not invited. There’s nothing practical about the siting apart from strategic military surveillance of the surrounding valleys since there are no springs up there and all water had to be carried up the mountainside from the river at the bottom of the valley. There must have been hundreds of slaves dedicated to carrying water. 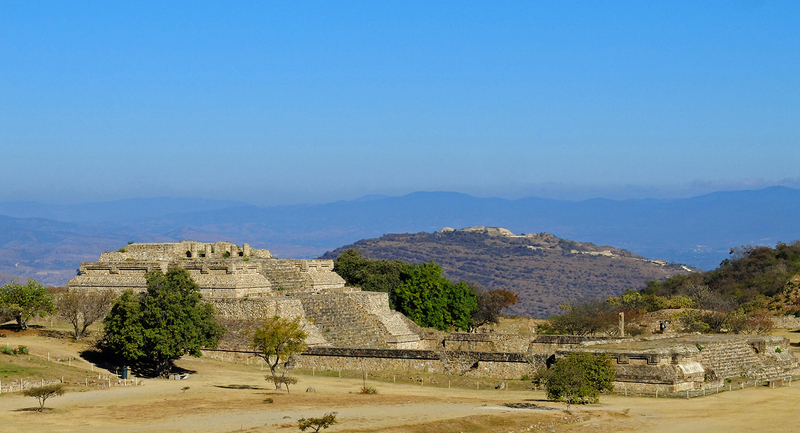 In no small feat of earthwork, the Zapotecs leveled an entire mountain ridge to create the central plaza. The scale of the site is even bigger than the photos make out, imagine that the central plaza is at least twice as big as it seems in my photos. A couple of small, obstinate rock outcroppings in the middle of the central plaza couldn’t be removed, so the Zapotecs built pyramids over the outcroppings to hide the imperfections. Otherwise, the plaza is perfectly flat. Archeologists have found evidence of a couple of small rain cisterns under the plaza, but based on the Mayan cities we visited in Guatemala, I am convinced that there is an entire network of cisterns under the plaza. The Zapotecs’ architectural ambitions were not punier than the earthworks, and they enclosed the entire plaza with a ring of pyramids. The pyramids vary in size but they form a constant foreground to the backdrop of the surrounding mountain ridges. The interplay of the manmade wall of pyramids against the natural mountain ridges is stunning—there is no mistaking the favorable comparison of Monte Alban’s creators to the creator of the natural world. The pyramids lining the long east and west sides of the plaza are relatively straightforward with a small pyramid facing the plaza, an enclosed private plaza behind the small pyramid, and a larger pyramid behind the enclosed plaza. The sequence of going up, down, and then up again in order to reach an objective (tomb, temple) was repeated over and over again throughout the complex. The pyramids at the north and south ends of the plaza were of a different character than the flanking pyramids. The northern and southern pyramids were comprised of entire complexes of pyramids with pyramids built on top of pyramids on top of pyramids; the different building phases spanned a thousand years. The northern pyramid was especially complex with at least seven or eight pyramids built in a jumble. All of the pyramids and structures were originally covered in lime stucco. I am unsure if the stucco here was mainly white or if it was multicolored and painted with friezes. The Zapotecs are known for the double scapular cornices that decorates many of Monte Alban’s pyramids; I was also intrigued by these circles which also popped up every now and then. The site is also known for its documentary stelae and carved stone slabs which are built into pyramid walls. The stelae are covered in hieroglyphics, but the slabs contain images of men, which according to the current interpretation, represent war captives with their intestines carved out. 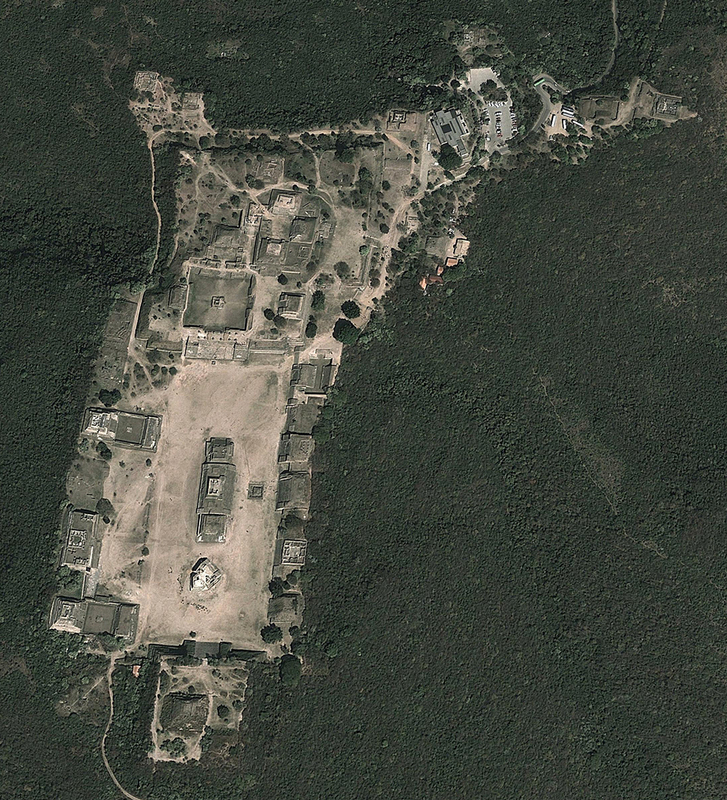 There’s a little-visited tomb in a remote corner of the archeological site. Later on our trip we actually saw more interesting tombs, but this one had a very special, intact roof with tilted stone slabs leaning against each other. Monte Alban was truly fascinating and mind-boggling, an incredible way to spend New Year’s Day. The city’s power began to wane around 1000 AD, giving room for some other amazing cities to rise up in the power vacuum. 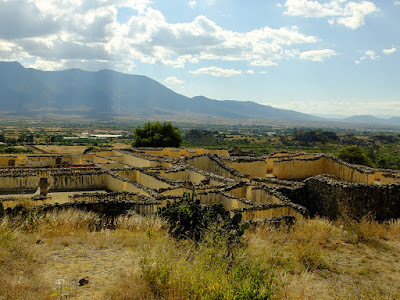 We had taken a tourist bus to Monte Alban, but the next day we were a bit braver and took a collective taxi to another of the valley’s towns, Mitla. Collective taxis are small cars that leave from designated sites around town, and the driver waits until all five seats are filled with paying passengers. Yes, five passengers. The unlucky fifth passenger gets to sit on a pillow on top of the emergency brake, which means that the driver can’t pull the brake if needed. More on that later… The collective taxi ride to Mitla took about 45 minutes at break-neck speeds and cost about $1.50 per person. Mitla is a small town living on its hand-weaving business and on tourists visiting the archeological site. I was particularly enthralled by the street decorations which provided some much needed shade over the dusty main street. While Mitla had been occupied for some time, it rose to prominence around 950 A.D. in the power vacuum left after the downfall of Monte Alban. 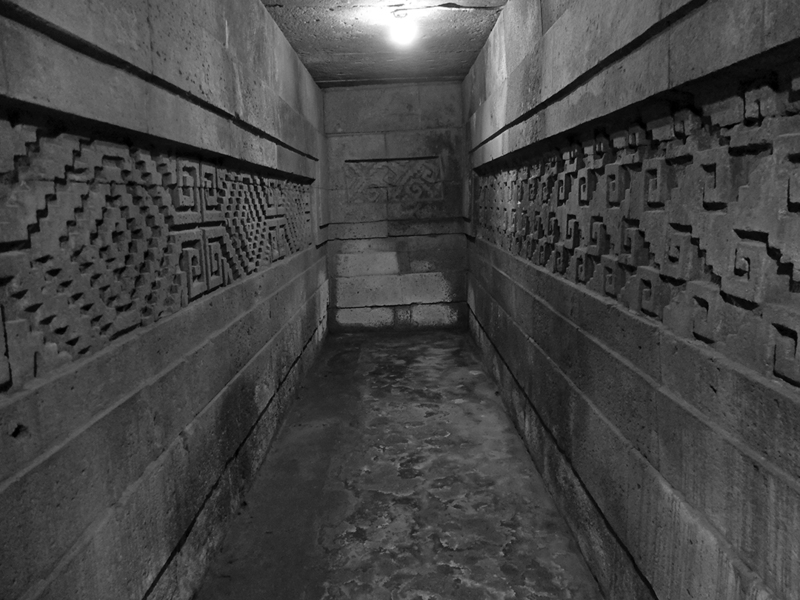 Mitla is known for its incredible fretwork which decorated the palaces and tombs inside and out. Originally, the frets were covered in colorful plaster, and tiny fragments of the original frescos are still visible today. Both Mitla’s parish church and a small chapel were built on top of Zapotec pyramids. While the parish church is an entire, new structure on top of an existing pyramid, this little chapel really does look like the original Zapotec temple was remodeled into a Catholic chapel. Another day, we braved the public bus for a $0.50, twenty minute ride to the small town of Zaachila. We timed the visit with Zaachila’s market day, but we were mostly interested in visiting the mostly un-excavated archeological site for its tombs. (The ancient city is unexcavated because most of the structures lie under and have been incorporated into modern homes, businesses, and churches.) But when we arrived, the tombs were locked, and no one was around to take our entrance fee and open them for us. We contented ourselves with walking around the market where you can buy everything from live turkeys, squirming worms (tasty snacks), dried grasshoppers (more tasty treats), woven baskets, pineapples and oranges, clothes and shoes, woven market bags, pig heads, pasties, toys, goldfish and canaries. I was fascinated by the fact that the lively, practically compulsory market is held on Thursdays . . . clearly very few Zaachilans work 9-5 in an office. Before heading back to the bus, we decided to give the tombs one more try and we were delighted to see that they were open! 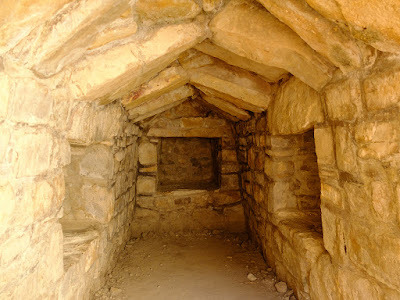 Zaachila was an important power center long after the Zapotecs fell and after the Mixtecs took control over the Oaxaca valley, and according to archeologists, its tombs are influenced by Mixtec design. They are known for the anthropomorphic symbols built into the walls above the tomb niches, especially the bat-god symbols (which to me seem extra appropriate for underground tombs). Yet another day we tried yet another transportation method and rented a car for the day. Carl drove and while getting in and out of Oaxaca City was a bit stressful, driving through the countryside was relatively painless. We drove out to Agua Hierva where the upland Oaxaca mountains begin their steep descent into the cloud forests and finally down to the Pacific Coast. Agua Hierva is a place where natural springs with extremely high mineral content dribble down the cliffs forming frozen waterfalls and even better yet, a series of natural infinity pools with thousand-foot drops and exquisite mountain views. The site was quite busy with tourists, but we were still able to enjoy the unique beauty of the pools and the soothing coolness of the water (one at a time, since we didn’t have anywhere to lock up our stuff). Our last day in the area, we took another collective taxi to the nearby town of Atzompa. Unfortunately, this collective taxi ride didn’t go as smoothly as the ride to Mitla—our car T-boned a pick-up truck at an extremely high velocity. Of course, there were no seat belts in the taxi, and of course the car didn’t have antilock breaks. So when the pickup truck pulled out in front of our flying car, the taxi driver hit the breaks but the car just skidded into the side of the pickup truck. Miraculously, especially considering the speed and lack of seat belts, none of the 8 people involved in the accident seem to have been injured in the least. Carl and I were in a bit of shock as we sat in the back seat right after the accident, but we were cognizant enough to be floored by the culture clash that happened next. So in the US or in Sweden, the driver would have of course called the police to report the major accident. Without the police report, the driver wouldn’t be able to file an insurance claim. But in Mexico, the taxi driver got on his radio and called on all his taxi buddies for help. The driver of the pickup truck got on his cellphone and called all of his local amigos for backup. Soon, a bustling crowd of taxi drivers were hurling insults at the bustling crowd of locals. I’m assuming that neither the taxi nor the pickup truck were insured which is an extremely serious offense in Mexico. So the drivers couldn’t ring the police; instead, they called all their buddies, who hadn’t witnessed the accident, to back up their case. The person with the biggest and brawniest group wins the argument, apparently, but we don’t actually know who “won” because our taxi driver also called for a backup taxi to take us, the potentially incriminating witnesses, on our way to our destination. So we arrived in a bit of a haze to the town of Atzompa where we hailed a mototaxi to take us up the mountain to the archeological site. Atzompa was an exclusive suburb or satellite of its contemporary Monte Alban, and you can see across the valley from one site to the other. One should visit Atzompa first, because although it is impressive in its own right, it isn’t in the same league as Monte Alban. None-the-less, it is also an interesting example of an Acropolis-like complex. It is not meant to be looked at, but moved through. The biggest pyramids aren’t even visible until you climb the last staircase and cross the final threshold into the innermost sanctum. It’s the whole experience of moving through the majestic site with its beautiful mountain backdrop that is overwhelming and impressive, not the individual buildings. Atzompa. Left: one of the inner courtyards surrounded by pyramids. Right: A threshold building for crossing into one of the inner pyramid complexes. I think that this is a really interesting and important lesson for city planning and architecture today: The skyline doesn’t have to be the impressive part; cities are not meant to be viewed from a static viewpoint. Nor do individual buildings have to be the impressive part. Buildings contribute to the impression of the whole, but it is the holistic experience while moving through a city that is important. Atzompa is also interesting because archeologists have uncovered ancient kilns and pottery showing that the suburb specialized in pottery. The town still specializes in pottery, and the backyard kilns still have the same design as they did 2000 years ago. The local lineage of potters is continuous over at least the last two millennia. 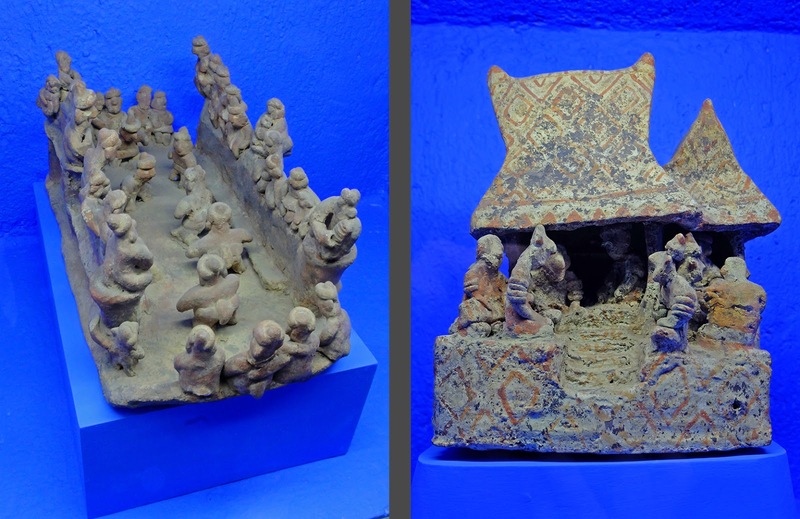 During our time in Oaxaca, we visited several archeological museums to look at the various artifacts that have been dug up from the areas ancient sites. The artifacts were all interesting for different reasons, but a couple that I found especially fascinating showed a ballgame in progress and roofs—the archeological remains of stone show us how the buildings looked in plan view, but the decomposable roof materials have long since rotted away. Without the pottery building models we wouldn’t know what the roofs looked like. Another series of interesting artifacts showed how the natives achieved their ideal form of a high, flat forehead. This first image shows the ideal, and the second shows a baby strapped into a forehead-deforming contraption. Oaxaca is the home of mole sauce, and while there, we tried every one of the seven or nine different types. We also did a couple of mezcal tastings—mezcal is similar to tequila but is made from one specific agave plant and is limited to the Oaxaca valley in origin. We also tried a number of different mezcal cocktails at several of Oaxaca's beautiful rooftop bars. Even though Oaxaca wasn’t on my original bucket list, I am very glad to have seen Monte Alban before I die. It (and its neighboring archeological sites) was extremely fascinating and even more impressive in person than in photographs. What a way to begin 2019! At the beginning of December, we drove down to Småland, a region in Southern Sweden, to attend the baptism of Henning, the second child of our friends Susanna and Johannes. Carl and I joked that while the first child rated a weekend-long party and her own ceremony at the church, the second child only rated a “plug-in” ceremony in conjunction with the regular Sunday church service and a lunch. I never cease being grateful for growing up as an only child! Joking aside, the ceremony and lunch were lovely, intimate affairs and while I’m not one for religion, the small country church, the baptism, and the church service were certainly cultural experiences. Carl and I are now officially godparents times four, although Henning is “our” first boy. I have been intrigued by how in Sweden, the most secular of secular countries, the baptism of babies is still a relatively common practice, even for parents that never attend church and who are not in the least bit religious. It’s such an ingrained part of the secular culture here that baptisms are almost like Christmas—the priest is the only one who has any religious aspirations about the practice at all. Plus, since baby showers are not common practice, it’s the only opportunity for new parents to stock up on baby gear! The more restrained nature of this baptism celebration meant that Carl and I had all of Saturday for exploring the heart of Småland. December was really the worst time of year to try to sightsee—most things are closed for the winter and the weather was, well, depressingly drizzly and grey—but we, being us, still managed to pack the six hours of daylight with fun. The intriguing, unusual double tower of Rydaholm Church, the medieval bishop’s castle of Kronoberg, another medieval castle ruin at Bergkvara and the estate’s mile-long allé, and the pre-Viking Inglinge burial mound which is extra unusual because it still retains its original crowning standing stone and grave ball—all fascinating, all enshrouded in atmospheric mist. 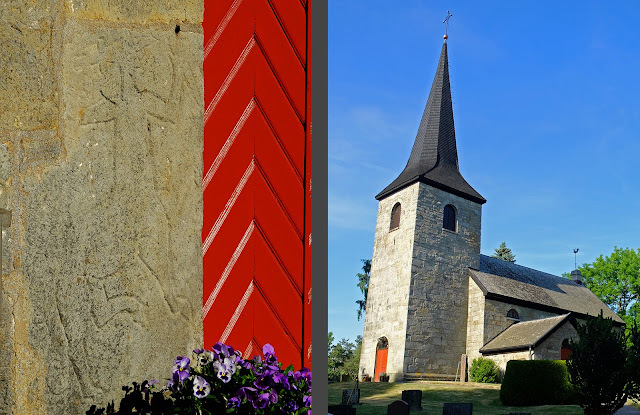 The highlight of our sightseeing day was an unplanned stop at Vederslöv Church. The parish built a newer church in the 1800’s, leaving the Romanesque Church untouched. Today, the chapel is so untouched that it doesn’t even have electricity. Many such churches just close entirely for the winter, so we weren’t expecting to be able to get in, but there was a sign on the church door that the keys were available at the first farm up the gravel road. So we walked over and outside the farmyard was a little signed birdhouse with the keys in it. I don’t know why we were so surprised, but we certainly weren’t expecting to find iron keys that were about 10 inches long and weighing at least a couple of pounds! 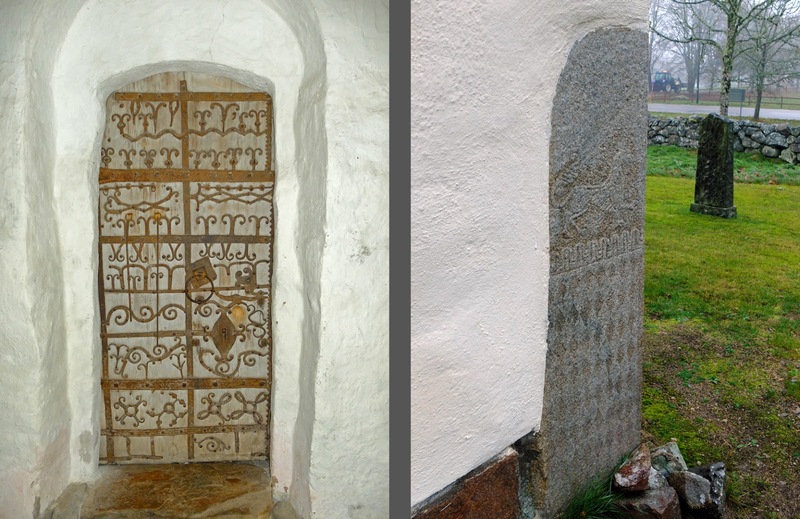 The church door itself was another medieval treasure in iron, and the church also has an intriguing picture stone built into its foundation—very different than the runestones that are so often built into the church foundations around Stockholm. I haven’t found a single source mentioning the age of the picture stone, but I think it’s medieval? The interior was very intimate and serene in its unmodern simplicity. The uncomplicated, flat roof reminded me of a lot of austere Italian churches—they aren’t as technologically sophisticated as Gothic vaults, but their very simplicity radiates a peacefulness that seems very much attuned to Christianity’s early message of humility. 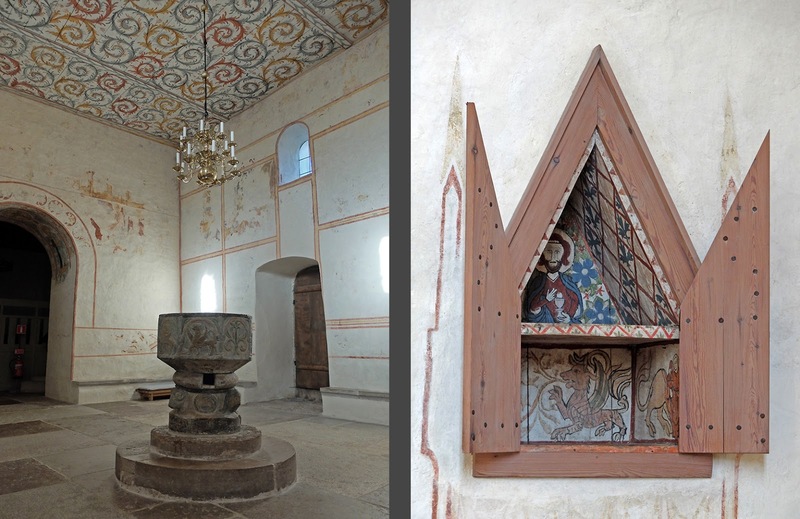 The paintings on the interior are mostly from the 1600’s but the church’s exterior is very unusual in that it retains traces of the original medieval paintings. 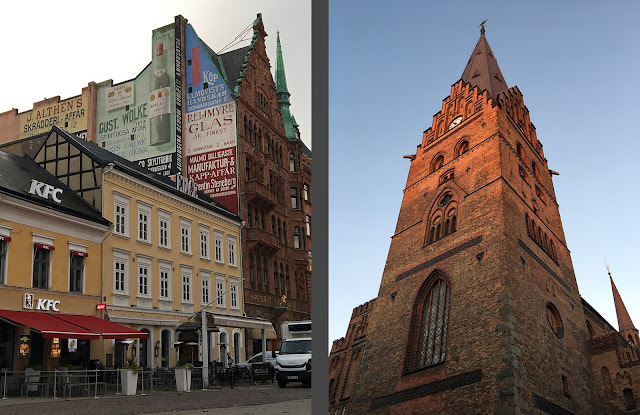 I never knew that churches in Sweden had been colorfully painted on the exterior, I had thought it was only an interior phenomenon! Johannes’ mom leant us the apartment above her store in the town of Ljungby for the weekend. The apartment was absolutely lovely and provided the perfect base for our explorations. Thank you! After a glögg fika at the apartment, Johannes gave us a detailed walking tour of the town where he grew up. Ljungby is relatively bustling but is totally cut off from the train lines. While I think parts of Småland are probably quite lovely (it was kinda hard to tell in the mist, but there was real promise! ), Ljungby is probably not going to be our new dream city to live in. Our original plan had been to take the high speed train down to Småland and rent a car from there, but the train tickets proved so stupidly expensive that we drove from Stockholm instead. And actually, compared to all of our other long-distance road trips in Sweden, this one was easy-breezy: it wasn’t until the last few miles that the highway narrowed down to two lanes! At some point, I’d really love to spend a lazy summer week exploring this part of the country. There’s a lot of nature and a lot of history to explore here. But the problem is, are we ever going to prioritize a lazy week in Småland over a week of skiing in the Alps or hiking in the Norwegian fjords? 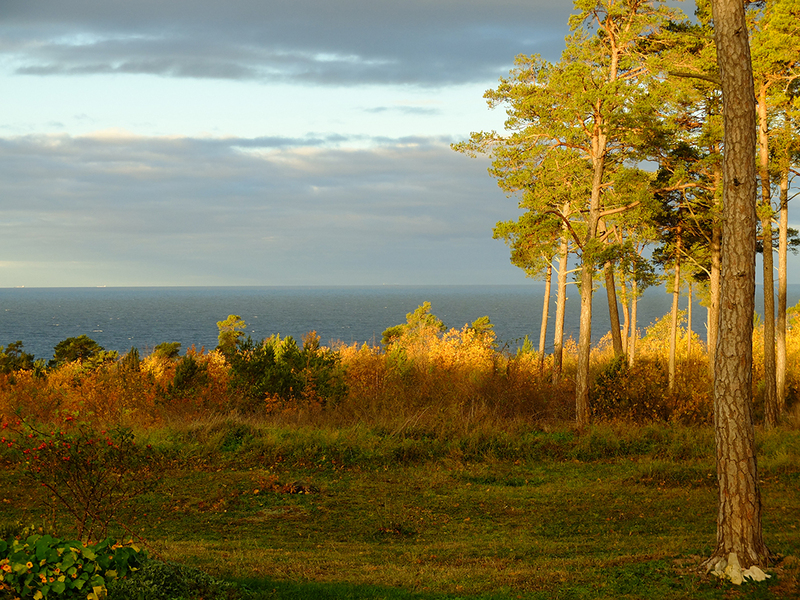 Carl and I spent the long weekend over All Saint’s (Halloween) out in the middle of the Baltic Sea on the magical island of Gotland. His parents weren’t on the island but they graciously let us borrow their house anyway. We took the evening ferry from the mainland out to the island and arrived at midnight. Our rental car, which we had arranged ahead of time by sending a copy of our drivers’ licenses by email and a bank transfer for payment, was waiting for us at the ferry terminal, unlocked, with the keys under the floor mat. A text message before our arrival told us where to find the car and the license plate number. 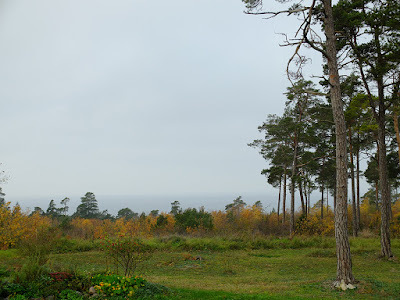 I just love the informality of Gotland! When we awoke the next morning, a low fog hid the water from view. Being a bit tired after our late arrival, we decided not to wander too far from the house and picked a relatively nearby corner of Gotland to explore. Our first stop was at Gann’s Abandoned Church which was built in the mid 1200’s and abandoned during the 1500’s. Given that the church has stood empty for 500 years, it’s surprisingly well intact; there are a few telltale signs of restoration but it’s still impressive that the walls and gables are still standing proud, that the churchyard wall is still so intact, and that very little stone has disappeared into other nearby building projects. 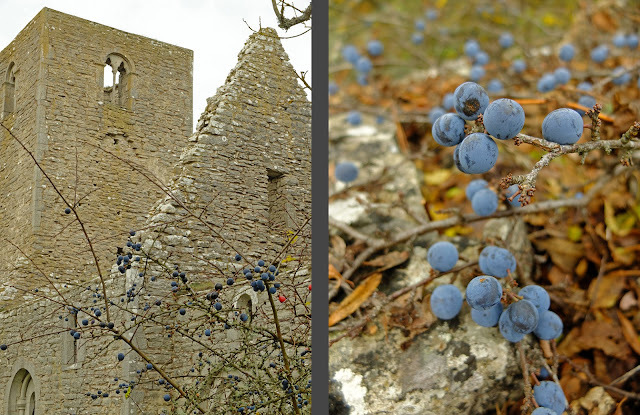 The churchyard wall was covered in blackthorn; we of course had to pick a bunch of berries. An unplanned stop was Dommarlunden, a group of Bronze Age grave monuments in the middle of a farmer’s yard. On one side of the farmhouse, there are several very squished-together stone ship settings where several people were buried in the middle of each ship. They are squeezed so close together that they share stones at the widest part of the boat. Why were they placed so tightly together? On the other side of the farmhouse, there’s a giant mound of stone, also a grave. 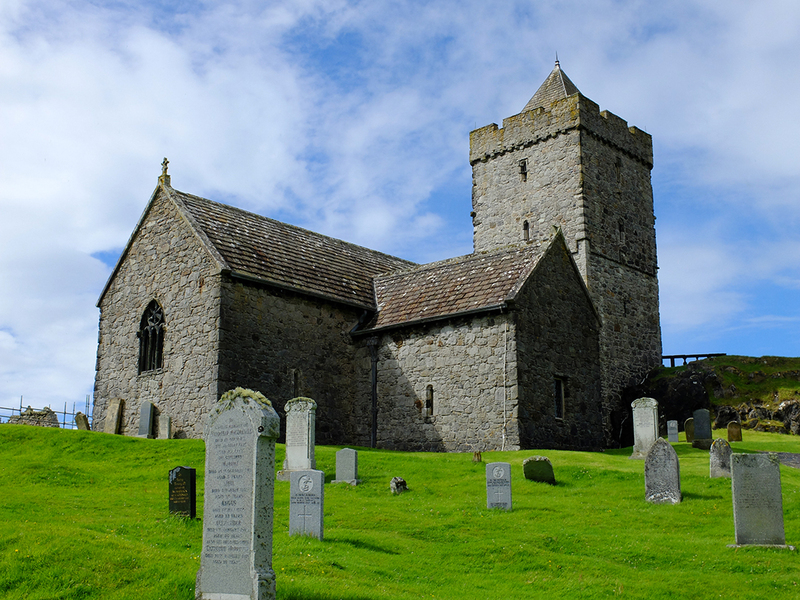 We then drove out to St. Olofshem, an ancient church on a peninsula jutting out from the eastern side of the island. It is here that Christian King Olof from Norway is said to have landed on his way to Russia in 1029, bringing Christianity to Gotland. 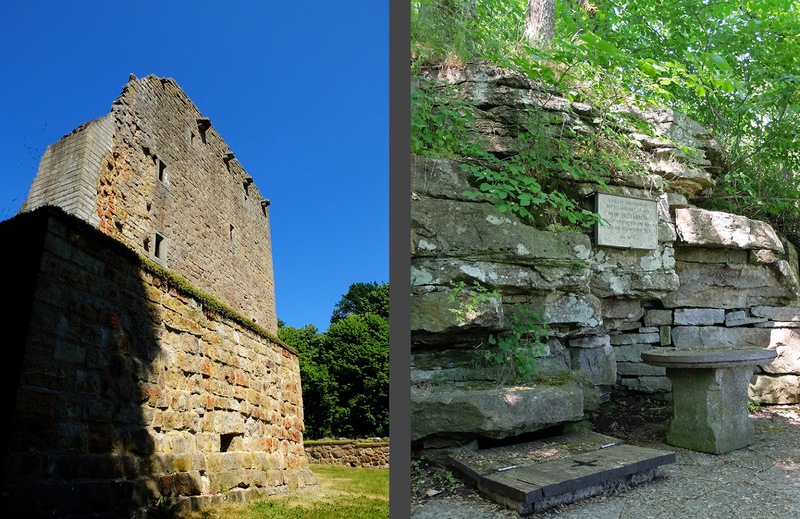 Who knows how much of the legend is true, but there has been a pilgrim’s chapel on the peninsula’s high point since at least the 1100’s. When the original chapel was destroyed in 1536 by German merchants, a new chapel was built just beside the ruin. 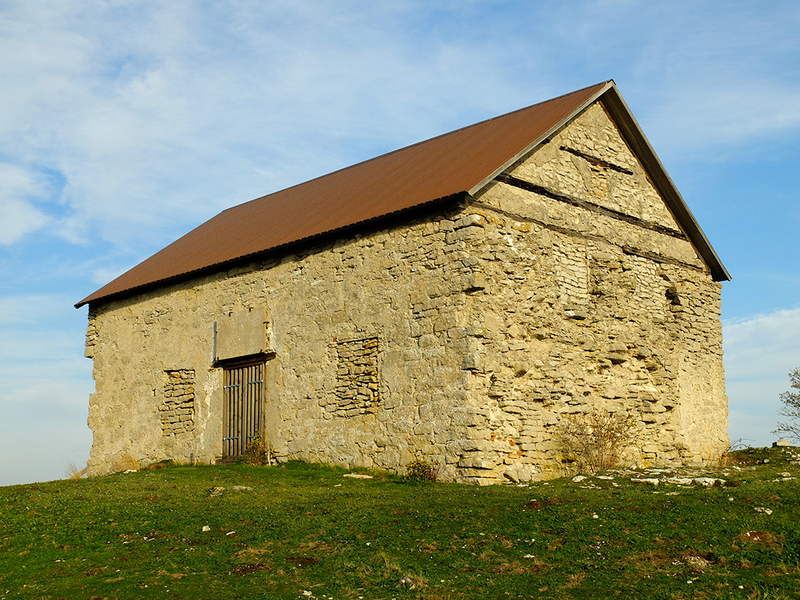 It is this later chapel that is visible today, although it looks more like a farm shed than a church. After the Reformation and the end of pilgrimage, the religious site was more or less abandoned to the local property owner who used the building as a storage shed and as barracks for the workers in a nearby limestone quarry. Nowadays, the chapel is once again used for religious purposes and it’s apparently a popular site for weddings. I was also intrigued by the nearby windmill, which aside from being scenic, was used as a look-out in WWII. The peninsula is also quite beautiful with a number of limestone sea stacks making the coastline extra dramatic. Our next stop was an extensive Iron Age grave field at Ihre. The grave field consists of about a thousand graves, and it was used continuously for about a thousand years. The graves are small mounds of stone, some of which are covered in turf, some of which are just stones. The mounds lie close together and the edge of one mound touches the next mound. A couple of the mounds make clear that the mounds weren’t just piles of stone, but were careful constructions of stacked stone under the “randomly” piled stones on top. The last stop of the day, Kauparve, blew my mind. It was a 3000-4000 year old grave monument, much like the giant mound at Dommarlunden. But here, the stone mound has been excavated. The “random jumble” of stone covering the mound has been taken away, revealing a dry-stacked stone structure underneath. 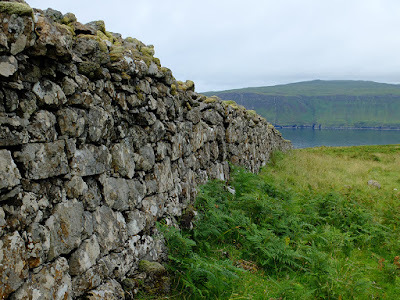 There is an outer ring of stone wall which is about a half meter tall surrounding an inner stone wall which is about two and a half meters (over eight feet) tall. Two stone burial chambers containing three skeletons were found inside the inner ring. Intriguingly, it seems that the inner wall and burial chamber was built first; a millennium later the outer wall was built, and then another millennium later the entire structure was covered in stones. I had never realized that all the giant stone mounds we’ve seen through the years are actually stacked stone structures on the inside. Amazing! These aren’t just piles of stone, they’re architecture! The dry-stacked stone structure reminded me of a low Scottish broch (brochs are considerably younger than the structure at Kauparve. There’s another stone burial chamber about thirty feet outside of the monument. The monument was built on furrowed limestone bedrock. It’s not hard to understand why this spot would have been thought to have a special presence or power. Being November, dusk fell pretty early so we spent the long evenings in front of the fire place. Perfect! 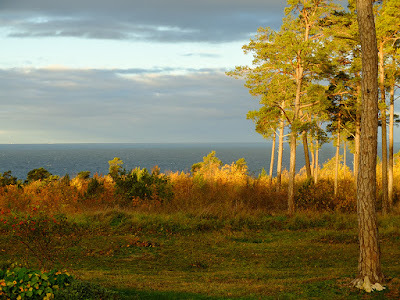 The next day, we woke up and the sea was visible and dramatically lit. We were a bit more energetic and ventured a bit further afield. Our first stop was Garda Church. 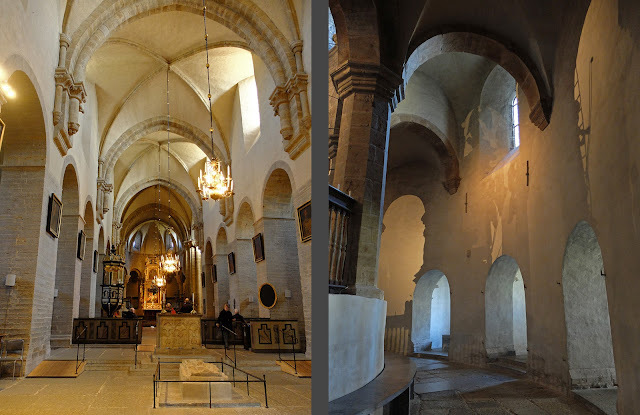 Like most of Gotland’s medieval churches, it started out more modest in size and was expanded over the centuries. 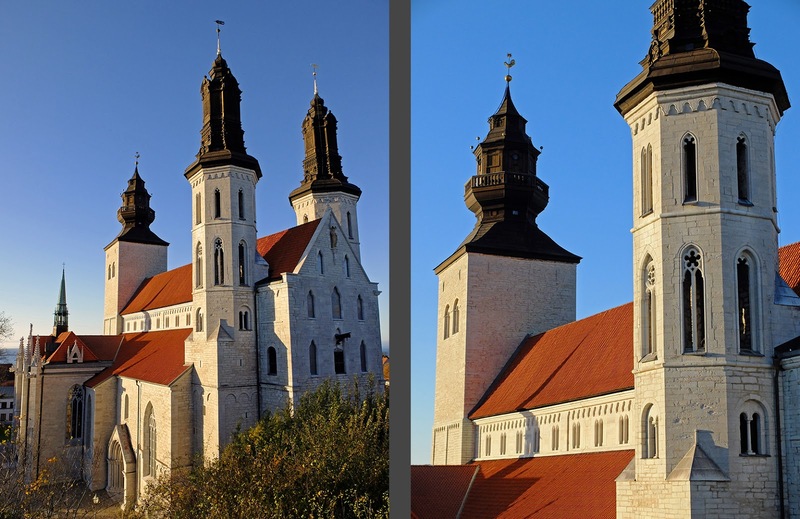 This church, however, was only partially rebuilt when the plague struck Gotland, making church expansions both unnecessary due to the population dip and monetarily unthinkable since trade more or less ceased after the epidemic. Garda church is frozen in time, halfway through its rebuild, with a large Gothic choir and tower and a silly-looking small Romanesque nave in between. Garda Church is known for this Romanesque nave because the interior is practically untouched since the 1100’s with its flat, wooden ceiling (Gotland’s churches didn’t get stone vaults until the 1200’s), the stone benches around the exterior walls where the congregation once sat and listened to the service (wooden pews came much later), and the stone baptismal font. I was also intrigued by a couple of other details like the stone portal carved like an opening in a carnival tent, the Byzantium-inspired painted arch between the tower and the nave, the original painted medieval cabinet for storing the sacrament built into the church’s wall, and the churchyard’s four portals, the largest of which was also used as a storage magazine. Our next stop was a prehistoric site at Bandeläins Täppu. Here, two stone ship settings, a stone circle, and a lone standing stone mark graves from about 900 B.C.. More picking of blackthorn berries. Just down the road was a Culture Trail at Lausbackar through an intact agricultural landscape that has been farmed in much the same way from the Bronze Age to today. These Bronze Age farmers were likely the same people who were buried at Bandeläins Täppu. It was a gorgeous walk with beautiful views out over the fields to the sea. Another stop at another Bronze Age mound of stones at Digerrojr. It wasn’t the most spectacular stop ever, but we did enjoy the big mound, especially now that we know that there’s a drystone structure underneath the seemingly random pile of stones! Another high point of this stop was finding and picking tons of autumn chanterelles which, fried up in butter, became a delightful addition to our dinner. A high point of our trip was another Culture Trail at Visne Ängar or Visney Meadows which was inhabited in the Bronze and Iron Ages. The Meadows were the grazing and domestic areas for four farms and were surrounded by agricultural land. It’s a gorgeous landscape of rolling hillocks, a tumbling stream, towering oaks, hazel groves, and grassy meadows under the mighty oak branches. It’s a very open landscape, certainly carpeted with wildflowers in the spring, and its beauty appeals on a visceral level. It feels very natural, but the entire landscape was in fact methodically planted and cultivated by the farmers. Oaks provided building materials and acorns (feed for pigs) while the hazels provided hazelnuts (feed for pigs) and hazel branches (winter feed for livestock). The grassy meadow provided summer grazing for the livestock and a beautiful setting for everyday life. Nature or nurture? It’s hard to know if our innate love for this type of landscape is nurtured, born of millennia of farming—this type of landscape provided the base for a good diet and was therefore beautiful—or if we naturally were drawn to this type of landscape—we created it because it was innately beautiful to us and then developed a farming system that thrived upon it. It was approaching dusk as we left the meadows, and on the way home, we stopped in at Visby’s large cemetery and ambled through, enjoying all the small points of light: the All Saint’s candles on the graves. We hadn’t procured grave candles ahead of time, but we stopped to say to hello to a couple of Carl’s distant ancestors nonetheless. The next morning, we took time out of our busy touristing to visit one of Carl’s distant but living relatives, Lola. Lola is in her 80’s, sharp as a tack, and physically robust. We had a lovely chat, and visiting her made me think that aging isn’t always dreadful. Lola lives right outside of Visby’s medieval walls, and after our visit, we walked around the southern half of the city wall, completing the circuit we had started in the spring of 2017 (see Gotland, Sweden's Provence). We continued walking along the wall that separates the city from the water, then continued on the inside of the wall up to the top of the cliff that separates the lower and upper halves of the city. From the cliff, we enjoyed a fika break of coffee and tea from our thermoses and a bar of chocolate and sat looking out over the rooftops, church ruins, and wall towers toward the glistening blue sea. 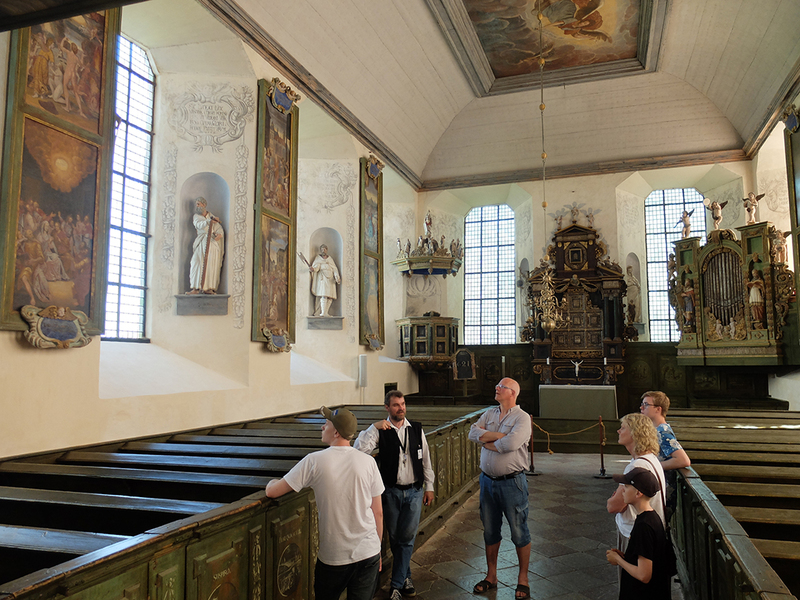 Our last stop before heading to the ferry terminal was to visit Visby’s Cathedral St. Maria. This cathedral is almost certainly Gotland’s largest church, and it is immaculately maintained, but I am not as drawn to or intrigued by this church as I am to Gotland’s smaller churches which are sprinkled throughout the island’s rural landscapes. Perhaps, having been built by German merchants, St. Maria doesn’t have the same “native” spirit as Gotland’s other churches. Or perhaps, because it has always been the dominant church with no lack in funding, it has been “modernized” too many times throughout the centuries, loosing its medieval charm. Or perhaps it is too big, not having the intimate feel of Gotland’s rural churches. Or perhaps, being the cathedral in the island’s big city, it’s not so unexpected as finding jewels of medieval art and architecture out in the countryside. Sitting on the ferry for four hours back to Stockholm, I reflected on our wonderful long weekend. I realized that we had journeyed through four thousand years of architecture in stone from the Bronze Age mounds to Iron Age grave fields to medieval churches and defensive towers. 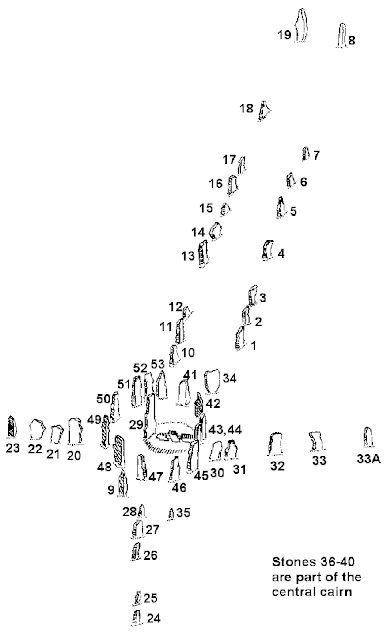 But Gotland’s tangible prehistory brings a lot of questions to light. If Bronze-Age “natives” could build advanced stone structures that have lasted for four thousand years, had the knowledge of stone just disappeared by the time the missionaries arrived? Are Viking rune stones not evidence of a facility for working stone? Did the “natives” really need the Christians to “save” them from their “backward” wooden huts? It seems obvious to me that Vikings had the knowledge and ability to build in stone, how could they not considering that they travelled to and terrorized Constantinople, Paris, York, and considering that their ancestors had been building structures in stone for millennia? The better question is, why did the Vikings choose not to build in stone? 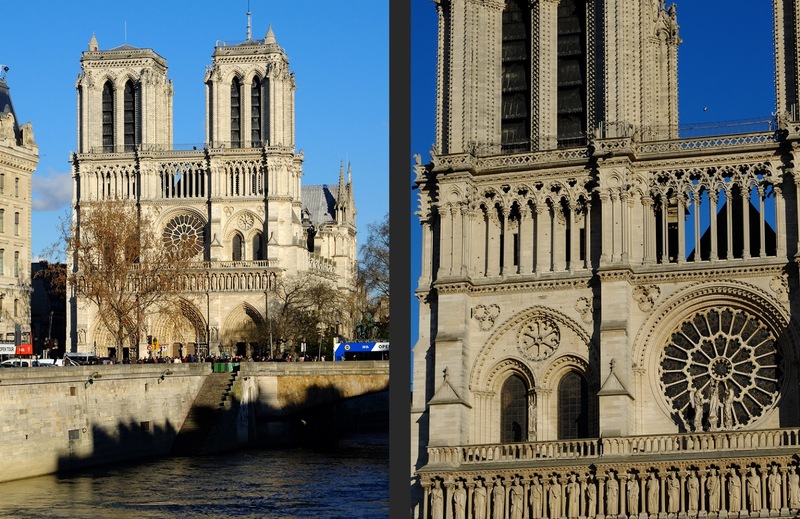 Had stone architecture become a symbol for foreign and therefore inferior cultures? Was stone reserved for monuments to the dead? 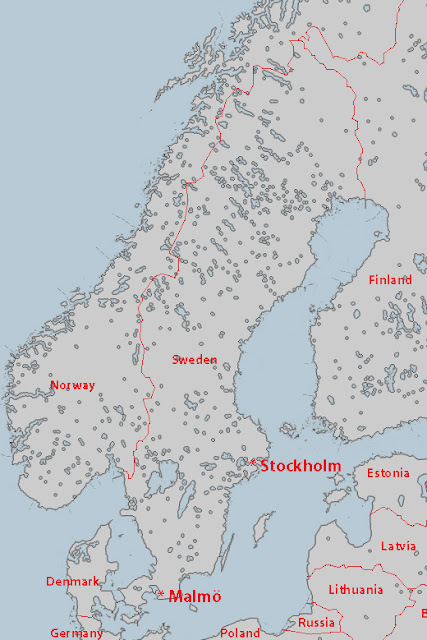 Was stone simply too cold and draughty in a climate like Sweden’s? Or was stone too impractical, not being nearly as portable as traditional wood timber buildings which were frequently disassembled, moved, and reassembled? A seemingly innocuous history—with Christianity came the technology of building in stone—is revealed to be pro-Christian propaganda at the slightest scratching of the surface. The world-wide story that the Christians came in and saved the natives from their own inferiority seems to ring, falsely, even in Sweden. Today, Sweden is so established as part of the wealthy, Christian, western world that it is almost shocking to remember that Sweden was once outside the “civilized” world and that its people were regarded as barbarous, needing to be saved and enlightened. Stone architecture (along with fruit trees), was one of the “civilizing gifts” that the Christians brought with them, convinced that their way of life was the better way. Ironically, though, it appears that Sweden didn’t really need the gift of stone architecture. Swedes had already been building with stone for at least four thousand years. Carl and I had already bought train tickets to visit our friends in Malmö when the bosses at work decided that I’d be taking over a Malmö-based project, and the first project meeting just happened to be the Wednesday before our trip. 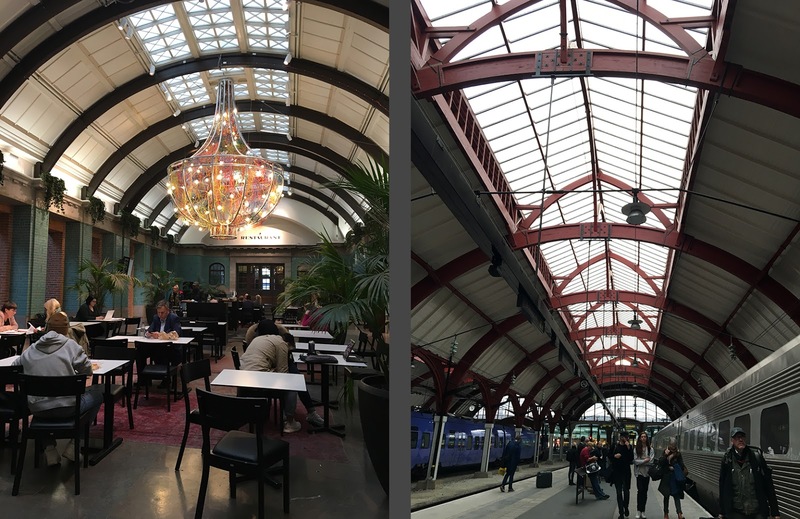 Since the high-speed train between Stockholm and Malmö takes close to five hours, it seemed a bit silly to take the train down to Malmö on Tuesday, back on Thursday, down again on Friday, and back to Stockholm on Sunday. Instead, I decided to work from the Malmö office an extra day and skip the extra 10 hours on the train. Thus, my weekend in Malmö turned into almost a week. My office booked a really charming hotel for me in a historic building, right in the city center and a five minute walk from the Malmö office. I lucked out with a room on the attic floor with charismatic wood beams and sloping ceilings. On my walk between the hotel and the office, I passed by the Malmö City Hall everyday and just had to laugh at the restoration architect’s lack of humility: Link. And then over the weekend, our friends let us use their hard-won gift certificate for a weekend at Malmö’s new, hip OhBoy hotel. The hotel is a pretty smart concept—the rooms are on the ground floor of a recently built apartment building. Most Swedes really don’t like living on the ground floor due to the lack of privacy, and the hotel rooms have direct entry access from the street with a key-pad entry system meaning that the hotel is basically reception-less. You get a text message with your room number and the entry code, and you just show up, punch in the number, and enjoy your hotel room. It’s a great use of hard-to-sell residential space along the sidewalk while requiring very little effort on the part of the hotel administration. The hotel is in Västra Hamnen (Western Harbor), a seaside area that used to be very industrial with ship building, but which is now in the process of being redeveloped into housing and office space. Calatrava’s Turning Torso is the best-known project in the area, but the area is filled with interesting projects which I’ll have to explore at a slower pace on another trip. I spent the weekdays working, but I spent one evening jogging along the canals and spent another lovely evening with Susanna and Johannes and family and enjoyed a casual family dinner at their place. Then on the weekend, Carl arrived on the train and we had a cozy stay at OhBoy. We spent most of the weekend helping Susanna and Johannes paint their new electric cargo bike, the family vehicle of choice in such a flat city as Malmö, but we also took time out for a couple of lovely walks through Malmö’s historic residential districts, along the beach, and through the new Västra Hamnen. And then before we knew it, we were back on the train heading to Stockholm. Thank you for a lovely weekend Susanna and Johannes and family! 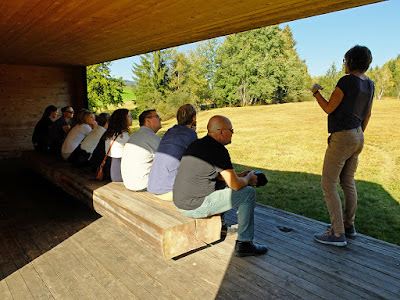 This year I chose (among other options) to travel to Voralberg, a region of western Austria, to check out a number of beautiful projects sprinkled throughout the Alp valleys. The particular focus of the trip was wood architecture, but we sure did see some beautiful concrete, too! We were gone over a long weekend and managed to pack in quite a lot of beautiful projects without making the trip too stressful. Carl always teases me for taking zoomed in photos of bricks. This trip, it wasn’t bricks in the lens but the tiny wood shingles which have historically been used in the region. They’re tiny because they’re traditionally made of cheap, left-over wood and bigger pieces would cup. Left untreated, the shingles last about 80 years. Some incredible custom-built shelves, not a joint or screw to be found. Even custom-welded bookends and rails. Workroom Andelsbuch, Peter Zumthor: Concrete shear walls were planed to the tiniest detail. One community has invested in architect-designed bus stops and invited international architects to design them. In payment, the architects received a week’s stay in the valley. Left: Bus stop designed by Sou Fujimoto from Japan. Right: Bus stop designed by Rintala Eggersston Architects from Norway. On one beautiful afternoon, we hiked for about an hour through a nature reserve/agricultural landscape. The hike started at this rest pavilion which is designed to frame the landscape. We then continued barefoot through a bog and then through the beautiful landscape to a chapel. 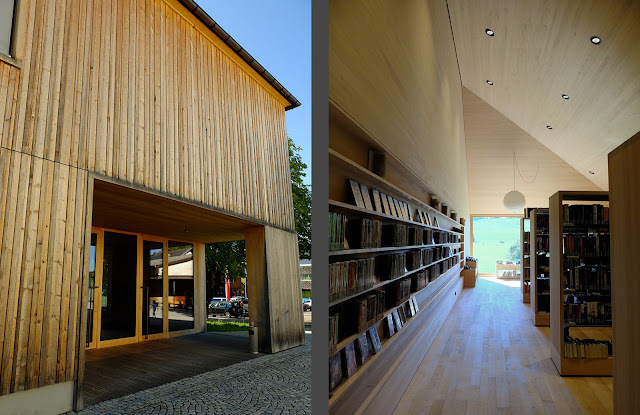 The chapel was of course built of local wood. and this museum wall made me smile. Most of my group seemed to abhor this glass-wrapped museum, but I appreciate the solution to the age-old art museum dilemma of creating an interesting project without any windows or openings to punctuate or break up the volume. We also stopped briefly at this office building, I don't know what it's called or who the architect was but the detailing was so simple but beautiful. The building felt like it belonged in Portugal. Our first dinner out was truly gourmet and the setting was pretty if not architecturally memorable. Our last supper was up at the top of a cable car on a mountaintop. The food wasn’t great but the view was amazing! Our group flew in from Göteborg, Stockholm, and Malmö and gathered in Zurich before renting two vans and heading into Austria. The Stockholm flight was delayed, so one car had to wait for us for five hours...ouch. We used the vans throughout the trip—without them we never would have been able to see so much, but the downside was that the trip did feel very sedentary. I’ve always come away from the work study trips both inspired and depressed. Inspired because of all of the beautiful projects I’ve seen, and depressed because I don’t always get the opportunity to work on such beautiful, detailed masterpieces. Last year, I was saturated with starchitect, capitol A architecture. This year, the projects were humbler and more modest, but every bit as beautifully detailed, perhaps even more beautifully detailed. It was a truly successful trip, and I didn’t even come home quite as exhausted as usual! Thank you to my groupmates for a great trip! 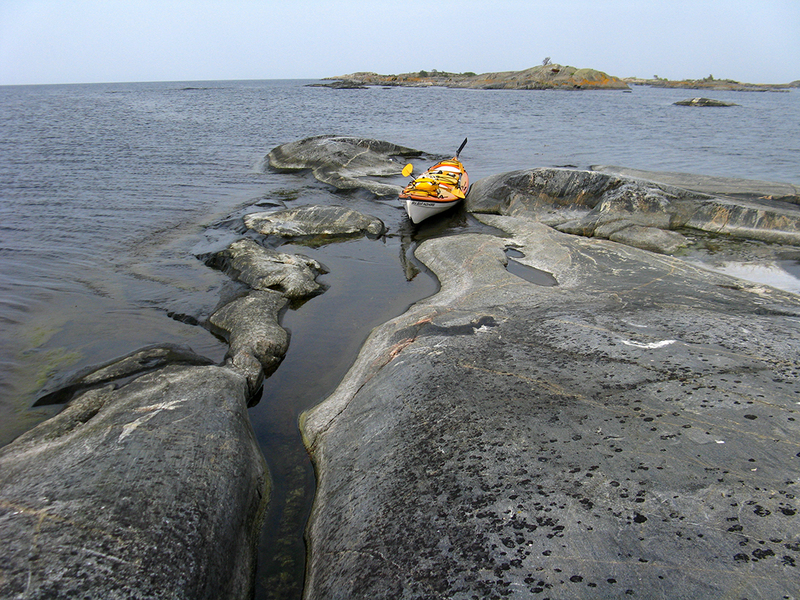 To celebrate our 9th wedding anniversary, Carl and I went kayaking out in the Stockholm Archipelago. 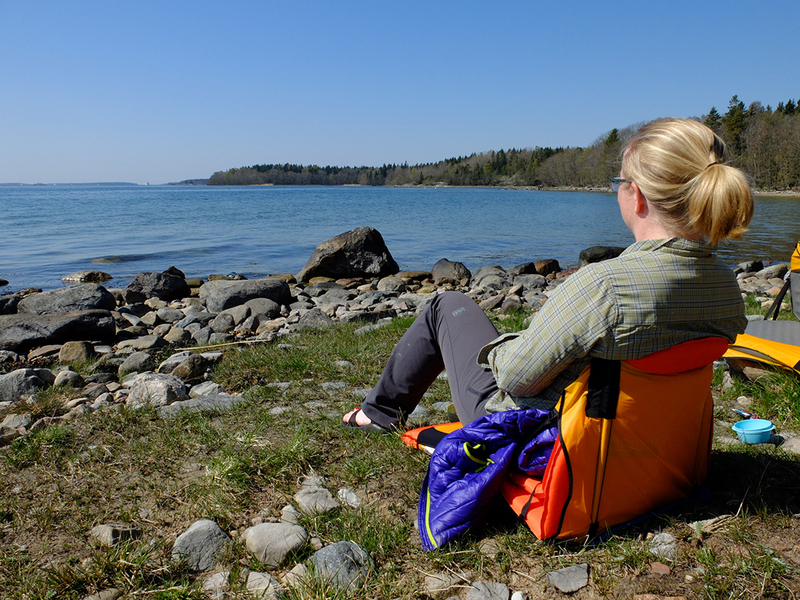 Carl has mapped out a lifetime’s worth of enticing kayaking routes from the various rental agencies throughout the archipelago, but since most of them require at least a long weekend, our choices were automatically narrowed down to Vattungarna. A weekend paddle to Vattungarna turned out to be a fantastic option because we were able to get out into the farthest, most exposed band of islands in the outer archipelago without having to paddle for days on end. Also, the route was extremely varied. amidst uninhabited islands, through reedy and rocky shallow areas, and across deep shipping lanes. We left work a bit early Friday evening and bussed up to the city of Norrtälje then on a local bus to the little community of Gräddö where our reserved kayak was waiting for us. (All of that bussing and we were still on our Stockholm subway card!) We were impressively efficient in getting the kayak packed up and were soon on our way. We didn’t paddle more than half an hour before dusk settled in and we needed to find a place to camp. Luckily, a tent-sized, flat-ish rock outcrop with a ledge perfect for getting in and out of the kayak was just a couple of paddle strokes away. By the time we unpacked the kayak and set up the tent, it was pretty dark. Despite being September, the temperatures were still summer-warm and we were able to sit outside and enjoy the night sounds of lapping waves and chirping crickets without getting chilled. Since kayaking allows for a whole different level of camping food than backpacking, we had a bag of wine with us as well as chocolate chip cookies—the wine and the desert were lovely accompaniments to the evening orchestra. I slept surprisingly well considering that our tent was actually pretty slopey. 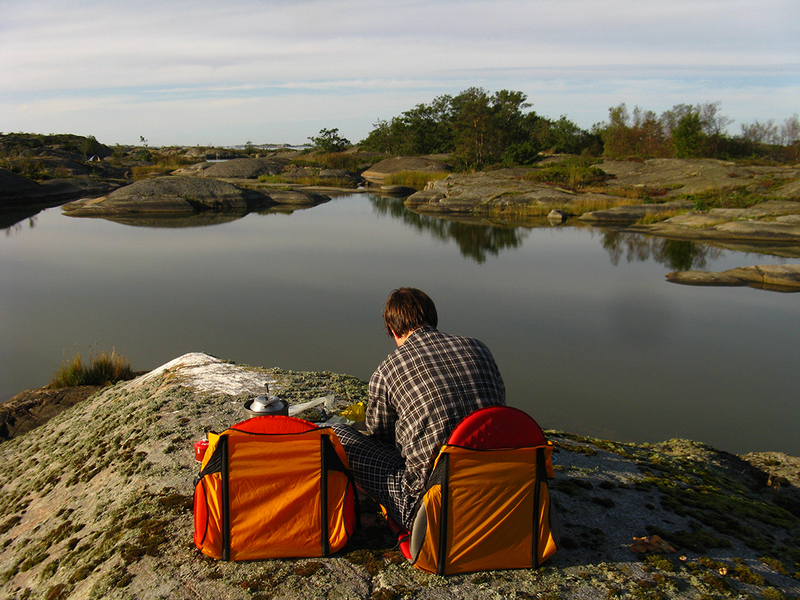 We enjoyed a relaxing breakfast with a beautiful water view before packing up camp, loading the kayaks, and setting off toward Vattungarna. After crossing an open channel, we entered a series of narrow but natural canals between islands. The canals are a beautifully intimate setting; from the kayak, we could see all the details of both sides. Parts of the canal were deep and bedrock plunged from the islands down under the water’s surface; other areas were shallow and we had to navigate slowly and carefully between rocks. Other parts were lined with reeds swishing and sighing in the breeze, blocking all views so that the world seemed to consist of nothing but sky, reeds, and the winding channel of water. From the canals, we emerged into a more open landscape of groupings of small islands separated by wider bands of water. We wove through the islands until we emerged into another completely different area, this time a warren of teeny tiny islands, really just little points of rock sticking up through the water’s surface. While we did see a few other kayaks enjoying the maze, the area is much too shallow for any motorboats. We found a perfect tiny island, maybe about 200 square feet, for lunch. A tiny little canal split the island and provided the perfect place to “park” our kayak while we ate our picnic. The only problem with our island was that it was much to small to provide any privacy for a bathroom break! From the warren of skerries, we paddled out to the outermost band of islands. We had chosen Vattungarna as our destination for the evening because it looked unusually interesting for exploration on the map. The island is almost sliced in half by two long canals that are separated by only a small bulge of island. We first paddled deep into the outer canal before paddling around the island and finding a tent site deep inside the even more sheltered canal facing in toward land. Our tent site on Vattungarna was much flatter than the previous night, but it was up on a rock ridge sloping gently upward until it suddenly dove into the water. 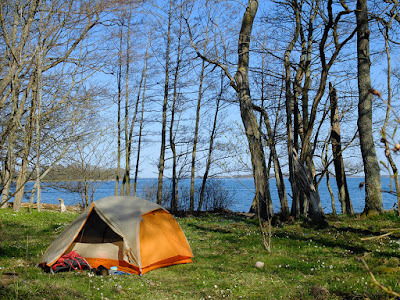 After setting up the tent, we spent an hour or two exploring the island on foot. 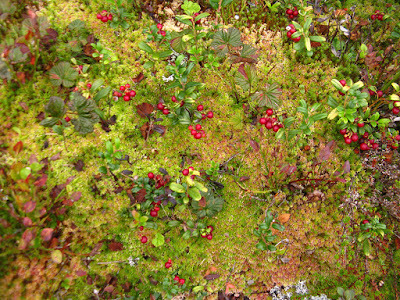 We even found a few mushrooms to fry up as an appetizer (unfortunately they turned out to be worm-eaten) and picked a few lingonberries to spice up our granola breakfast. 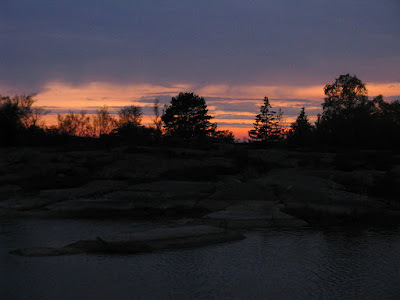 The island’s topography was very undulating with low, marshy areas and even a few ponds, medium-high forested areas, and higher areas of bare bedrock. Between the long day of paddling and all the rock-hopping around the island, we really exhausted ourselves. We enjoyed our nacho dinner, the wine, and chocolate pudding dessert while watching the sunset and listening to the sounds of a summer night falling around us. Even after it got dark, we sat out in our camping chairs and read a bit by the light of our headlamps before turning in. The next morning dawned warm and sunny, and we enjoyed a long, lazy, sunny breakfast with our canal view before packing up and setting out. We paddled a different, more direct route back toward the mainland, although we did have fun winding through a few narrower channels. When we were about halfway back, we stopped for lunch on a little uninhabited island and went for a skinny dip. Given that we were in a wide, open channel, the water was surprisingly warm. After a couple of day’s worth of sunscreen, bug spray, and outdoor grime, it felt wonderful to get clean, and I’m sure that everyone else on the bus home appreciated our bathing effort. The Baltic is salty, but it’s a low enough level of salt that you don’t feel overly sticky after swimming. Left: Freeze-thaw cycle at work. Right: Lunch view. It didn’t take us long at all to get back to the kayak rental, and since we had a little extra time, we paddled around a few extra islands before returning the boat. We had more than enough time to catch our intended bus, and soon enough we were home and snuggling with our poor, abandoned cat. It was such a lovely weekend out in the archipelago! 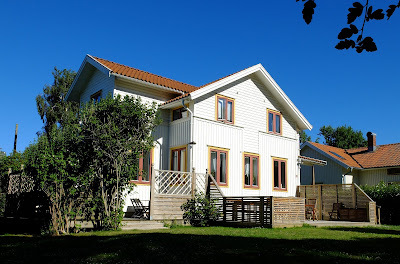 In August, Carl’s aunt Eva invited us back to her cozy cabin on the beautiful island of Svartlöga. We had already been back from summer vacation and at work for a couple of weeks before the trip, so it was a wonderful way to extend Stockholm’s short summer season just a little bit longer. We were lucky with dry, sunny weather that was inviting for a swim. We left work early on Friday and spent the four hour long ferry ride with books, a glass of wine, and beautiful views. Eva met us on the island and provided a traditional crawfish feast for dinner—it was such a treat, especially in such authentic surroundings! As usual, we dined and chatted by candlelight until we were all too sleepy to keep our eyes open, and I slept unusually deeply that night. We all enjoyed a lazy morning and then Carl and I set out for a couple of walks. First, we returned to the mushroom-covered area that we had discovered last year (see “Island Weekend”), but found nothing. We then set out to the end of a peninsula that we hadn’t explored before. Despite the Stockholm region’s severe drought, the island was surprisingly green and verdant and summery. We found a secluded area where the bedrock dips into the sea and went for a lovely swim. On our return to the cabin, the light was right and we spotted several mushrooms that we had missed on the way out. We picked a modest number of björksopp, or birch boletes, and fried them up as an appetizer before dinner. but the big haul was gooseberries. Gooseberries are usually ripe when we’re away on summer vacation and completely picked over by birds by the time we get home, so it was a special treat to find ripe ones on this trip. We also walked through the island’s super cute village down to the super cute harbor. Despite the fact that I’ve photographed the harbor several times before and have probably taken more than a hundred shots, I just couldn’t resist this time, either. After the harbor photo shoot, Carl and I sat on a dock and enjoyed the sun on our backs and the sound of the waves lapping against the rock. We’ve never visited during the summer high season, but on the off-season, Svartlöga’s harbor is a particularly scenic and peaceful place. Like many other beautiful places in Sweden, the harbor blends culture and history with natural landscapes into a lovely and unique scene that’s seemingly straight out of a travel magazine. Every family on the island has their own cart for wheeling groceries from their boats to their cabins. 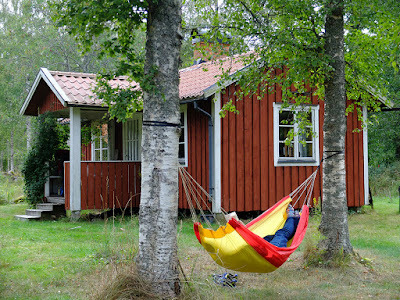 After returning to the cabin for lunch with Eva, Carl and I spent an hour or two snoozing and reading in our hammock. All too soon it was time to leave the island with the ferry. The weather was still beautiful so we bundled up and sat out on the ferry deck and enjoyed looking at the passing scenery of islands, cabins, forests, dramatic cloud formations and reed marshes. 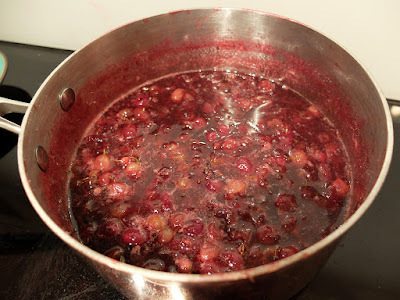 At home, we ate the black currants with our breakfasts and turned the gooseberries into a delicious jam. Svartlöga and its deciduous forests are truly beautiful, but one of the things that I love most about the island is how time slows down when you’re there. The weekends still feel short from ferry ride to ferry ride, but the time in between seems to lengthen just a little. Actually, it’s not that time seems to move more slowly, but that the pace of life slows down a bit. Svartlöga is a place to slow down and enjoy. The simple life: The cabin's dishwashing station uses water carried from a well, and the greywater is poured over the blackberry bushes along the fence line for a little extra nourishment. A washbasin and water jug for handwashing after visiting the outhouse. Thank you for a lovely weekend, Eva! A few of the island's other cute cottages. After our stay on Skye (see below,) we took the ferry out to the Outer Hebrides and to the Isle of Harris which is known for Harris Tweed, turquoise water and white sand beaches, and its rocky, “lunar” landscape. We unfortunately didn’t have great weather, so while we did successfully purchase a new Harris Tweed winter coat for Carl, we didn’t have that much luck with the turquoise beaches. We did get a hint of the turquoise, but with all the rain and clouds blocking the sunshine, the water wasn’t nearly as bright and vibrant as we had been led to expect by guidebook photos. We “wild” camped by a couple of deep, white sand bays, and while we didn’t get to fully experience the turquoise water, we did get to see the bays both at high and low tides. 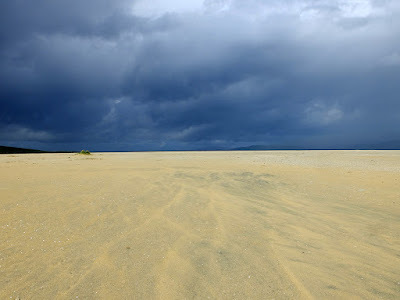 At low tide, the bays are miles deep and the water is so far out that you can’t even see it. But at high tide, the bays fill with water and you’d never guess that they are completely bare twice a day. The landscape is far too green to be considered lunar, if you ask me, but it was beautiful, rocky and desolate scenery even if I don’t quite agree with the guidebook author’s choice of description. Villages consist only of a few houses, and there really aren’t that many villages on the island. The windy one-lane roads make the relatively short distances between villages feel like real journeys. We did get a few moments of sunshine, such as when we stopped at St. Cements Church. This medieval church is know for its sculpture, both on the facade and the knight effigies in the interior. Instead of the usual demon or ogre, this church has a naked lady baring it all to scare away the evil spirits. 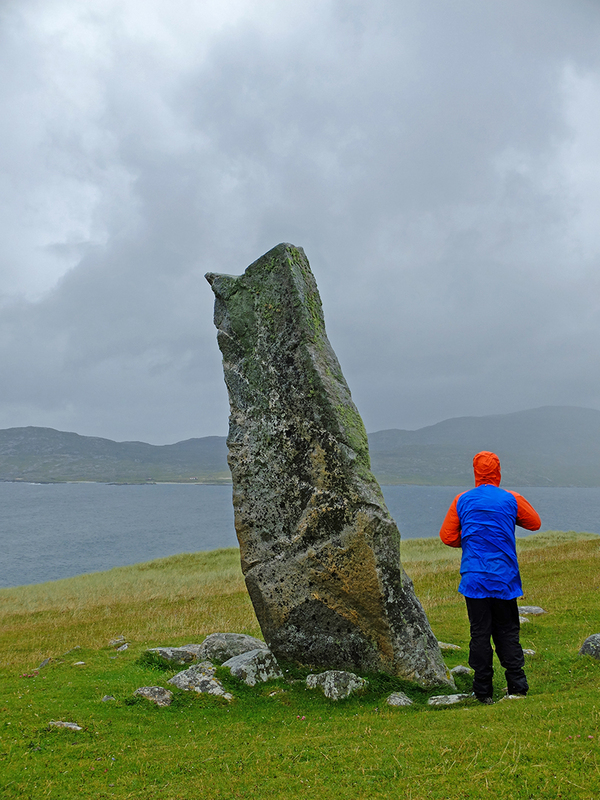 But most of the time, we went site-seeing in the rain, such as when we hiked to this giant, lone standing stone on a slope above the sea. 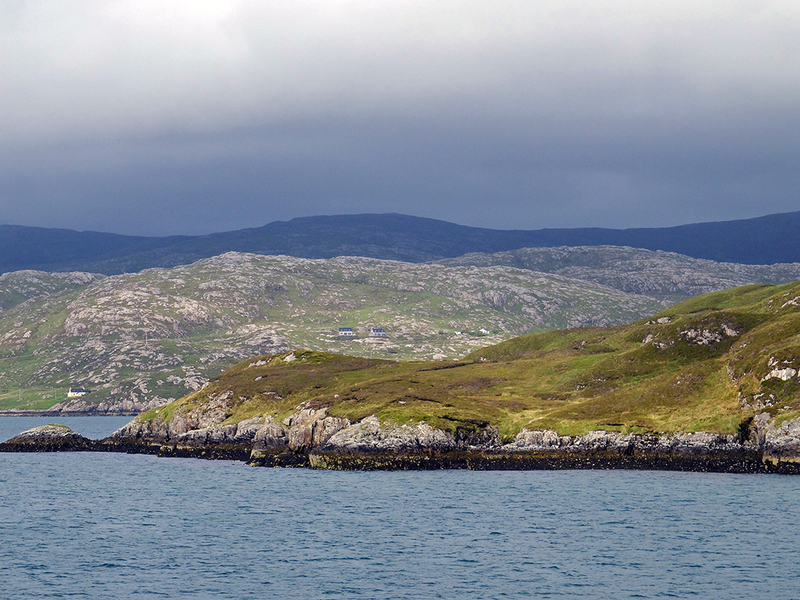 The Isle of Lewis is actually attached to Harris even though they have two separate names and identities. 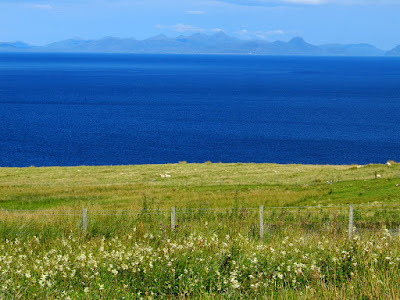 The names come from old Norse and Harris means “High Land” while Lewis means “Low Land.” Lewis’s landscape is much flatter and much less dramatic than Harris’s, and much of Lewis’s interior is dominated by a seemingly infinite moor. Being a bit flatter and less rocky, Lewis was more cultivated and there are still clear signs of how crofters once tried to make a living from the land. Raised beds of kelp-enriched soil were created to aid productivity, and slivers of land divided by stone walls show how the fields were divided up and rotated among the villagers so that no one was stuck with the less-fruitful fields for more than a year. We visited a couple of different blackhouses or traditional crofting cottages. They had thick, double-stone walls and thatched roofs. 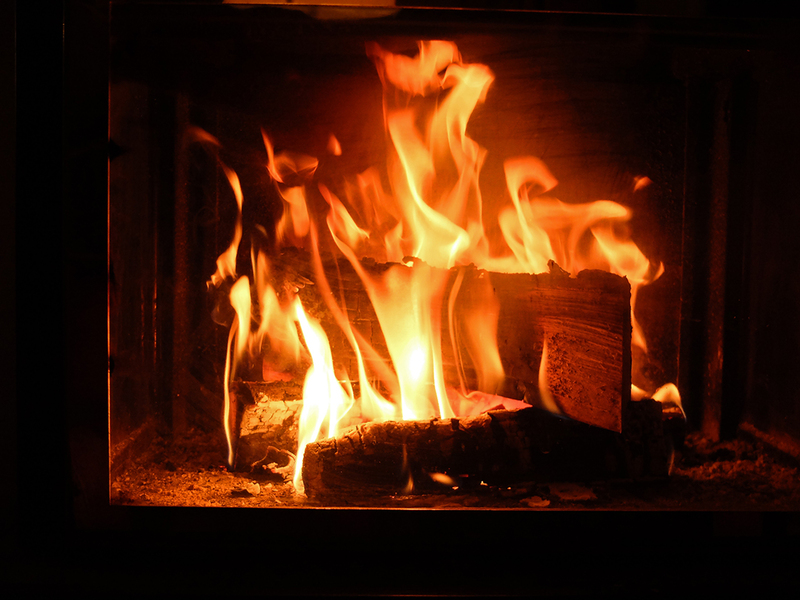 The hearth was in the center of the main room, and there was no chimney. Instead, the smoke eventually drifted out through the thatch. Apparently the smoky houses had their advantages since the smoke preserved the thatch, it was easy to smoke meat and fish, and the smoke kept bedbugs and lice away. The highlight of Lewis was definitely its Neolithic stone circles, the most impressive of which is on top of a ridge at Callanish. Built about 5000 years ago, before Egypt’s pyramids, the stone circle consists of thirteen standing stones around a central stone. 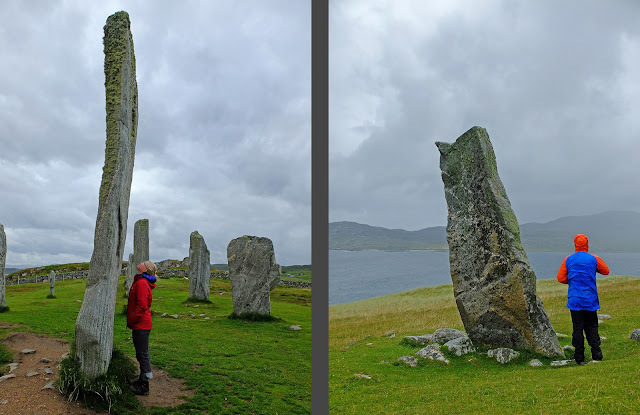 The circle’s stones are in the range of ten feet tall while the central standing stone is sixteen feet tall and five feet wide. The stones are cut from a nearby quarry and the texture of their visible grain makes them even more visually interesting and mysterious. Transporting and erecting the stones was truly an impressive feat. Later, over the span of several millennia, the stone circle was added on to. First was a line of stones leading further up the ridge to the south. 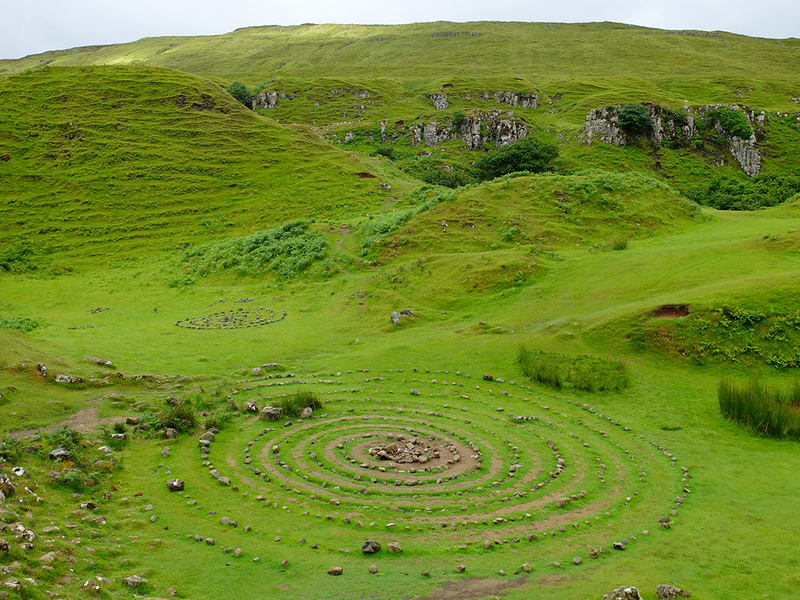 A bit later, a chambered cairn was built off-center inside of the circle. It was a communal burial chamber used over several centuries. An avenue defined by a double line of standing stones was built down the ridge to the south, and shorter arms of standing stones radiating to the east and west of the stone circle were added by 3500 years ago. 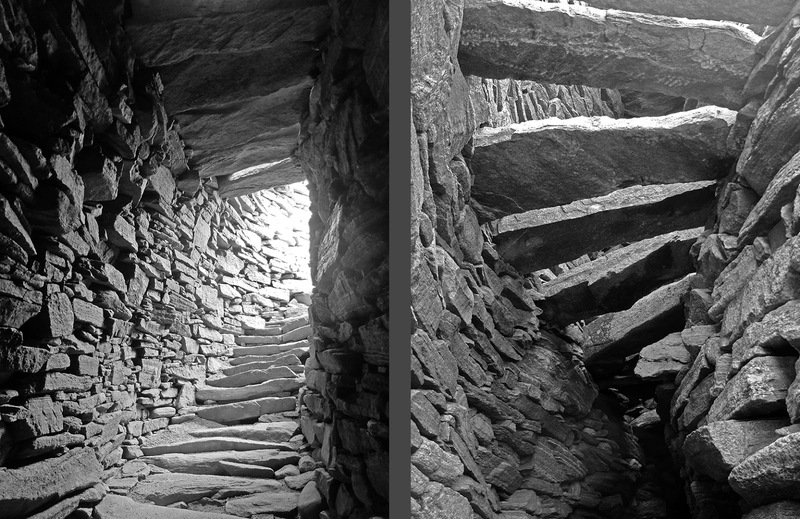 But about 500 years later, the chambered cairn was destroyed and the remains were scattered about the site. The site’s museum interprets this desecration as evidence of changing views of the standing stones, but my personal theory is more along the lines of the site being desecrated as an act of aggression or war. Perhaps the conquerors brought a new religion with them. The stone circle does not sit on the ridge’s highest point. The circle is not perfectly round, the central stone is not perfectly centered, and the arms are not perfectly straight or aligned to the cardinal directions. The site has no known astrological coupling. It’s hard to surmise if geological perfection was an unachieved goal or if the site held some other meaning, but the processional nature of the avenue leading up the ridge seems evident, at least in my church-influenced eyes. 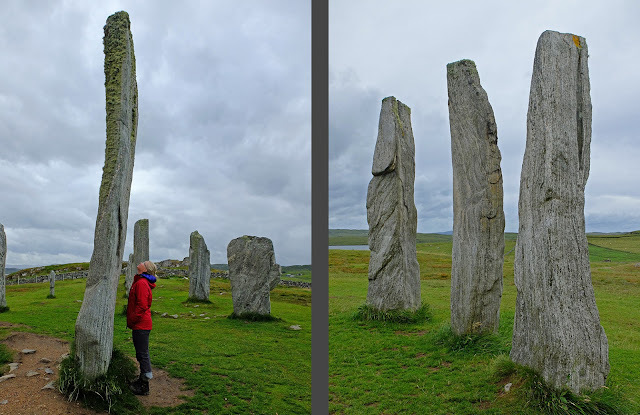 The Callanish Standing Stones are mysterious, impressive, and interesting on their own, but I find them even more intriguing because it is just one of several stone circles within easy walking distance. 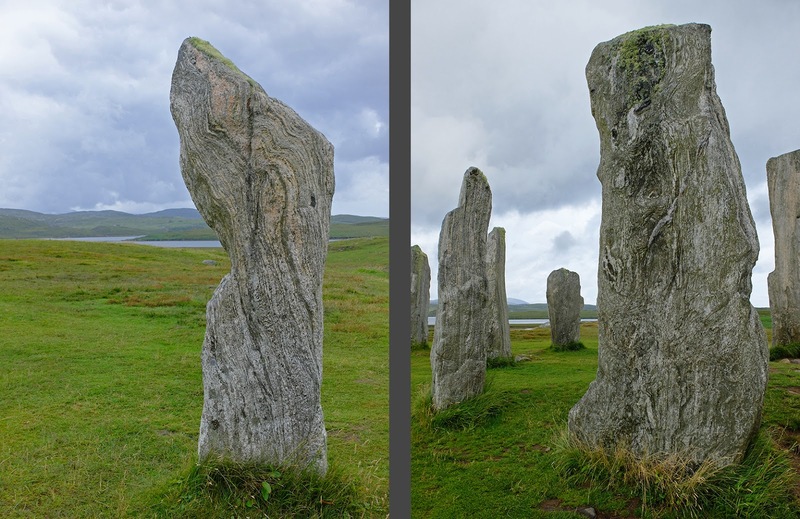 Callanish is definitely the most impressive circle—the other sites have smaller stones and lack the radiating arms. I started to ponder how the various circles related to each other. Was it a case of many small, local or even private circles and a big, regional circle? Or were all of the circles part of a larger complex, much like the various temples at the Acropolis in Athens? Was Callanish dedicated to the area’s most important god while the smaller circles were dedicated to more minor deities? 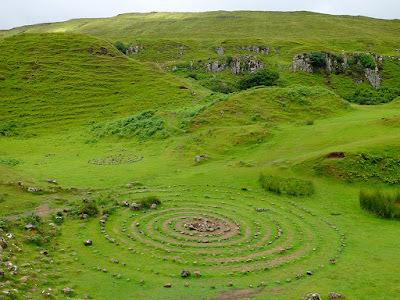 Or were the various circles stops on some sort of pilgrimage eventually leading up the processional avenue and culminating at the stone circle at Callanish? Any why were the circles placed just below the ridges’ highest point? Was the highest point left clear for occupation by the gods? Or if the circles were connected on a pilgrimage, and if they were approached from beyond the high point, the circles would be hidden from view until they suddenly appeared, magically, below you. Another nearby stone circle, this one isn't even signed from the road much less in the guidebooks. Lewis and Harris are so out of the way that there are relatively few tourists and most everything is free. Even the Callanish standing stones, the biggest tourist site on the island, had no entry fee. We were si fascinated by the stones that we visited the site three times, once just to sketch and write. Another pre-historic highlight was stopping the Dun Carloway broch. The double, dry-stacked stone walls of this Bronze Age defensive manor house were still clearly visible. A staircase built in between the walls not only helped with vertical movement between the tower’s several floors but the spanning stone treads also helped to structurally tie the inner and outer walls together. We also spent a day hiking across the heath to a couple of Stone Age shielings. A shieling is like a Swedish fäbod, a simple hut up at summer pastures. These shielings were built of double stone walls and a corbelled stone roof into beehive shapes beside a burbling creek. Inside, there’s enough room to stand up and small storage niches were built into the walls. The beehive shielings were in use all they way into the beginning of the 19th century, which explains why they survived intact for 5000 years. Our last night on Harris and Lewis, we were having trouble finding a place to wild camp that wasn't visible from the road and that was also close enough to town for an easy drive for our 6 a.m. ferry. We ended up spending the night inside of one of the island's many "fixer uppers." The islands have numerous abandoned but scenic crofts, some of which are pretty far gone like the one above, but others are more in the range of doability. After spending four full days on Harris and Lewis, we took the ferry back to the mainland and drove across the country, scouting out Cairngorms National Park for future ski touring adventures. We stopped at scenic Braemar Castle before staying the night at a lovely lodge tucked way into a scenic, fecund glen. On the way back to the Edinburgh airport, we made a couple of sightseeing stops. 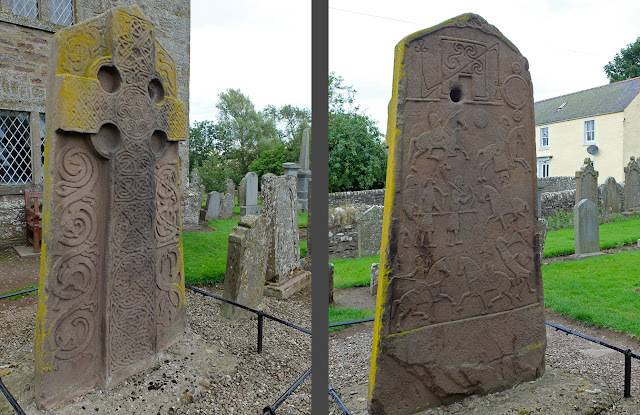 Our first stop was to see several Pictish stones at Aberlemno. The stones are roughly the same age as early Viking rune stones. The Picts were Christians, and a couple of the stones clearly depicted crosses. The stones also clearly depicted horses and soldiers at battle. Two sides of the same stone. 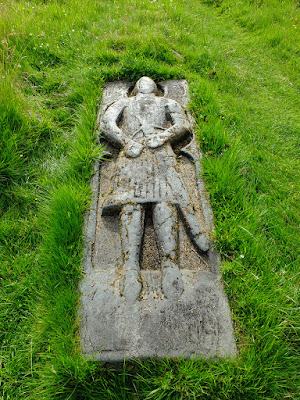 It was moved from a field to the churchyard during the middle ages. However, a lot of the other depictions were symbols such as “combs,” “mirrors,” and zig-zags that haven’t been interpreted despite being repeated on many stones throughout the country. 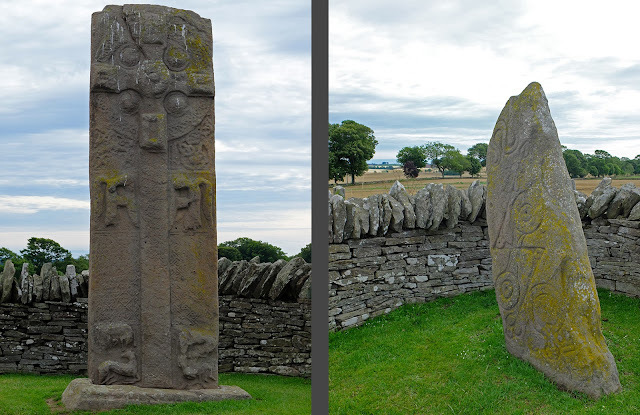 I found it interesting that while the depictions on Swedish stones are carved into the stones, the Pictish stones were carved in relief. We also spent a few hours at Stirling Castle, one of Scotland’s largest and most important castles that was developed over many centuries and occupied by most of Scotland’s (and many of England’s) regents. The castle is strategically and scenically located on a lofty height, and the several of the buildings were exquisitely built. We didn’t have a lot of time to explore, but the town of Stirling is a lovely scale and is very charming. Although we spent three weeks in Scotland , our summer vacation was over before we knew it, and as always, there was a lot that we didn’t get to see. We loved having time on Skye and on Harris/Lewis to hike into the mountains and across the moors, to delve more deeply than the traditional tourist track, and to have the time to sit and enjoy the mountain and standing stone views when the weather allowed. While Scotland is of course very European with its prehistoric monuments, its lengthy and complicated history, its lovely cities, its deep tradition of food and drink, and its abundance of palaces and castles, the natural side of Scotland is much wilder and rawer that most of Europe. In a way, Scotland’s wilderness is very civilized with its aristocratic hunting grounds and great estates, but that historic layer doesn’t lessen the wild impact of Scotland’s “hills.” Carl and I were definitely disappointed by all the rain during our trip, but our appetite for Scotland’s scenery and history is still strong; we’ll definitely be back on several more trips to explore the Orkneys, St. Hilda, more of the Highlands, still more castles, more whiskey tastings, and more dramatic beaches. After our weekend in Edinburgh (see below), we rented a car, bought tons of groceries, and drove across Scotland to Isle of Skye. We stopped for a brief look at the loch-side Eilean Donan Castle but it was late so we scurried across the bridge to the island. The forecast was for a window of descent weather just as we arrived on Skye, so we headed straight out into the mountains in the middle of the island. 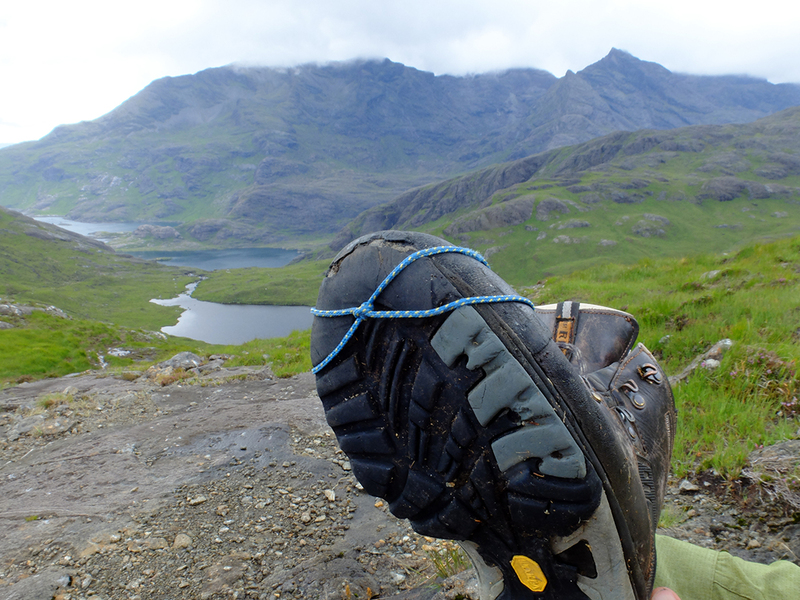 The range is known as the Cuillin Hills, but despite their lowly name, the peaks are jagged and only climbable with a rope and harness. We were surrounded by these dramatic “hills” for our entire 4 day hike. then up to a pass, passing several lakes along the way. 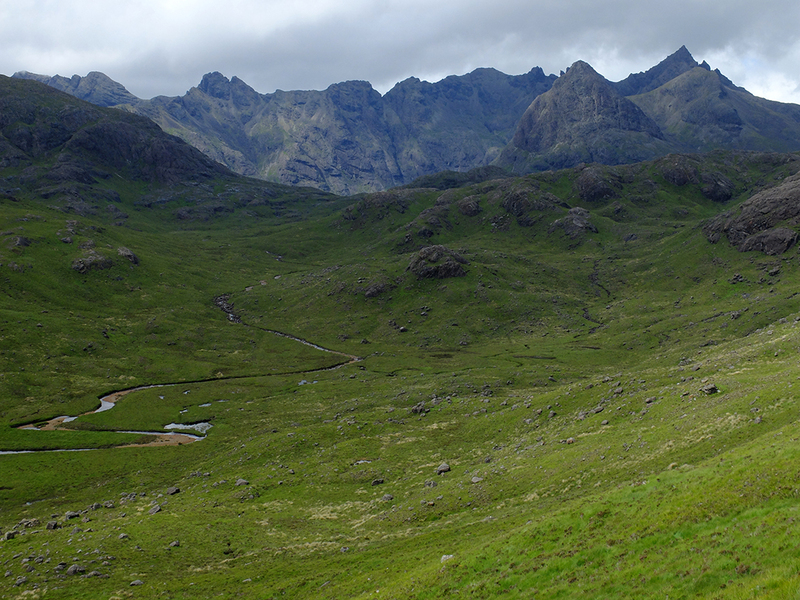 Climbing up to the pass between Sligachan Valley and Loch Coruisk. From the pass, the view was extremely dramatic with serrated ridges all around us and layer after layer of lakes all the way to sea. The scenery was not unlike dramatic Norwegian fjords. View fromt the pass down to Loch Coruisk. From the pass, we also scouted the next pass to the west as a possible off-trail loop for our hike out. There’s no official trail going over that other pass, but it looked crossable on our map. We of course couldn’t see if there were steep cliffs dropping away from the other side of the pass, but the close side looked very hikable. which is a glacier-carved lake almost reaching to the ocean. From the lake, the water falls over a lip that’s about 15 meters high and tumbles into the sea. Crossing over Loch Coruisk's outlet which tumbles directly into the Atlantic. The head of the valley is closed in by sharp, rocky peaks and the scenery is breathtaking and dramatic wherever you gaze. We set up our tent on a bulb overlooking the loch and the amphitheater of mountains. The next day, we took a daypack and circumnavigated the lake. The air was warm and humid, and we were soon sticky and sweaty from crossing a tricky boulder field, so we went skinny dipping at a particularly scenic and shielded cove. The turquoise water was refreshing without being cold, and we lingered in the water for a while. We didn’t have towels with us, so we stood on the beach, rotating our stomachs and backs to the sun to dry off. Just as we were getting dressed, we heard some hikers well behind us in the boulder field. Good timing! On our hike to the lake, we had passed by a good number of other hikers, though not all of them were heading to or coming from our destination. 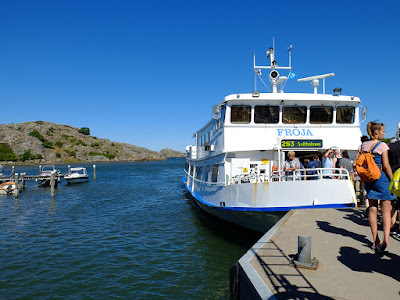 It is possible to reach the lake by boat, either private or on a small tour boat, so there are a good number of day trippers at the lake, too. But relatively few hiked the loop around the lake, and in the evenings, we had the entire valley practically to ourselves. We continued around the lake and crossed the feeder river at the head of the valley. We stopped often for lunch and snacks and many photos and generally reveled in the views which just got more and more dramatic as the day became clearer and clearer. The hike around the lake was only about 10 kilometers, so we were able to take our time and really enjoy the scenery. Left: The river at the top of Loch Coruisk. Right: The stream draining the Loch. The next morning, we packed up camp and hiked back up toward the pass we had crossed to get to the lake. But instead of following the trail all the way up to the pass, we decided to turn off and head up a side valley to the pass that we had tried to reconnoiter on our way in. Before hiking in Sarek last year, I would have found the trail-less walking difficult and disconcerting, but after trekking across Sarek for three weeks last year, this little off-trail hike seemed easy as pie. We reached the nameless but very windy pass and ate lunch while enjoying the breathtaking views of the jagged mountains encircling the valley of Harta Corrie. Carl and I started calling it the Enchanted Valley. View from our off-trail, unnamed pass. From the pass, we dropped without difficulty down into the valley, but we then we climbed up a steep face into a hanging valley. From the hanging valley, the view out from the valley is cut off, so we felt like we were in our own secret world. According to our guidebook, there is supposed to be an “easy,” cairned trail up beside a huge waterfall into the next hanging valley above, but the author must be crazy—the only access up into the next hanging valley is up a vertical cliff face and is utterly impossible without ropes. The author must have confused this valley with a different one. We camped up in our secret, enchanted hanging valley and then hiked out the next day. Again, the weather was warm and muggy, so we jumped into the river at the bottom of the valley. It was blissfully cool but not cold and I stayed in for quite a while. The coolness remained in my body for a good while, but I was definitely hot and sweaty again by the time we got back to the car. 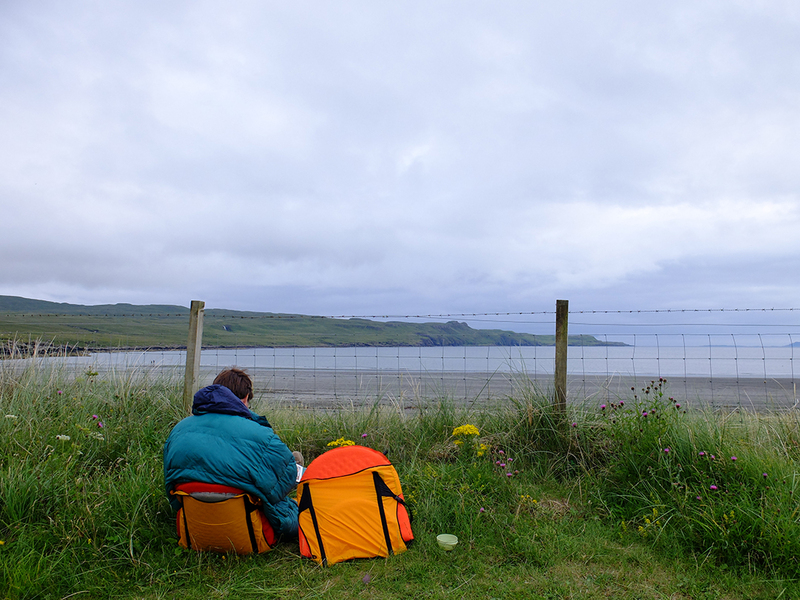 It had been a while since our last shower, so we drove to a car camping ground along the beach at Glen Brittle. The showers were lukewarm but delightful none-the-less, and camping along the beach was quite scenic. Unfortunately, however, the midges (larger no-see-ums) descended in the evening so we couldn’t sit outside for long. Doubly unfortunate was the weather, which had turned for the worse, socking in the mountains in clouds—despite there being a dramatic backdrop of Cuillins behind the beach, we never got to experience that view. Car camping at Glen Brittle. The next morning, there was a break in the rain so we went on a very rewarding day hike out to the end of the peninsula at Rubha an Dunain. The hike would have been even more dramatic with mountain views, but we had a lovely day enjoying the closer-range sea-cliff views, seals, and prehistoric sites instead. The head of the peninsula has a shallow natural cave that was used during the Stone Age; we hid there from a rain shower and had a snack. Even more fascinating was the dun, a Bronze Age defensive structure consisting of a dry-stacked stone wall cutting the end of a small peninsula off from the rest of the area. On the water-side of the wall, it seems like small buildings or rooms shared a wall with the defensive structure. Right below the dun, a herd of at least 20 seals were playing in the water. We watched them arc, swim, and pop up in small groups or alone for quite a while. Sometimes a pair of seals seemed to be wrestling or possibly mating. We saw two different baby seals riding on the back of its mother, and two other young seals playing in the vicinity of an adult. A few of the seals barked and grunted while swimming toward us, probably to intimidate us, the intruders. The seals were so fascinating, and so cute! A bit farther around the peninsula, right beside a small lake, we climbed into a giant Neolithic chambered burial cairn. The top had long-since caved in but we could still clearly see how the entry and sides were constructed with some upright stones, some spanning stones, and a lot of dry-stacked stones. The cairn and the setting and the drizzly weather were very atmospheric and oh-so-Scotland, we were almost convinced that by climbing into the cairn we were going to get transported back to the Stone Age á la Outlander. The peninsula was also littered with historical relics. Several beautiful stone walls crossing the peninsula, a ruined manor house, and an abundance of ruined croft cottages are all that is left of a once-bustling farming village. The only distillery on Isle of Skye is Talisker, so of course we had to go on a tour and bring home a souvenir bottle. We also enjoyed testing different whiskies in the evenings while reading in our tent—in Scotland, it’s possible to buy half bottles of good brands so we were able to test a few different varieties over our three weeks. It was fun sitting by our tent and enjoying our whisky with a view in the evenings (or all too often we were forced to sip our whisky in our tent and without a view due to the rain). Left: Walking to Talisker Bay. In the rain. Right: Trying whiskey in our tent. It looked like there was going to be another break in the clouds and fog and rain, so we headed up to the Trotternish Ridge for our next backpacking adventure. This time, we left the car at the end of the trail and took the bus to the beginning of our hike. The bus ride was very long, and it started to feel impossible to retrace all of that distance, on foot, in just three day’s time. The weather was promising while we were on the bus, but as we got off the bus, it started to sprinkle. We headed up anyway. The hike began with a very steep climb from nearly sea level up to the ridge. Without studying it, you’d think that it was impossible to climb up the ridge’s cliff face, but there was actually a perfect, upwardly sloping cut in the cliff face that provides the perfect “roadbed” for the trail. Climbing up to the Trotternish Ridge. Once we had gained the ridge, we had a chocolate snack, then headed practically straight uphill toward the top of The Storr, the ridge’s highest peak. As we climbed, the peak seemed to get more and more socked in, but we continued up, optimistically hoping that the clouds would subside again. Once the fog was so thick that we couldn’t see much ahead of us, we stopped for lunch to give the clouds a bit more time to abate. But sadly, the whiteout only got thicker and soupier, so it seemed pointless to continue up. Instead, we cut across the back side of the peak and eventually descended to a pass which was just barely out of the clouds. The fog had been very disorienting, however, so we became pretty nervous about continuing along the ridge, back up into the fog. We set up camp in the pass and hoped for better weather the next day. Camping below The Storr, waiting for the fog to disappate. The next peak over was still fogged in when we woke up, but by the time we had eaten breakfast and packed up camp, the entire ridge seemed to be clear of clouds and fog. We decided to risk it and to charge along the ridge and hope that we could make it out to the road on the other side before the clouds descended again. We had several beautiful, rain-free hours with dramatic light playing across the folds and fissures of the ridge. The views both forward and back along the ridge were just gorgeously dramatic with the ridge’s sheer cliff face dropping into the green valley below. Between the treelessness and the mesa-like nature of the ridge, the scenery felt like a very, very green West Texas. There was no trail per se, but with clear weather, it was easy to follow the edge of the ridge as it ascended and descended peak after peak after peak. Many of the climbs were brutally steep, and the descents were ruthless on the knees. We weren’t at altitude, and the peaks weren’t really all that high, but the steepness was just barely at a walking angle (as opposed to a climbing angle) and the sheer number of steep peaks across the long ridge made the hike challenging and tough. The guidebook was right when it warned that the ridge hike is tougher than it looks on paper. We generally walked several feet from the ridge face, and since the ridge tilts upward, we only rarely saw the bottom of the ridge’s cliff face. At times, small ravines cut into the ridge. Skirting them, you get a clear view about 700 meters or 2300 feet straight down into the valley. Vertiginous, to say the least. While we were crossing the valley before the last major ascent, it started to rain again. We could see low, dark clouds moving in toward the ridge, so we decided that it was better to continue up in order to be able to get down—the peak wasn’t fogged in yet and waiting in the valley was likely to mean that we’d be waiting for days and days before the weather cleared up again. The last climb, however, was the steepest and the most dramatic. The only feasible route was extremely steep and extremely close to the cliff’s edge; I was a bit nervous during the ascent but our path was luckily in the lee of the wind so it wasn’t nearly as scary as I had expected. 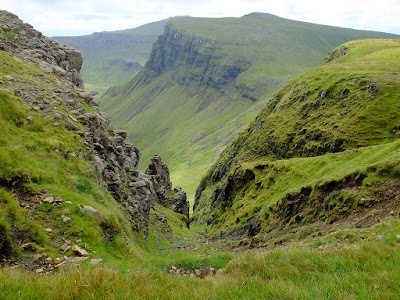 We made it over the last peak and descended to The Quiraing. 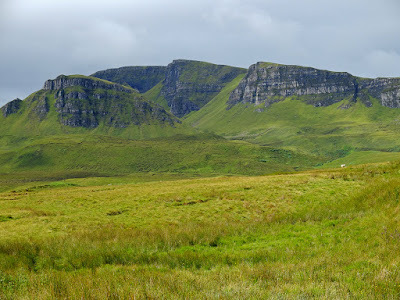 The Quiraing is just below the ridge at the bottom of the cliff face where giant chunks of cliff have fallen down or been separated from the ridge over geological eons. The resulting landscape is a twisted, bumpy maze of hills and stone pillars and hidden valleys and surprise lakes. Apparently, islanders hid their cattle in the Quiraing when Viking raiders descended upon the area, and I can now see why that was a successful tactic. Just when you think that you’ve meandered out of the maze, another hill or cliff suddenly appears to block your path. Stone walls to keep livestock in The Quiraing. 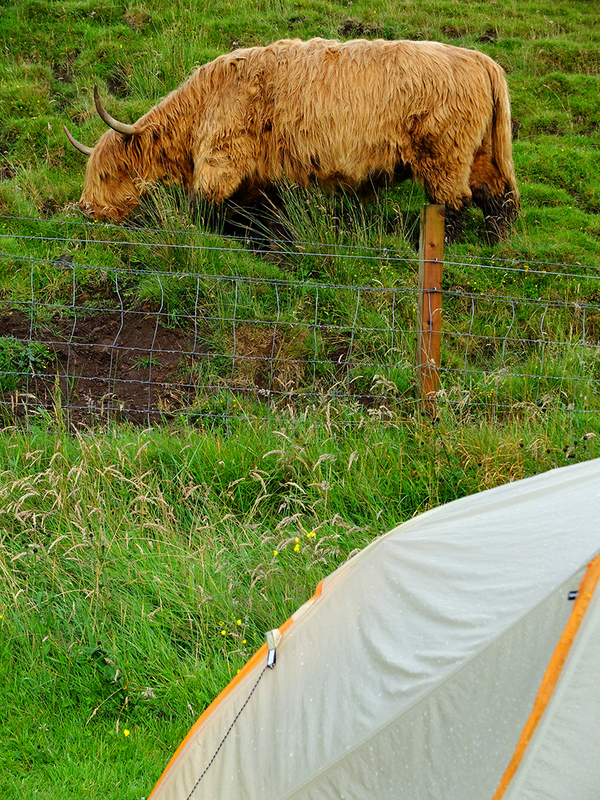 We camped in the Quiraing, but unfortunately we were too exhausted to hide ourselves as well as the medieval cattle and there was a steady stream of hikers passing within hailing distance of our tent site. We spent the next morning exploring the maze and hiking back up onto the ridge in order to look down on the geological mess. When we hiked out and back down to the road, we realized that we weren’t sure where our car was. I was 100% convinced that it was to the left, and Carl was 100% convinced that it was to the right. I sat at the trailhead with our backpacks and waited in the pouring rain while Carl walked down the road in search of the car. Luckily he was correct and he found the car before too long. 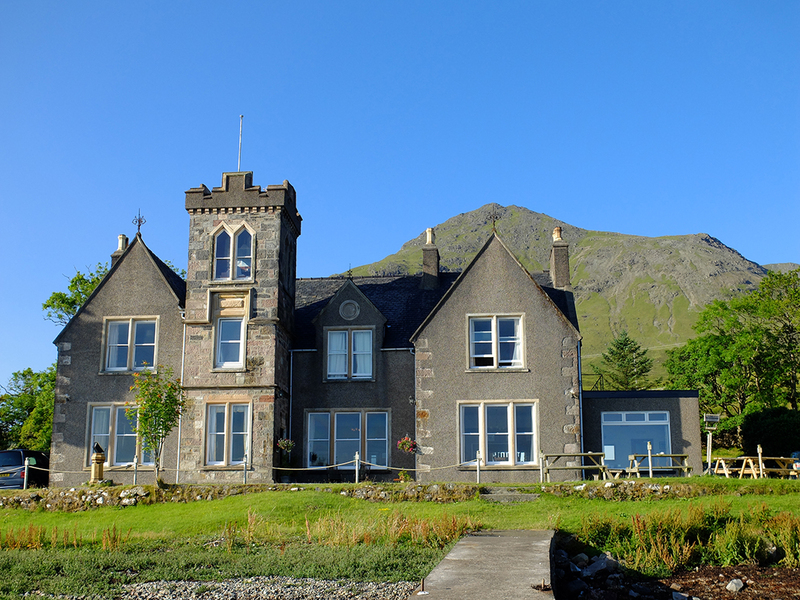 That night, we luxuriated in a warm bath, a gourmet dinner, and a soft, dry bed at Sconser Lodge, a Victorian-era hunting lodge that’s now a bed and breakfast. Carl’s parents had stayed there on their Scotland trip 25-ish years ago, and they loved the experience so much that they gave Carl a birthday gift certificate for dinner during our trip. Our meal of hand-dived sea scallops, stuffed pheasant, and sticky toffee pudding was truly a memorable meal. The next day dawned clear and sunny, the one truly beautiful, clear day of our entire two-week stay on Isle of Skye. After a full Scottish breakfast at the lodge, it was too late to attempt a summit in the Cuillins, so we decided to hike around the base of the mountains and gaze upward at the jagged peaks instead. We followed a delightful river uphill as it tumbled down a long series of small waterfalls. We reached a low pass and continued on the other side into the valley of Coire na Creiche, which is ringed by yet more saw-toothed peaks. We spent a couple of hours eating lunch, gazing at the view, and following rock climbers through our binoculars. We then decided to “summit” an “unnamed” peak, really a rounded foothill with a gorgeous, panoramic view of the Cuillin mountains. As a reward for our climbing effort, we treated ourselves to a bar of chocolate, a delicious accompaniment to a jaw-dropping view. On the way back to our car, we stopped at the foot of one of the river’s many waterfalls for a swim. We sat in the river while the waterfall pounded down on our backs and shoulders, giving us a massage. The next two nights, we camped at a campground with hot showers on the shore of Loch Greshornish while we spent the days looking at prehistoric and historic sites. 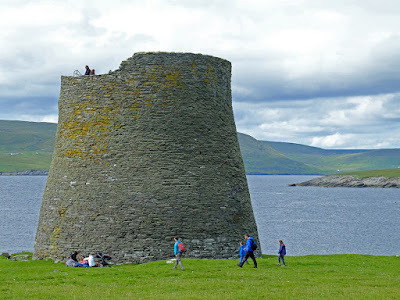 First was the ruin a Bronze Age broch at Dun Beag, a combination fortress and boastful manor house. Next, we hiked over a cow pasture to a souterrain, an unbelievably long and narrow man-made tunnel constructed of stone slabs spanning over stacked stone walls and then covered over with dirt to look like a natural hill. Archeologists aren’t quite sure what the souterrains were used for, but the main theory is that they were used to secretly store goods. This theory doesn’t quite seem right to me, because eel-ing one’s way through a long, damp tunnel to retrieve one’s butter doesn’t seem very convenient to me. I’d be more inclined to guess that they had something to do with burial rites, but who knows. our next stop was at St. Columba’s Isle, a small island in a river. The islet was the site of Skye’s original cathedral, but today, there’s nothing left but a ruined chapel and an atmospheric cemetery with an even more atmospheric gravestone featuring a stone relief of a knight in armor. The next day, we continued our prehistoric streak and stopped at another Iron Age souterrain; this one has been excavated and I was interested to learn that they are crooked in plan. Perhaps it was due to the excavation, but this souterrain was slightly roomier and lent a bit more credence to the idea the tunnels were used for storage. We also stopped at a site with the imprints of three round stone huts. I thought these were interesting because it wasn’t until the Vikings arrived that the Celts built buildings with right angles. Before that, everything was round. 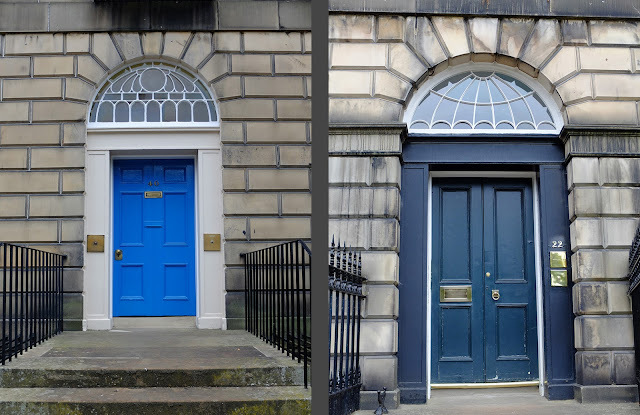 The habit of rounded corners seems to have lasted well past the Viking era as we found that even some medieval crofts and manor houses had rounded corners. This ruined manor house from the historic era has right angles at one gable end and a rounded wall at the other end. Our last day on Skye, we drove out to the ruins of Trumpan Church where an entire clan was burned alive in one act of a centuries-long inter-clan war. The church was very lonely sitting on a cliff at the end of the world, but even more memorable was getting stuck behind quintessential Scottish sheep on a quintessential, narrow Scottish road. Their wagging tails as they trotted up the road in front of our car were just wonderfully cute. Skye is just beautiful. Unfortunately, the rainy, cloudy weather hides the beauty much of the time. 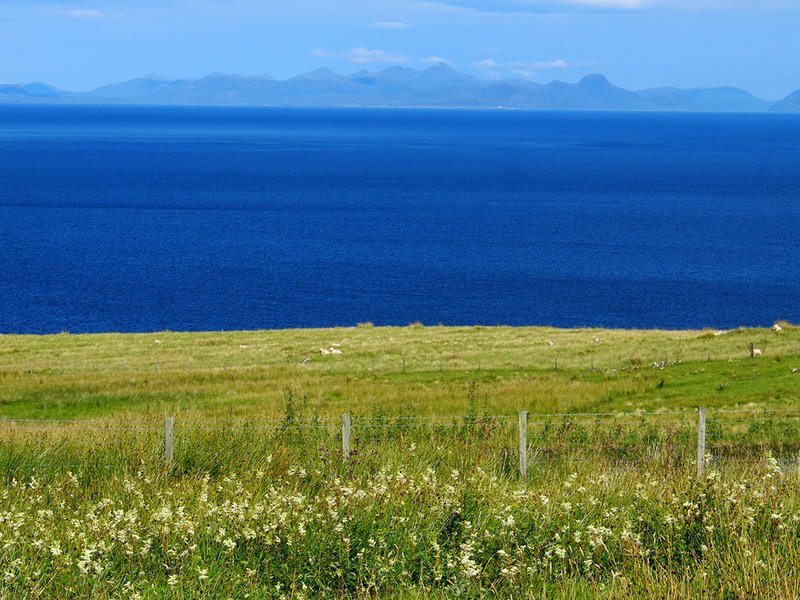 We did have the one gorgeous day, but we battled rain on and off every other day of our two-week stay on Skye. We did get lucky enough to see most of the scenery along our two backpacking hikes, but much of the rest of the island was hidden from us. Sadly, one of my main impressions from this trip was from rain....And from midges, tiny biting insects that are a bit bigger than no-see-ums. As soon as the wind dies down, they come out in full force. Between the rain and the midges, we weren’t able to sit outside all that much this trip, and we spent quite a lot of time in the evenings reading in our tent instead of gazing at the view as we had hoped. Another background worry was Carl’s boots, both of which decided to fall apart at the beginning of the trip. He was able to hold them together first by cutting up our drying line piece by piece and tying the sole onto the boot, and later by using duct tape. The boots held long enough to just barely get him through the trip, but Carl did leave them behind in Scotland at the end of our trip. This summer, Carl and I spent our summer vacation in Scotland. 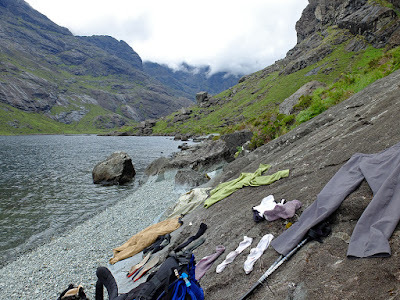 Our main destination was to go backpacking on Isle of Skye, and while we were at it, we decided to spend a few days in Edinburgh and a few days in the Outer Hebrides. I had been in Edinburgh before, when my dear friend Chad and I took a train up from London in 2006 (he was working for a year in the Big Smoke and I spent the summer couch surfing amongst my many friends that happened to be working in London that year). 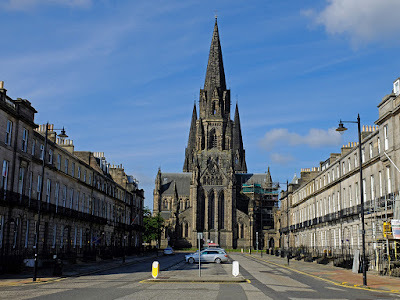 Sadly, my memories of Edinburgh are a bit clouded by a terrible cold and bronchitis that I was suffering that weekend. So between the time lapse since 2006 and my memory lapse due to being ill, it was high time to get back to Edinburgh. I was especially excited about Edinburgh after my interest was piqued from reading about it in an urban planning book. The Georgian “New” Town was planned in the mid-1700’s and the original city plan as well as a heavy majority of the original buildings are still intact. I don’t remember the New Town at all from my first visit, but this time, I completely fell head-over-heels in love with the city. First of all, the city is a wonderful scale—just big enough to have culture, distinctive neighborhoods, a variety of shopping and restaurants, and a lot of diverse sites explore while still being small enough to be easily navigated. Very few of the buildings diverge from the Georgian four or five story maximum. Grey stone unites a large majority of the facades. Major, middle, and minor streets still fit their original pattern. Many of the original visual axes and termini still function in their original roles. 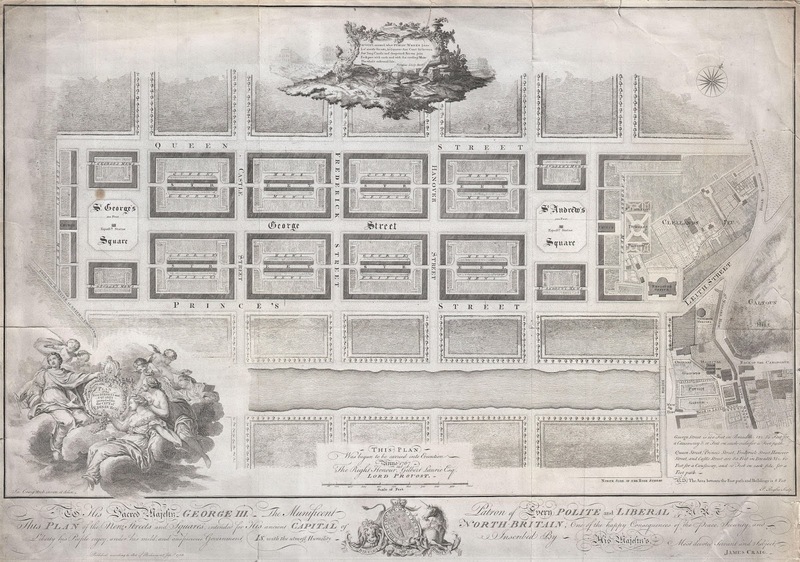 The New Town was designed by James Craig in 1766, and it runs parallel to the Old Town’s ridge. A long, main street forms the commercial axis between two green squares, and two parallel secondary streets were lined with townhouses. Left: Main commercial street. Right: Small residential street. Behind the secondary streets, inner blocks containing the mews and reached by alleys keep deliveries, trash, and servants out of the public sphere. These three parallel streets are crossed by several cross streets that seemed to be designed as a mix between the wide commercial main street and the smaller residential streets as the cross streets were medium-wide and had businesses at the street level and residences above. Today, these New Town appears remarkably homogeneous, but the city council was apparently disappointed at the mish-mash nature of the buildings that were springing up. 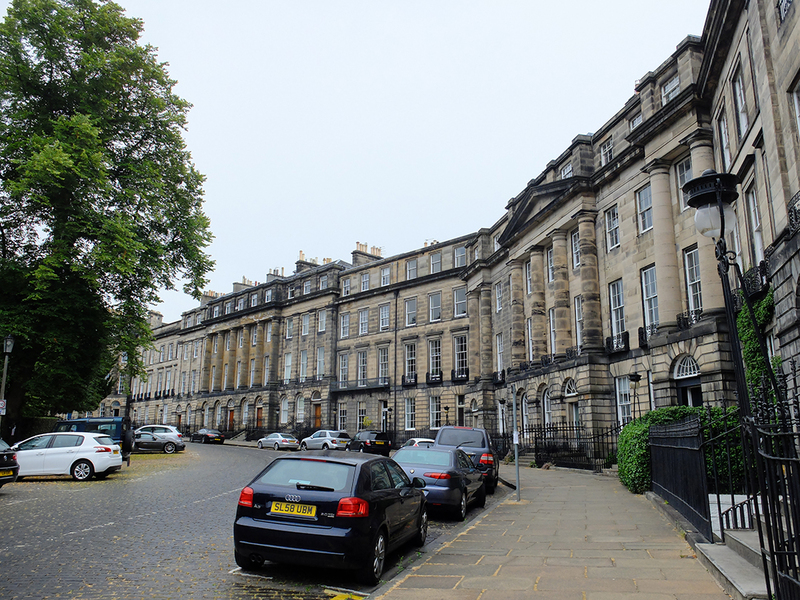 They hired Robert Adam, the Georgian architect, to design the buildings around Charlotte Square in 1791. Adam’s buildings are much more pompous than most of the other buildings in the New Town. But while the facades are scaled like palaces, there buildings behind the facades are actually “modest” townhouses. The townhouses don’t even follow the lines dictated by the facade; we visited a townhouse museum that has one window in the “unadorned” section and two windows in the more prominent “temple” section of the block. Left: The three columns of windows in the middle of the image belong to one townhouse. Right: The end pavilion appears to be one residence, but the left-hand column of windows actually belongs to the townhouse next door. 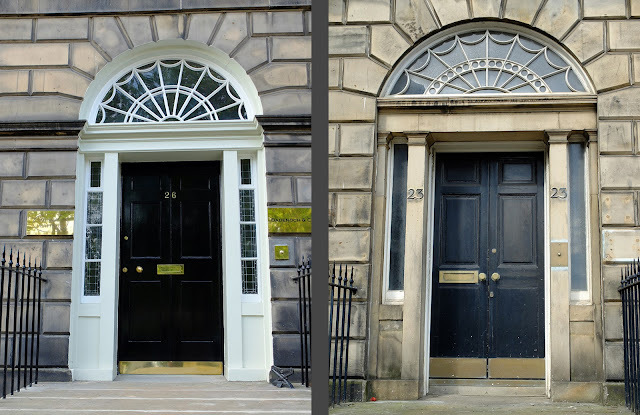 It seems that the art of the townhouse was mastered in Edinburgh. Even neighborhoods that were clearly designed and built in the Victorian era still follow the Georgian pattern of crescents and circuses of townhouses enclosing a private, green park. Georgian patterns were repeated in various forms for at least 150 years after the original New Town was designed. Even though the townhouses are exact copies of each other, house after house after house, the curvature of the streets is enough to create visual interest. 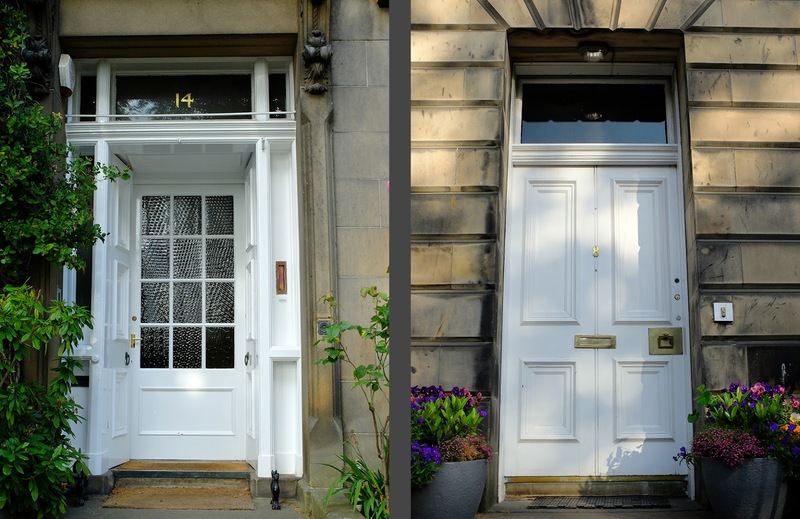 The houses at the corners and sometimes in the middle of the block are often larger and diverge slightly from the marching rhythm of the street, providing visual accents and bookends to the repeating patterns. The private parks in the middle of the crescents and circuses caught my interest, too. 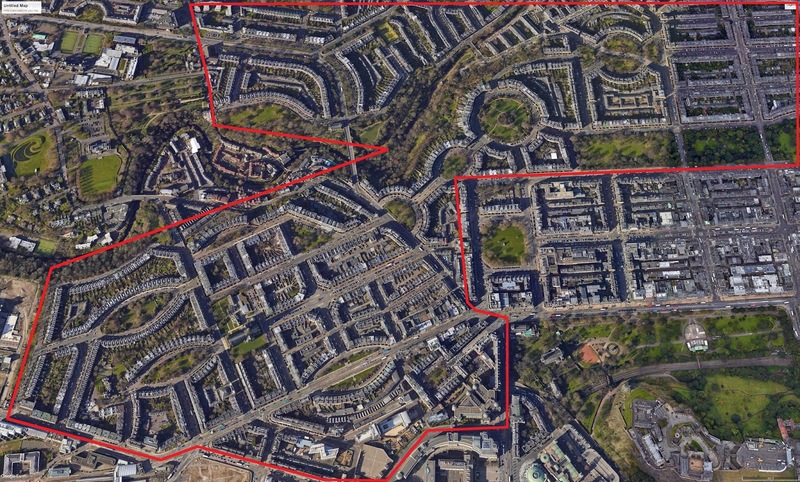 In this day and age—especially after living in Sweden for seven years, a country where no land is really ever off-limits to the public, even when privately owned—it is hard for me to comprehend that such a HUGE percentage of Edinburgh’s green space (70%? 90%?) is completely fenced off from the public. Unless a child is born into a wealthy, town-house owning family, it seems that there is a very limited choice of parks or playgrounds available to that child, and many open spaces throughout the city have large signs specifically stating that games involving balls are not allowed. Even more astounding was that the private parks seem to be very sporadically used. Even though we walked around in the evenings, in fine weather, we saw a total of two people inside the private parks. 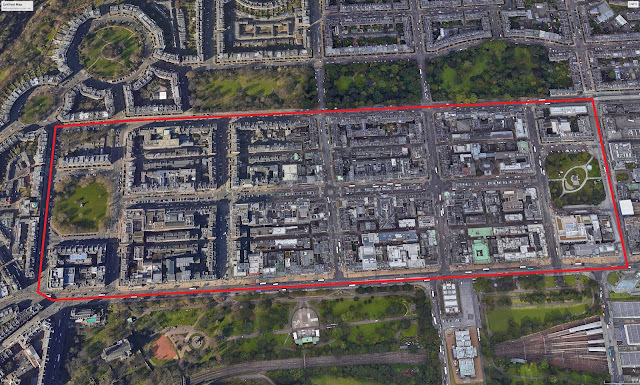 While I really feel strongly that the parks would be a better use of space if they were available to the general public, I did still really appreciate how the sheer number of green crescents and circuses make Edinburgh perhaps the greenest city I have ever experienced. Just about every block has its own park, and the parks are not small. 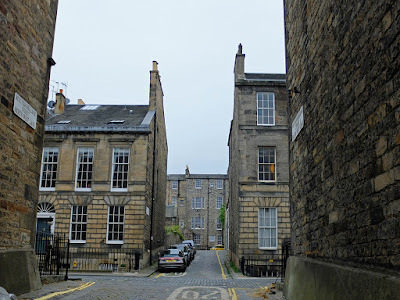 Edinburgh really stands out because of it’s Georgian “New” Town, but we also enjoyed wandering around the alleys and courtyards of the Old Town. The courtyards seem extraordinarily underutilized—despite being the high season and summer there were very few cafés, restaurants, or bars taking advantage of them. The castle has good views, but really, the best part of the castle is looking up at it from the surrounding park. 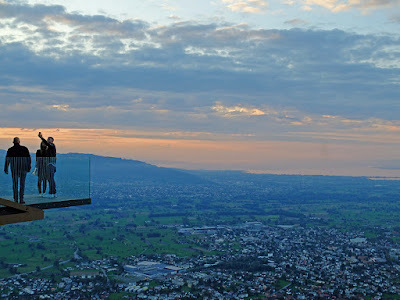 It is impressively high and impenetrable! We also toured through Holyrood Palace, the Queen’s summer home for a week or two every year. The original wings are much older and started as a medieval monastery, but the palace got a big make-over in the Georgian era, giving it symmetrical facades that fit in with the New Town. 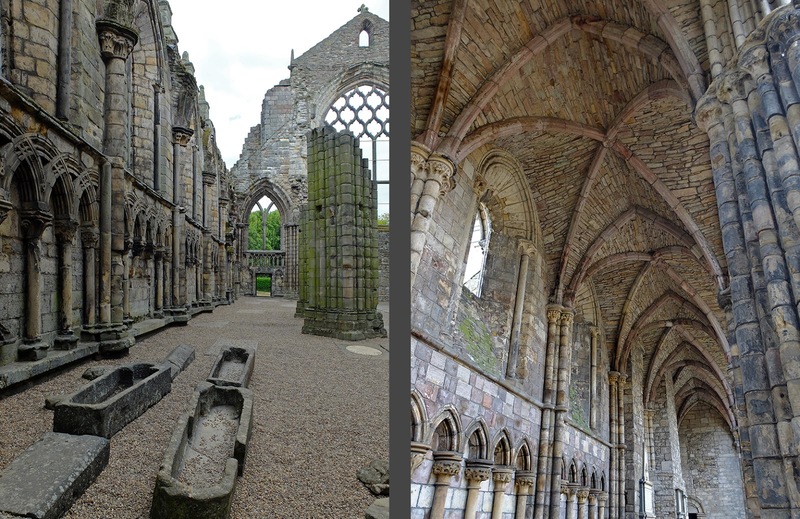 The interiors were nice but didn’t particularly stand out, but I loved the ruined monastery chapel. As an architect, it's always interesting to see how such lofty buildings were constructed, how they fit together behind the plaster that so often covers up the individual stones. From the palace’s lovely garden, there are good views of Arthur’s Seat, a peak above the city. The parkland around Arthur’s Seat is part of the palace grounds, but is open to the public and is an amazing urban amenity—you can start your day hike from your font door! We spend a lovely couple of hours hiking up and along the dramatic bluff, looking down on the old town and the castle. We also enjoyed wandering through Dean Village, a historic neighborhood down by the river. Dean Village and a very lived-in mews. There’s a lot to see in Edinburgh, but there’s also a lot to eat and drink! We tried one restaurant that specializes in turning seldom used parts of livestock into gourmet meals, and it was quite good. We also spent a couple of hours in a couple of different pubs. In one pub, three older-middle aged men came to our table and struck up a conversation about soccer, Italy, and Edinburgh. In general, I was really impressed with Scottish pubs because they really do function as the city’s living room. People of all ages and different socio-economic backgrounds share a pint together, with their children and their dogs, sometimes with a game on or sometimes with a live band. Edinburgh’s parks may be segregated between rich and poor, but the city’s pubs are a common ground for all. This crescent isn't actually rounded. Well, to explain this trip, I’m going to have to explain a bit of backstory: Hilary is one of my dearest friends. We went to architecture school together at Georgia Tech in Atlanta. Hilary’s younger sister, Susanna, studied abroad in Scotland. While abroad, she fell in love with Johannes, a Swedish architecture student who also happened to be studying in Scotland. After graduating, they eventually got married and settled together in Sweden. 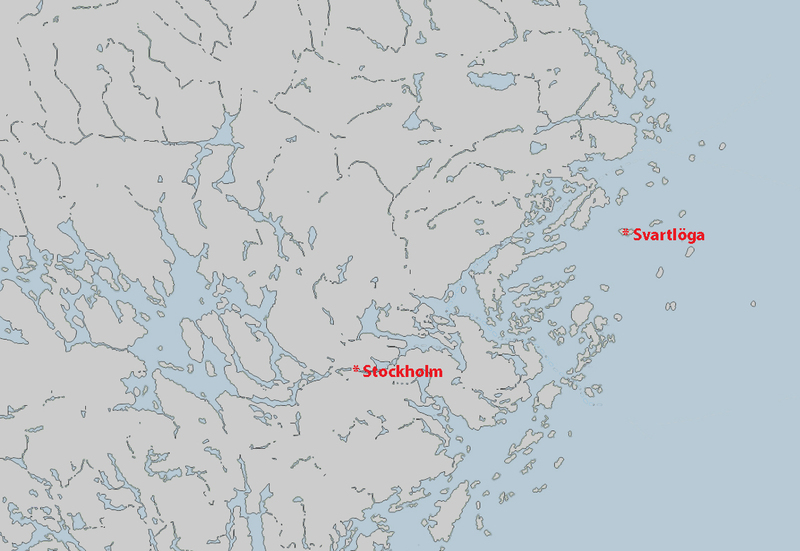 They have moved around southern Sweden a bit as Susanna went to grad school and Johannes worked in several different offices of a large Swedish firm. A few years ago, they finally settled in Malmö. Ever since Carl and I moved to Sweden, we have gotten together with Susanna and Johannes every now and then, although the physical and mental distance between Malmö and Stockholm gets in the way far too often. When their daughter Agnes was born, Carl and I were asked to be her fair-weather godparents. And to make the already complicated story even more entangled, Johannes started work at the Malmö office of my architecture firm last winter. Since both Johannes and I were going to be in Göteborg for our office’s annual summer party anyway, we all decided to make a weekend of it. 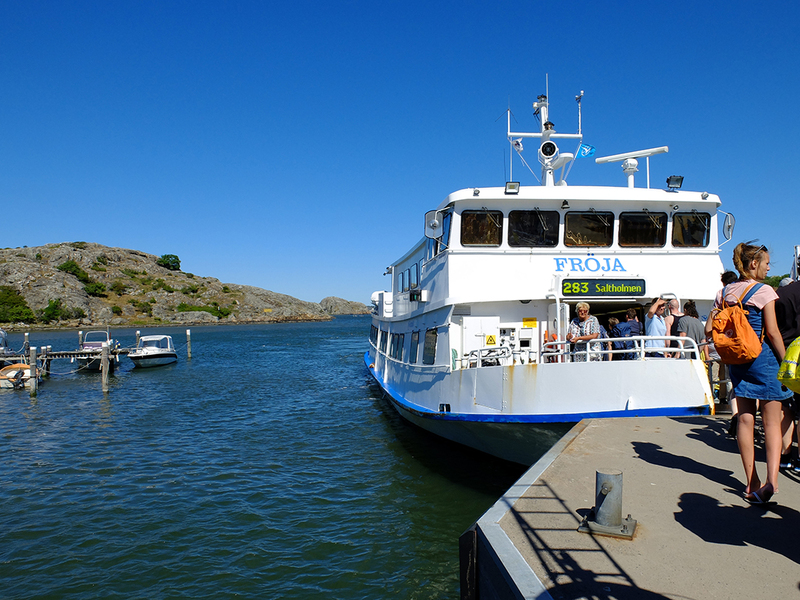 After the party, we took a ferry out to Brännö, an island just off the coast right outside of Göteborg. 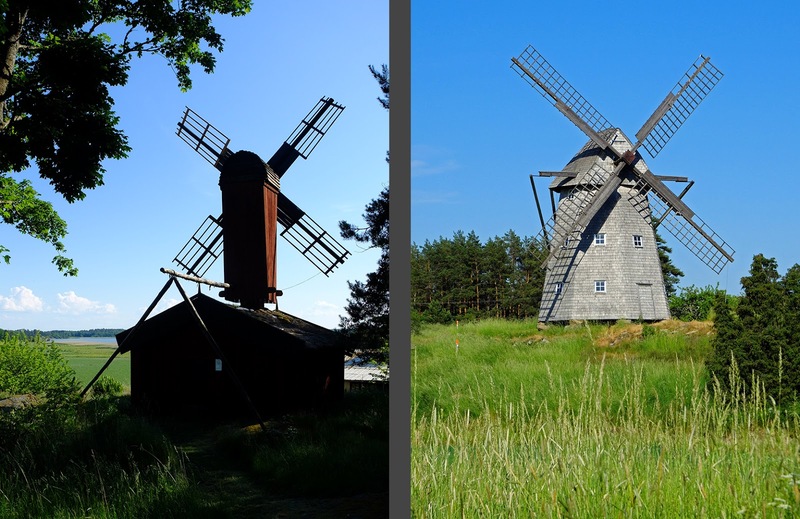 Brännö is within commuting reach of Göteborg, but it has retained a village-like charm and scale. Outside of the main village, the island is mostly undeveloped and there is a large nature reserve at the far end. After a beautiful but surprisingly short ferry ride, we dropped our bags off at our cute if overpriced pension then headed to the island’s official swimming area for a picnic and a dip. After a long, relaxing afternoon at the beach, we went for a beautiful walk through the island’s wooded center to the far beach. The island feels so remote and pastoral that it was a bit of a chock to be able to see the giant cranes of Göteborg’s harbor in the distance. The next morning, we had a leisurely breakfast before heading across the island to Galterö Nature Reserve for a hike. The Nature Reserve is on another small island, just across a narrow canal from Brännö. Galterö is still used as pasture, and we saw a number of grazing sheep, but it is mostly undeveloped. The landscape of green pastures nestled between bulbous rock outcroppings was just beautiful. The hike wasn’t so long but the terrain and scenery was quite varied. Three-year-old Agnes had some trouble balancing on the bog bridges but she was a master at running ahead and tagging all of the trail markers before the rest of us could catch up. (Super smart game to keep a three year old on the move!) The water was beautiful and inviting and we eventually succumbed to a refreshing swim before a picnic lunch. The Göteborg Archipelago isn’t really all that different than the Stockholm archipelago, but somehow it is. The rock is rounder, redder, and bulbier. The beaches are sandier. There are no pine trees. The water is bluer in comparison to Stockholm’s nearly black sea. There’s a lot more wave action. The villages are larger and more concentrated. Fishing dominates over farming. All too soon, it was time to hike back to Brännö and to the ferry back to Göteborg. Meeting “in the middle” for a little adventure was a wonderful way to see Susanna, Johannes, and Agnes; I’m so glad it worked out to see Brännö together! 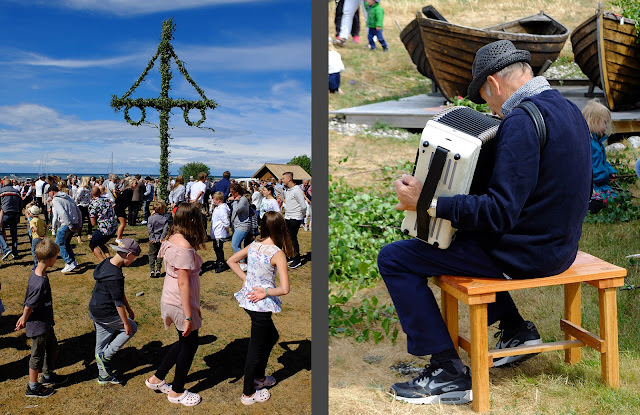 Carl’s sister and her family come to Sweden for three to four weeks every June, and by this point we have accumulated quite a long-standing tradition of celebrating Midsummer’s with them and with Carl’s parents. This year, though, we all met up at Carl’s parents’ house on Gotland instead of our usual celebration in Stockholm. 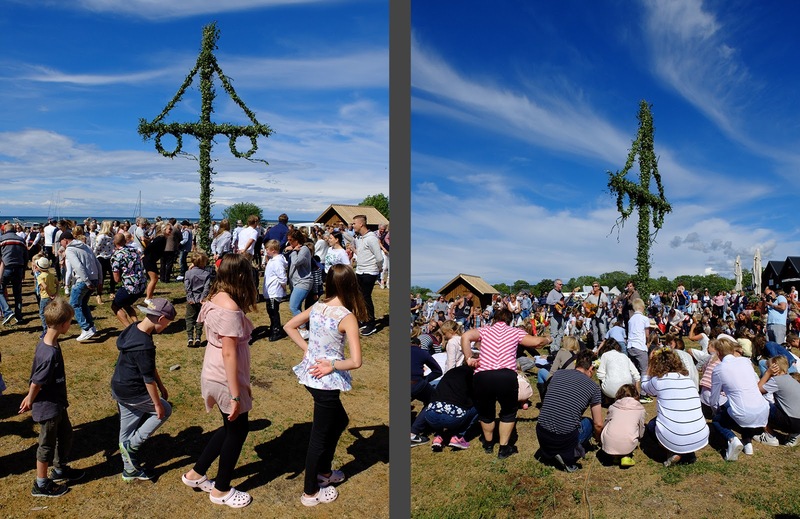 then with dancing around the Midsummer pole at Lickershamn’s small harbor. Many of the songs were familiar, but with a small Gotland twist to the lyrics. That evening, Carl’s mom prepared us a huge Midsummer’s smörgåsbord with lots of different flavors of pickled herring, smoked salmon, cured salmon, Swedish meatballs with lingonberries, sausages, new potatoes, a traditional potato and sardine casserole, and much more. For dessert we had a huge strawberry cake. After dinner, Carl’s nieces arranged a ping-pong tournament in the garage. Despite all my ping-pong playing at work I came in third or fourth. 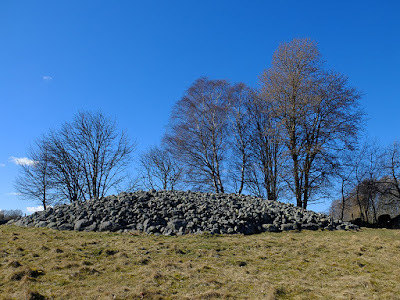 The next day, we explored a few nearby prehistoric sites including an intricate early Iron Age grave that was discovered during road work in the 70’s at Stenkyrka. The grave is a giant stone-lined “wheel” with two stone boxes asymmetrically placed at the center. The boxes had already been plundered when the grave was discovered. The wheel grave was at the edge of Gotland’s largest grave field at Lilla Bjärs, a grave field with over 1000 grave mounds dating from the Bronze through the Iron Age. These graves have also been plundered and damaged over the centuries, but we could still make out several of the stone boxes that were originally at the heart of the mounds. We also visited a prehistoric fort atop a waterside cliff at Bygdeborg. From the cliff, you get a clear view of several small fishing harbors and a long stretch of coastline, so it is easy to understand the location’s strategic importance. The cliff served as the defensive barrier on one side, but on the other side, a large wall of stacked limestone was meant to keep out the enemy. Inside the fort, we had a lovely picnic fika while looking out over all that beautiful water. While the whole family was assembled, Carl’s dad took us to Visby’s cemetery to see the graves of several ancestors that died in the 1800’s. Afterwards, we wandered through Visby—always charming, the town was especially beautiful with an abundance of roses blooming along the town’s lanes. 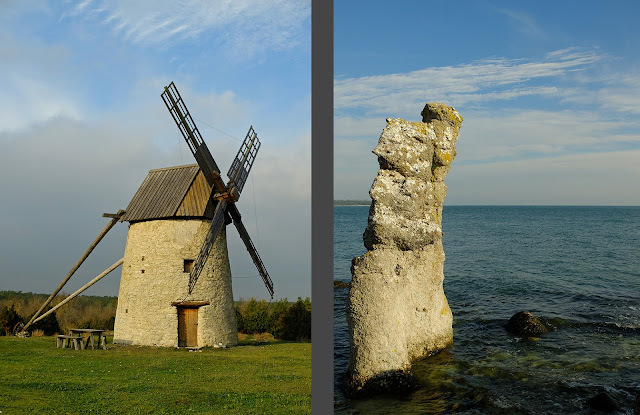 It was a short and intense visit to Gotland, but we still managed to see and do a lot on the always lovely island. Thank you everybody! Stockholm’s gorgeous spring/early summer continued without a break for weeks after our camping trip in Riddersholm’s Nature Reserve (see below). 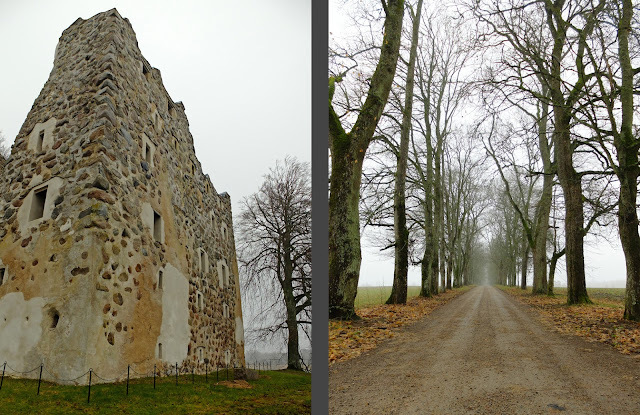 Weeks upon weeks of uninterrupted sunshine and warm temperatures is, to say the least, unusual in Sweden, so we decided to take advantage of the guaranteed beautiful weekend and take a little road trip to visit Läckö Castle which has been on our list since we moved here. We rented a car in Stockholm early on Friday afternoon and in our usual fashion, we stopped at a couple of other, smaller sites on our Sweden to-see map. First on the list was a very special rune carving carved directly onto the face of the bedrock. 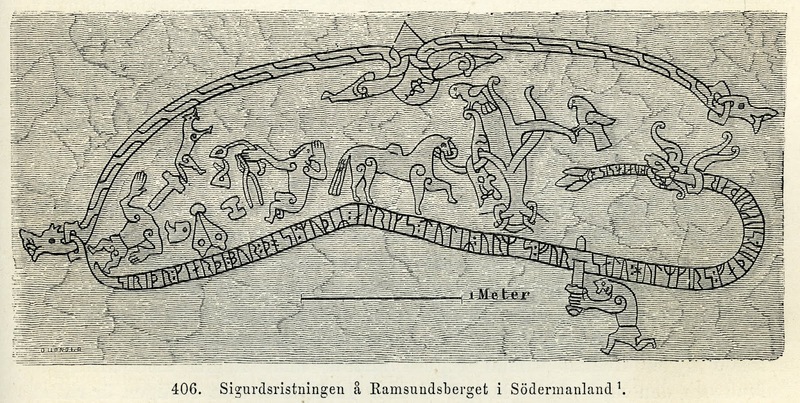 The rune carving does have a rune-filled snake with text and a message like the average rune stone, but inside of and interacting with the snake is a complex carving depicting the ancient Sigurd saga. The average passer-by at the time (about 1000 A.D.) would have understood the reference to the story as well as the significance of why that story was depicted in that specific place. Today, the association is lost and we don’t really know why the patron would have requested that particular story, but the best guess is that since the patron’s name was similar to the hero of the saga, perhaps she was trying to establish a connection between the hero and herself. The lighting wasn’t that great when we were there, so our photos don’t at all show how impressive the carving really is. I’ve included an image from Wikipedia. On the left, a man has been beheaded. In the middle, there’s a horse and birds in a tree. On the right, a man stabs the snake (dragon) with his sword and kills it. It wasn’t a planned stop, but the countryside Jäders Church was so unusually ornamental for a small, rural parish church that we had to screech to a stop. 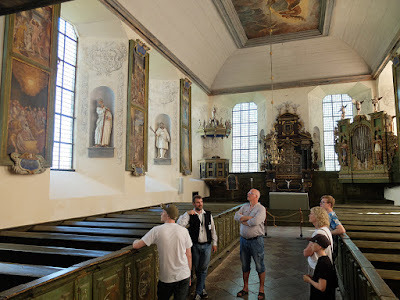 It turns out that the existing church from the 1100's and 1400’s was renovated in the 1600’s, Sweden’s wealthiest period, by one of Sweden’s wealthiest nobles to serve as a burial church for his family. Naturally, the architect was the period’s starchitect, Nicodemus Tessin, none other than the king’s court architect. 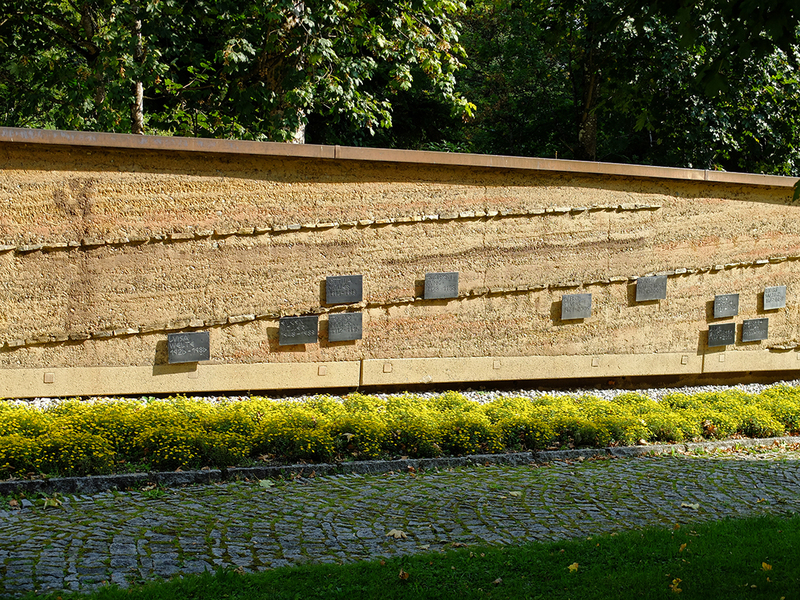 Like many of the churches in the area, fragments of rune stones were used as building material. They were once covered over by plaster but are now visible. Another rune stone was found under the church floor during a renovation and was moved to the church yard. This stone is unusual because part of the text is on the stone’s side. After traveling through Central and South America, I’m used to the idea that the Catholic Church used the building materials and sites of pagan temples for both practical and symbolic reasons, but I am curious about why early church builders used rune stones as building material when many of the rune stones are clearly Christian with their carved crosses and were even erected specifically to advertise the patron’s Christian belief to the world. Despite the crosses, was the non-Latin rune alphabet considered pagan? And since we were right down the road, we made a super quick stop at a Sundbyholm Palace, originally a medieval convent which was confiscated by the Crown during the Reformation. It has been rented out to various nobles for the last 500 years and is most famous because Sweden’s beloved artist Prince Eugene once painted the building. Eventually we had to stop making stops in order to make progress south toward Läckö Castle. We arrived late and quickly set up our tent in the castle’s campground, made a quick dinner, and went to bed. Läckö Castle was also property of the Church before the Reformation. As the area’s many pre-historic finds demonstrate, the area was certainly of strategic importance well before being first named in written sources. 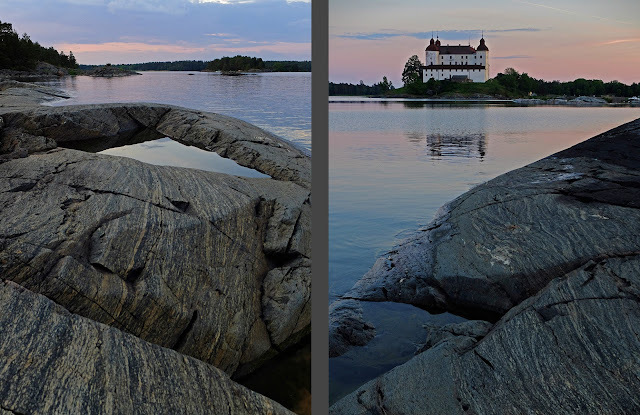 The Castle is located on a narrow, high peninsula jutting into the enormous Lake Vänern (Sweden’s largest lake) which was almost certainly a pre-historic hilltop fortress before entering the written record when it was built into a medieval castle by the local bishop in 1298. This particular bishop was one of Sweden’s wealthiest individuals, and at the time, Vänern’s shoreline was the much disputed border between Sweden, Denmark, and Norway. The castle’s location was unquestionably strategic in defending the riches of the Skara diocese and of the bishop himself. In addition to defense, the castle also served a political purpose. Much like the King, the Bishop owned a number of grand residences (supported by enormous farm estates) around his territory. One of the barns on the Läckö estate, and the road leading to the castle through the farmland. The only way to keep control over the power-hungry priests was to travel around and stay for a time at the various residences. The area’s important nobles could also be entertained and perhaps persuaded to donate to the church while the bishop was in residence. 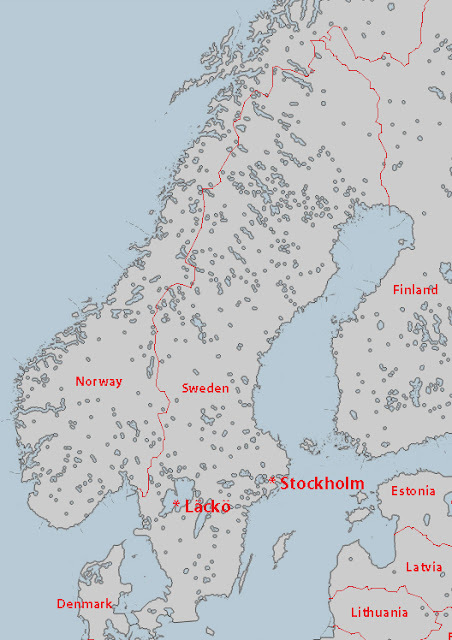 Over time, Läckö was developed into the Skara Bishop’s most magnificent residence. Originally, the castle consisted of a moat, a rectangular defensive wall, a small stone chapel and a relatively modest stone house inside the wall, and a defensive tower. 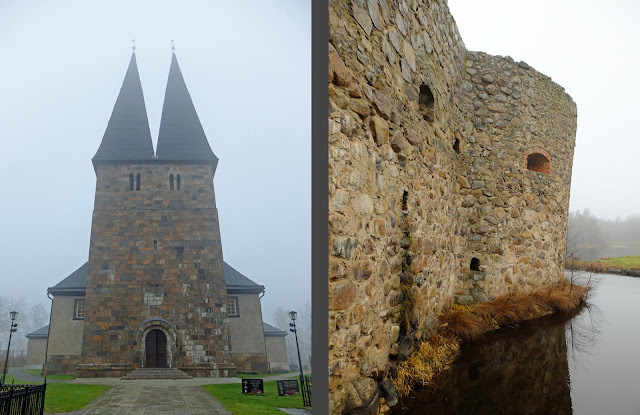 These facilities were added onto and rebuilt over the centuries until it began to resemble today’s castle in the 1600’s. Courtyard inside the wall, then interior courtyard inside the main body of the castle. The castle was confiscated by the Crown in conjunction with the Reformation when it and its supporting farms were granted as a fiefdom to the powerful De la Gardie family. After securing unimaginable wealth during the Thirty Year’s War, The De la Gardie family updated the castle’s interiors in the 1600’s. Today, the castle is known for these well-preserved Baroque interiors. Actually, none of the furniture survived, but the walls and ceilings still retain their Baroque decoration and painting, most of which celebrate the family’s military successes in the Thirty Year’s War. While the rooms for entertaining are opulently painted and decorated (by Swedish standards, the French monarchy would have scoffed! ), the chapel is visibly post-Reformation with its relatively sparse ornamentation. Läckö Castle’s peninsula location is makes its walls and towers extra picturesque, and Carl and I spent a good bit of time gazing at the castle while lounging in the shade, picnicking, reading and sketching, and night swimming. Evening temperatures in Sweden are never warm enough to allow for night swimming, but this spring’s unusually warm weather was perfect for an 11 p.m. dip to cool us off before crawling into our tent. Night swimming. Sunset colors at 11pm. and Stola manner house. While the churches themselves weren’t overly impressive, they all had an impressive array of early-medieval gravestones that are now almost 1000 years old. Gösslunda church had an interesting carving of a centaur with sword and dagger at its front door; the mythological figure was supposed to keep the evil spirits away. Despite this spring’s lack of rain, the agricultural area was vibrantly green and stunningly beautiful. 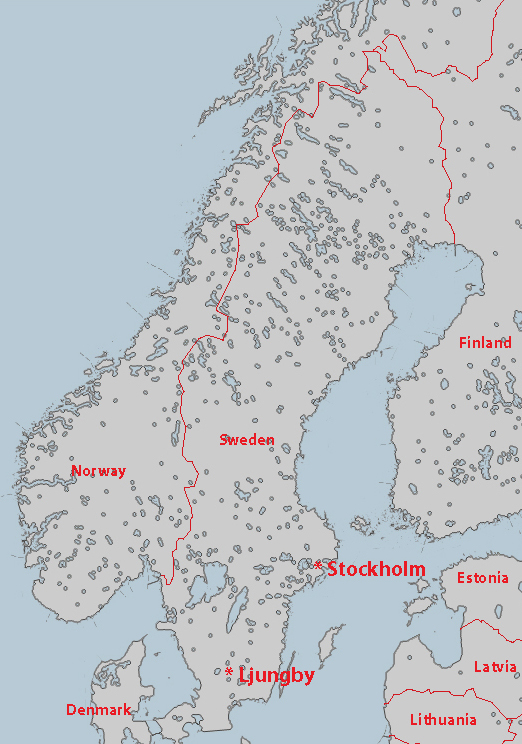 This area of Sweden is much flatter and much more fertile than Stockholm, which means that the farm fields stretch much farther and encompass much larger areas of the landscape. Västergötland’s landscape is not a wild beauty, but a cultural beauty with a visible agricultural history stretching back for millennia. On the way home, we stopped at a site that we had never heard of before, Källby Hallar. The site consists of two unusually tall rune stones standing on either side of a historic road. The stones create a passage or mark a boundary of some sort. One of the stones is unusual in that a human or mythological creature is carved on the middle of the stone. Possibly the figure is the Nordic god Thor. We also stopped at yet another church, Husaby. This church has been on our list because of its unusual tower which is dimensioned more for a cathedral than for a parish church in the countryside. It’s unknown today who had the tower built or why, but it was built around 1100. The name of the village points to the area being one of the early monarchy’s many properties through which the king constantly rotated in order to keep an eye on the locals, and the area also hosts the ruin of an early bishop’s castle (a smaller version of Läckö), but the church tower could just as well have been built by a local clan chief or to celebrate the baptism of Sweden’s first Christian king who was baptized in a spring just below the church. Left: ruin of the Bishop's Castle at Husaby. 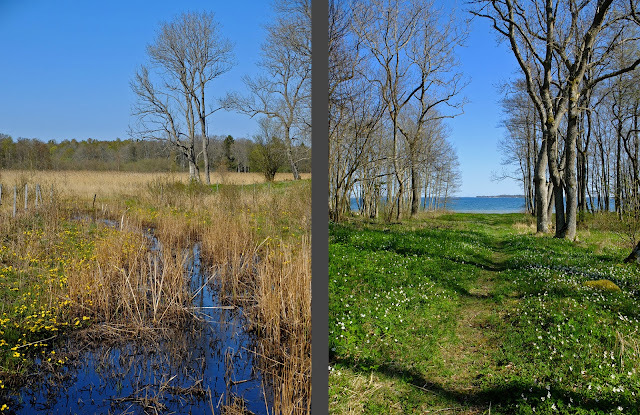 Right: Spring where Sweden's first Christian king was baptised. Husaby also had a number of nearly millenia-old gravestones. Not even a kilometer from Husaby Church is a large area of Bronze Age rock carvings at Flyhov. The scope of these carvings reminded us of our visit to the World Unesco Site at Tanum (see my post “3000 Year-Old Rock Carvings in Tanum). Many of the themes at Flyhov were similar to Tanum including ships, footprints, dots, sun wheels, warriors, and animals, but this area included large net-like images that were intriguingly different. We took a break from the sightseeing and enjoyed a fika of coffee, tea, and cake in the luxuriant gardens at Hällekis Manner. After a quick last stop at Forshem Church to see its Romanesque carvings, we headed to the highway for our four hour drive back to Stockholm. Long drives in this sunny dry weather and at this time of year when it never gets dark are so much easier than drives on the dark, snowy roads of wintry Sweden. Even so, the drive was slow at times as even this main highway between Sweden’s two largest cities is often only one lane in each direction. Sometimes, the highway is even interrupted by traffic circles! 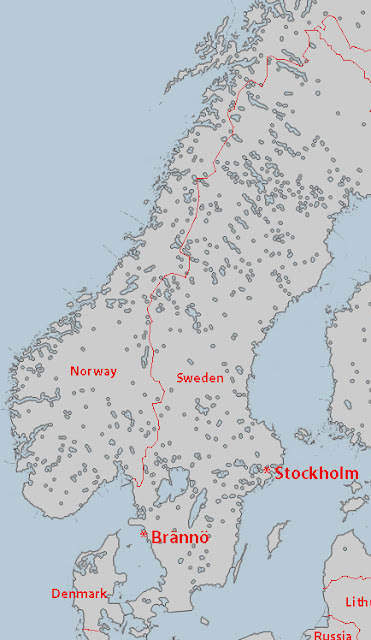 These “highways” are quite the testament to how well Sweden’s train system functions! Two days after my tiring long weekend in San Diego, houseguests arrived. They stayed with us for over a week and we had a fantastic time showing them our beautiful city and catching up on life, but the timing and intensity of their visit left me pretty well exhausted. Two days after our houseguests left, Carl and I had a four day long weekend. We were too tired to do anything major with the weekend, but the weather was too beautiful to just recuperate at home. And besides, four-day long weekends don’t come around so often, so we decided to take a little trip, but a very calm and restful trip. 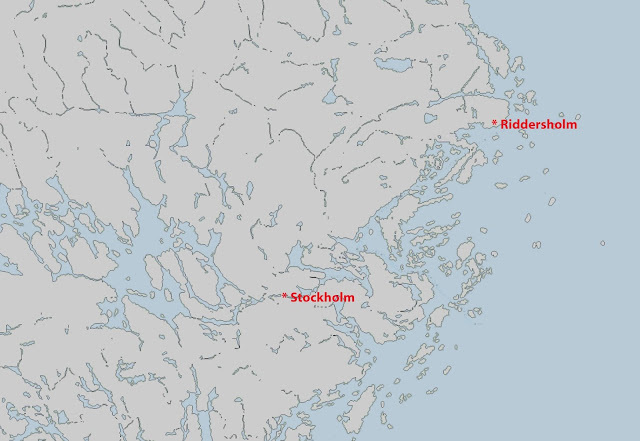 We settled on Riddershom’s Nature Reserve, not too far outside of Stockholm. The area used to be an island, but it is now attached to the mainland on a peninsula that juts far out into the archipelago. Instead of the faster and cheaper bus, we decided to take the ferry from downtown Stockholm, a much more scenic way to travel when time allows. We enjoyed our morning sipping coffee and watching the scenery and cute, cute cottages go by. While Stockholm was fully green and spring was in full swing, the greenery became more and more sparse the farther out in the archipelago we travelled. By the time we got out to Riddersholm, spring was only just beginning. Riddersholm’s Nature Reserve isn’t huge, but considering our exhausted state, it was the perfect size to keep us occupied for three days. After getting off the ferry, we hiked a few miles through the most beautiful wildflower-strewn forest. 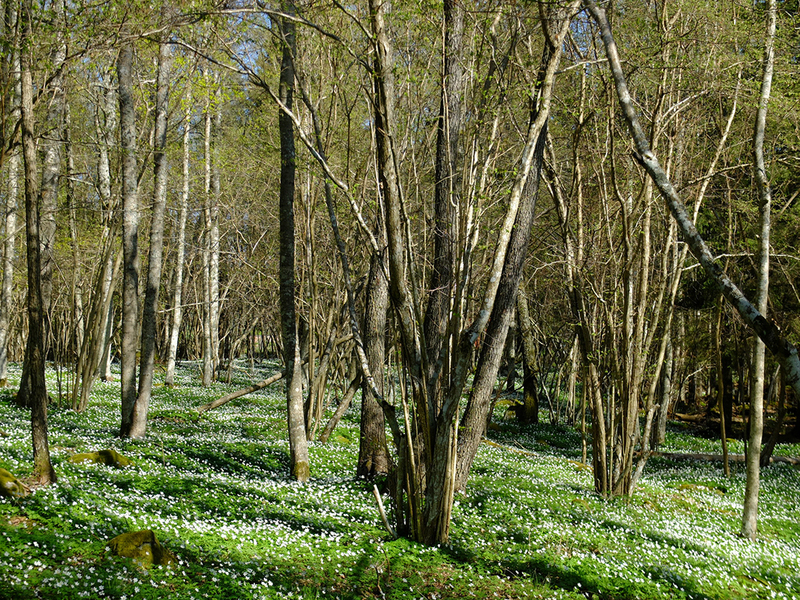 In places, the wood anemones carpeted the forest floor, creating a very magical setting. 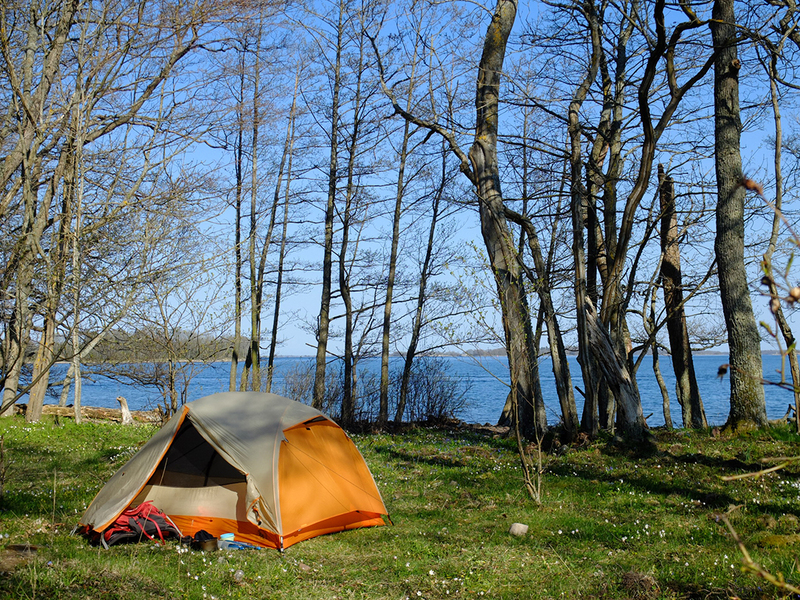 We hiked past a couple of lakes, some boggy areas, through some pastures, and through forest until we found a small peninsula jutting out into the water where we could set up our tent in a small wildflower-covered clearing. We spent the evening sitting at the water’s edge in the sun, reading and watching the giant cruise ships and ferries to Finland motor past. Often I don’t sleep very well in a tent, but this time I slept soundly and solidly and long. We didn’t wake up until around 10 a.m. when a dog on the nearby hiking trail barked at us. We had a leisurely breakfast at the beach then went for a hike around parts of the nature reserve that we hadn’t explored yet. The destination for the day was a windmill from the 1700’s which proved to be a very scenic lunch spot. and even “leaf-gathering meadows” or lövängar where leaves were gathered for winter fodder for the livestock. We took a break in one of these leaf-gathering meadows and read while overlooking a small lake and the Riddersholm Manor. Back at our campsite, we lounged in our hammock for a couple of hours before the sun set and we got chilly; at that point we got out our big fluffy down jackets and started our waterside dinner. we broke camp and made our way slowly to the main road and the bus. On the way, we foraged for a few new-to-us plants. 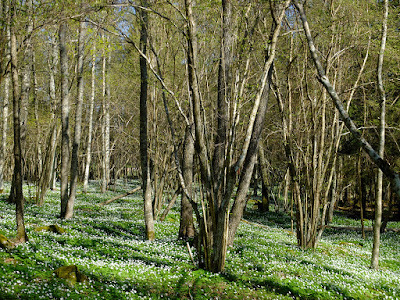 Most notably, several of the nature reserve’s forest floors were seas of ramslök, a type of wild garlic. While the bulb is garlicy and edible, it is very small in contrast to cultivated garlic. 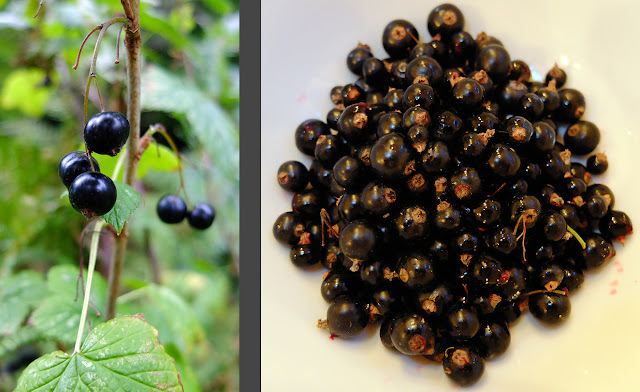 Instead, you pick the leaves and use them in soups, salads, dips, etc. Ramslök is a relatively rare plant, especially on the Swedish mainland, so finding such quantities of it was unexpected and fun. and maskrosor or dandelions. While the Swedish word for cowslip rings quite poetically and roughly means “Yellow Life,” I really dislike the Swedish version of dandelion which translates to “Worm Rose.” Both yellow flowers bloom prolifically in meadows. 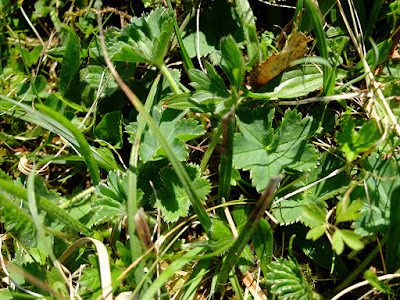 Another poetically named pasture plant that we picked were dagkåpor, which translates to “Dew cover.” In English they’re known as lady’s mantle. Soon enough it was time to head to the main road to catch the bus back to Stockholm. Even though we were gone for three days, the four day weekend meant that we even had an extra day at home after our trip to relax and enjoy being at home—the whole weekend was filled with much needed recuperation after a fun but exhausting month. Crazy as it sounds, I was recently in San Diego for a long weekend. One of my dearest friends, Mia, was getting married, and there was no way I was going to miss her wedding. But, it was bad timing for the work year, and I couldn’t get away for more than a few days. I ended up flying out of Stockholm on Thursday morning and arriving in San Diego on Thursday evening. I flew out again on Monday evening and arrived back home Tuesday evening. So I only had three and a half days in San Diego, and it was a bit of a whirlwind of wedding activity, but I am so glad that I was able to make it out there to Mia’s wedding. The wedding was actually about 90 minutes north of the city in the foothills. The site was gorgeous with no other buildings within sight—just the beautiful, bouldery landscape. There was a scenic bridge over a little creek, a sunny lawn for the ceremony, and tables under ancient live oaks with fairy lights strung between the branches. The setting couldn’t have been more beautiful, and the bride and groom couldn’t have made a more handsome pair. In addition to seeing Mia, I also had a lovely time attending the bride with her sister and meeting lots of family and friends that I had been hearing about for years. I also got to hang out with Brantley, an architect friend from San Antonio, and catching up with him was super fun. It sounds like he might be able to swing by Stockholm for a few days next year, I’m really looking forward to it! I never adjusted to California time, so adjusting back to Swedish time was actually easier than usual. I was pretty exhausted for a couple of days, but I’m actually surprised at how well the long weekend concept worked! Best of wishes, best of luck, and warm congratulations to Mia and Carlos! Oh, Paris. Lovely Paris. This time Carl and I were in Paris for five days over the long Easter weekend. A while back we decided to “do” Paris over a series of weekends since seeing all the sights over one visit would be overwhelming and exhausting and because there are convenient, inexpensive flights from Stockholm. Knowing that we’ll be back in the near future makes each trip quite relaxed—there’s no pressure to squeeze in one last must-see. 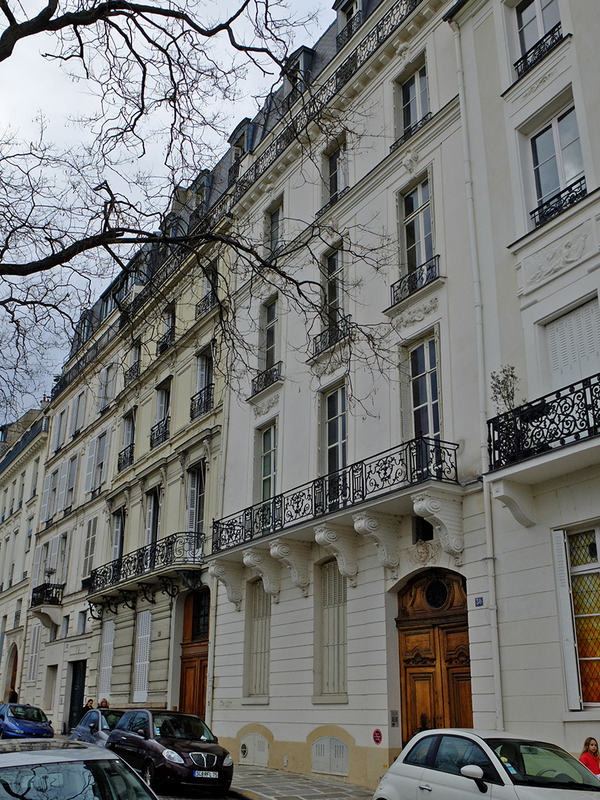 Instead, each trip we dedicate a day or two to must-sees, but the rest of the time we wander the streets of new-to-us neighborhoods, sip wine in sidewalk cafes, eat ripe French cheese on park benches, admire the architecture, people watch in the squares, dine on gourmet French cuisine, and generally try to soak in as much of the Parisian atmosphere as possible. It’s a very relaxed way to sight-see, but we still manage to exhaust ourselves from all of the new impressions and all of the walking. 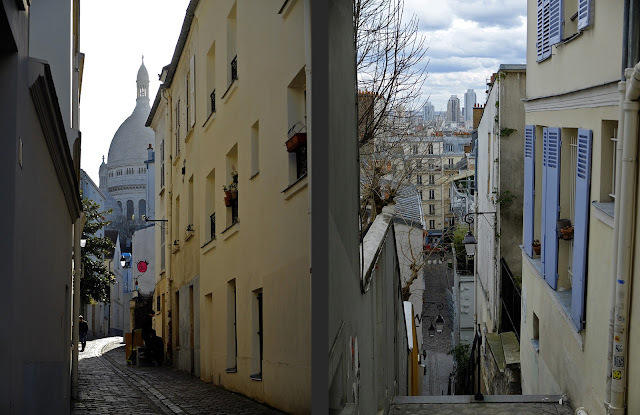 Each trip we stay in a different neighborhood, and this time our home base was Montmarte. We spent the first day wandering every nook and cranny of the village. Despite being in the midst of metropolitan Paris these days, the area does still retain a somewhat villagey atmosphere with curved streets navigating the terrain and a small, low scale of building stock. Especially intriguing were a few standalone houses with gardens behind fences that must be worth millions upon millions today. At the end of winter, the neighborhood’s vineyard wasn’t especially atmospheric but I love that it has survived. 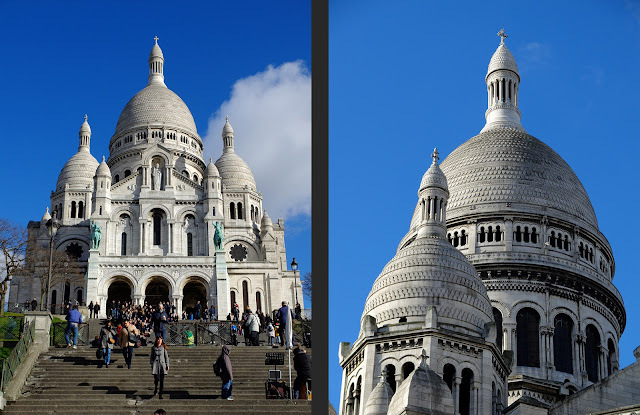 Visiting Sacre Coeur has never been on the top of my list, probably because it is only a century old and doesn’t have the history of the great Gothic cathedrals. But since the church was just up the street from our hotel, we definitely had to stop in—especially given the church’s strangely shaped domes. We climbed directly up to the dome and were awed by the fabulous view out over Paris’s roof tops. The view of the Eiffel Tower was magnificent and we had fun picking out all of the other various sights that we’ve seen on previous trips. Before our visit I had never realized that even the dome roofs were clad in thick slabs of limestone, giving the church its characteristic shimmery appearance and weighing unfathomable tons. The interior of the church was relatively austere but I did appreciate that one of the beautiful mosaics named the architect. My favorite part of the Montmarte village is that despite all the tourists, despite the refinement of the once bohemian and artsy atmosphere, the village has retained a sense of everyday life through its numerous small shops. Within a block of our hotel there were at least four bakeries, two delis, two cheese shops, a wine shop, a fish merchant, and a butcher. Being exhausted at the end of the day, the cheese shop provided an excellent solution—we could enjoy a gourmet picnic with delicious French cheeses, French wine, baguettes, and pastries without having to sit through a long dinner. We ate a lot of cheese over the course of our long weekend! The next day was supposed to be rainy so we headed to the Museé d’Orsay to revel in the museum’s famous collection of impressionist paintings. The museum was very crowded, so while we did enjoy the exhibits, the experience was a bit diminished by the jostling crowds. I was also struck by how the museum has changed since my last visit in 1999. Then, nearly the entire museum was devoted to Impressionism, but now, they’ve broadened their perspective and more than half of the museum is devoted to other artistic movements. This meant that the impressionist exhibit was very culled and many of the paintings that I fell in love with then were no longer on display. This visit, I also began to notice how very narrow the museum’s presentation of Impressionism is. At the beginning of the exhibit, the text was clear that the museum’s collection comes primarily from a few private collections, so the museum’s collection reflects the taste of those few collectors. As a result, those few collectors have shaped the world’s view, understanding, and taste in Impressionist art for all time. All of the artists represented were men, all were French (the French have conveniently adopted van Gogh as their own), all painted in Paris at the turn of the century. Basically, the entire collection consists of seven primary artists: Monet, Manet, Renoir, Degas, Pissaro, Sisley, and van Gogh. A few other artists are represented with one painting each, but it’s really fascinating how the Impressionist cannon was defined by just a couple of wealthy taste makers. In addition to the paintings and sculptures, the museum’s cafe in front of one of the huge train station clocks was also a work of art with beautiful light fixtures made of riveted brass sheets. 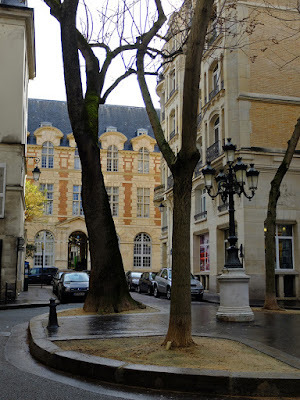 We spent a couple of hours wandering the St. Germain neighborhood, stopping in at the ancient St. Germain des Pres and the Neoclassical St. Sulpice churches. I was especially struck by the unusual medieval column capitals in St. Germain. We found a few absolutely charming nooks and crannies in the neighborhood and decided that the area deserves a much deeper wander some future trip. Passing by Notre Dame on the way to dinner, we were totally captivated by the front facade in the golden evening light. The clear sunlight really brought out all of the details in the stonework, it’s really incredible how detailed the carvings are. Actually, this weekend trip ended up being a bit of a “angles of Notre Dame” trip as we passed by and admired it several times at different times of day. The next day we had plans to actually visit the cathedral, but the lines were totally daunting and we decided to come back another time when it wasn’t a holy weekend. Instead, we ate a picnic lunch of onion chutney and pate on baguette in the park behind the cathedral and admired the flying buttresses. Another day, we ended up having a picnic lunch on a bench along the Seine looking at the cathedral from the side, and on our last day, we floated by on a tourist boat. This was my third visit to Sainte Chapelle, (Carl’s first,) and I am equally enthralled every time by the light, the airiness, the magical feat of construction. In fact, now that I reflect upon it, Sainte Chapelle is the most successful building I have ever experienced at seeming to defy gravity, of seeming structure-less, of using its structure in such a way that it doesn’t seem like structural elements at all, but fully integrated into a beautiful whole. The building is the structure and the structure is the experience. 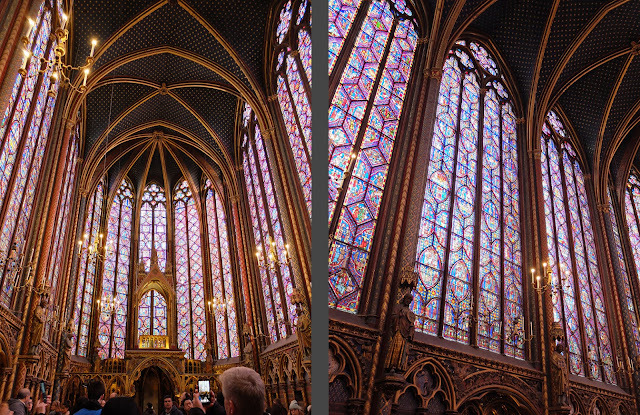 This time at Sainte Chapelle I began to notice details that I had been too awe-struck and dazed by the glassy lightness to notice before. The symbolically painted floor tiles are beautiful, and in addition to the soaring stained glass windows, stained glass is also incorporated into the wall decorations. Jewel-like marbles are incorporated into the statuary. The pilasters and wall decorations and ceiling are painted in shimmering, gold leaf. In candlelight, every surface would have sparkled, creating an even more magical and even mystical atmosphere. 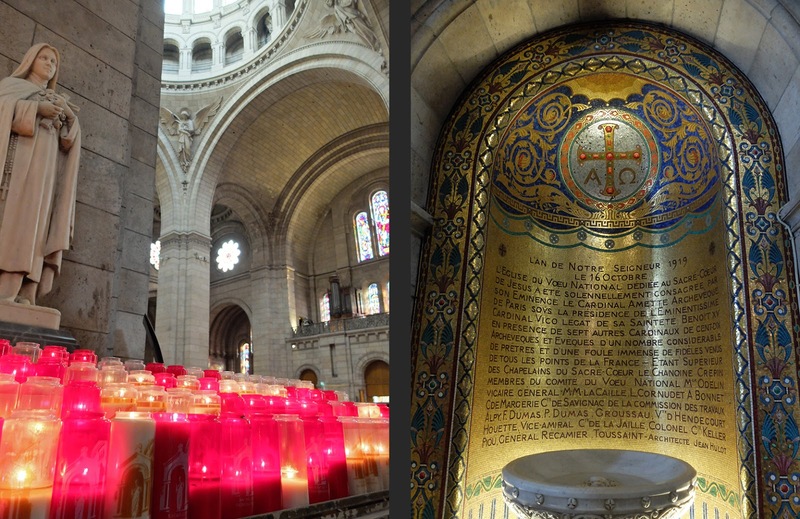 It was a long subway ride out into the Parisian suburbs, but visiting the Basilica of St. Denis was worth the trip. This basilica is where all of the French monarchy, from 639 A.D. to the 1800’s, were interred. While the royal remains were removed and destroyed during the French Revolution, the sarcophagi and funerary sculpture were left behind and today they comprise a collection of beautiful medieval sculpture. I was especially taken by the intricate marble folds of the deceased’s’ robes; one sculpture even had a brocade design carved into the surface of the marble folds. Also, the kings rested their feet for all eternity on lions, while the queens rested their feet on dogs. gave way to the interior’s Gothic points. The facade is also much simpler and far less detailed than the later Notre Dame in Paris. 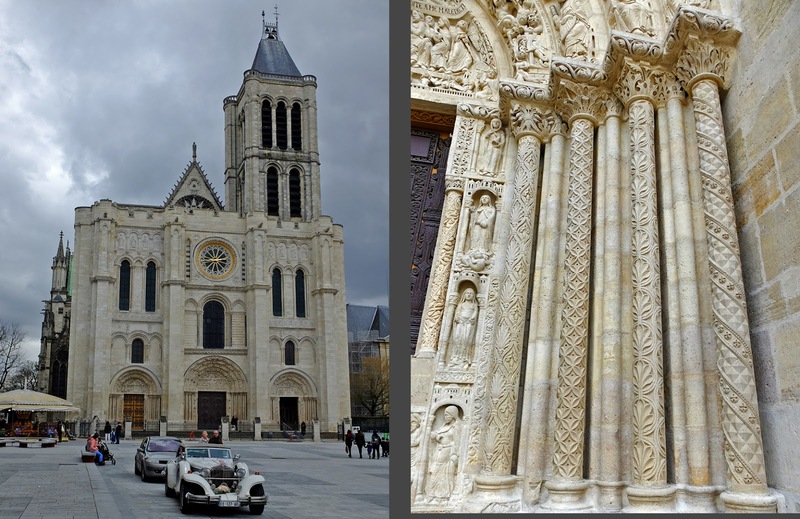 As always with medieval churches, I am fascinated how both “pagan” and “Christian” imagery are used side by side. 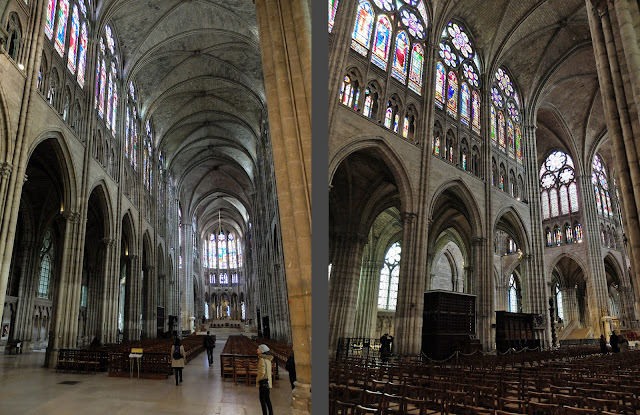 St. Denis’s stone ogres, dragons, and mythological creatures which are peppered all over the facades are a common feature of Gothic churches, and the floor of the altar area even feature the signs of the zodiac as well as more dragons and mythological creatures. It’s as if the old beliefs with powerful, dark creatures and the new beliefs with the Light of God are joined together to fight evil at all costs, even at the cost of an unadulterated Christianity. 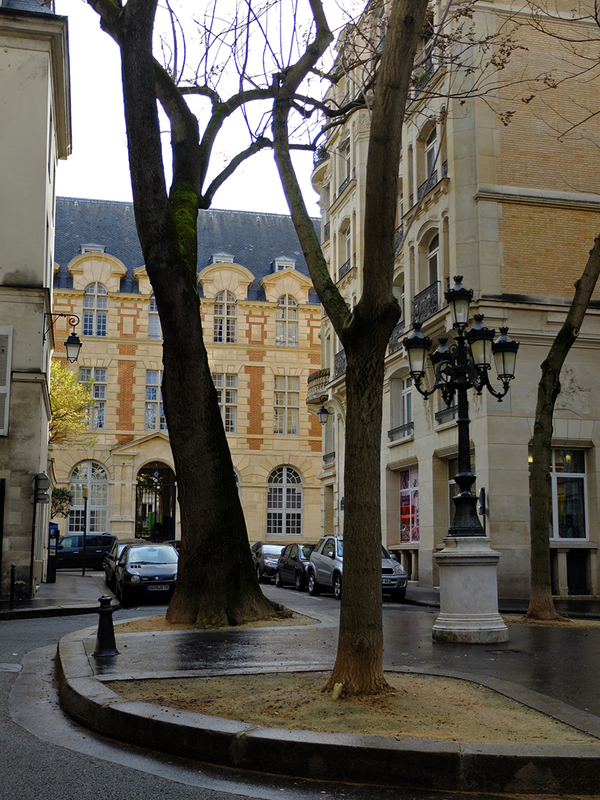 Later that day we strolled on Ile Saint-Louis and stopped in a cafe for a snack. The café was part Parisian bistro, part Parisian café, and part American diner with its gleaming white tiles and chrome details. It was one of the most fantastic snacks of my life with deeply flavored French onion soup with delicious melted cheese, grilled escargot in a garlic butter sauce, and delectable, crisp white wine. 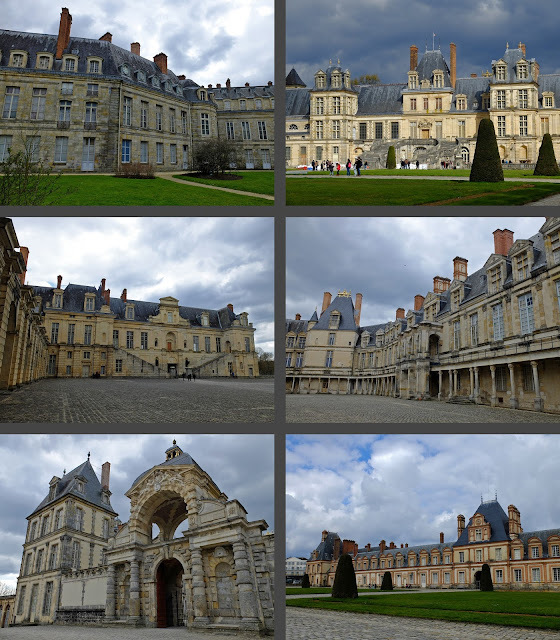 We took a day trip by train outside of Paris to the Chateau de Fontainebleau. 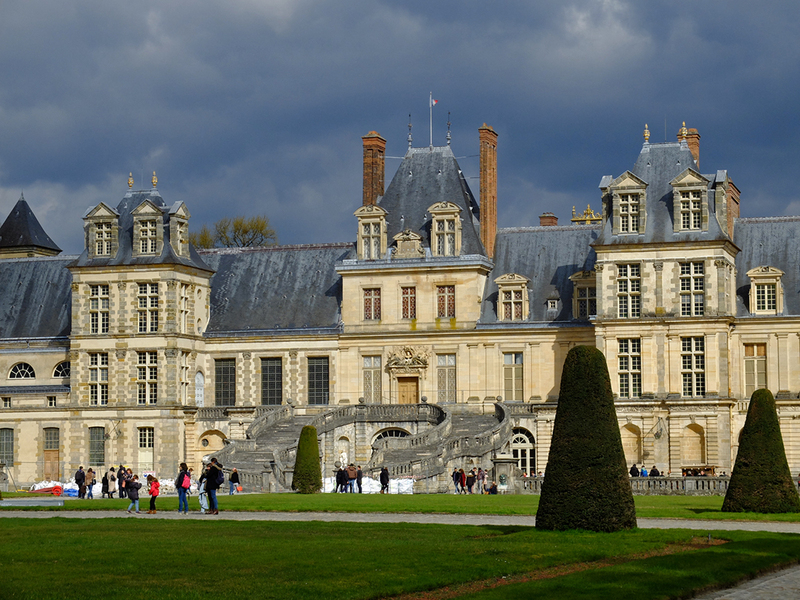 Fontainebleau dates back to at least the 1100’s as a medieval castle. It was rebuilt into a Renaissance palace in the 1500’s and succeeding generations of royals used it as their country palace, adding on wings until the palace reached its current 1900 rooms. 1900 rooms! 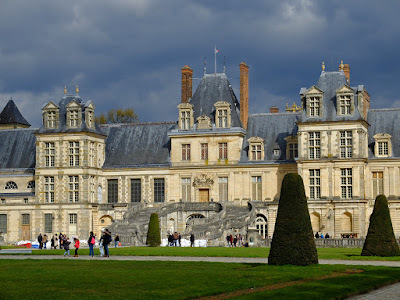 The palace faded in importance when Louis XIV felt the need to break from tradition and built his own country palace at Versailles, but Fontainebleau continued to be used through to the rein of Napoleon III. These buildings are just the servants' quarters. The palace’s sprawling form with wings spiraling outward from a central hub along with its varied steep roofs, dormer windows, and numerous chimneys make the palace look like an entire village from a distance. Although huge, the palace looks deceptively small. You can never see the entirety of the palace in one view. Also, the palace is “only” three floors plus an attic when you look at the rows of windows. However, everything is so out of scale that it’s hard to see that each floor is more like 2 ½ or 3 floors! So really, the palace is more like 9 stories tall with voluminous rooms. Many of the palace interiors from the 15- and 1600’s are intact and they are so sumptuously over-the-top that it’s hard to take everything in. Every surface of every room is smothered with luxurious finishings from gilded leather wallpaper to silk carpets to medieval tapestries to heavily moulded, gilded ceilings to giant crystal chandeliers. 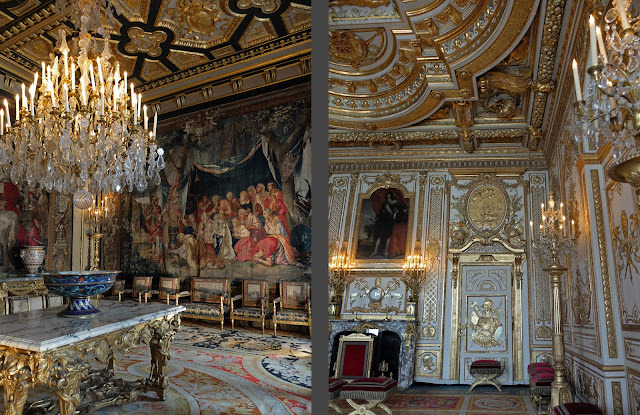 It’s interesting to see these rooms and to compare them to contemporary palace rooms in Sweden. Sweden was forever trying to imitate French fashion and reproduce the French level of luxury, but the coffers just were never as deep nor the craftsmanship as skilled. 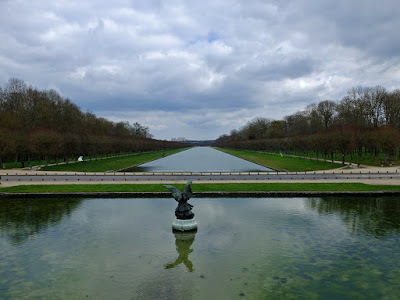 Fontainebleau’s grounds aren’t as extensive nor as original as Versailles’s, but even so we managed to walk about 10 kilometers while covering the various gardens and parks. 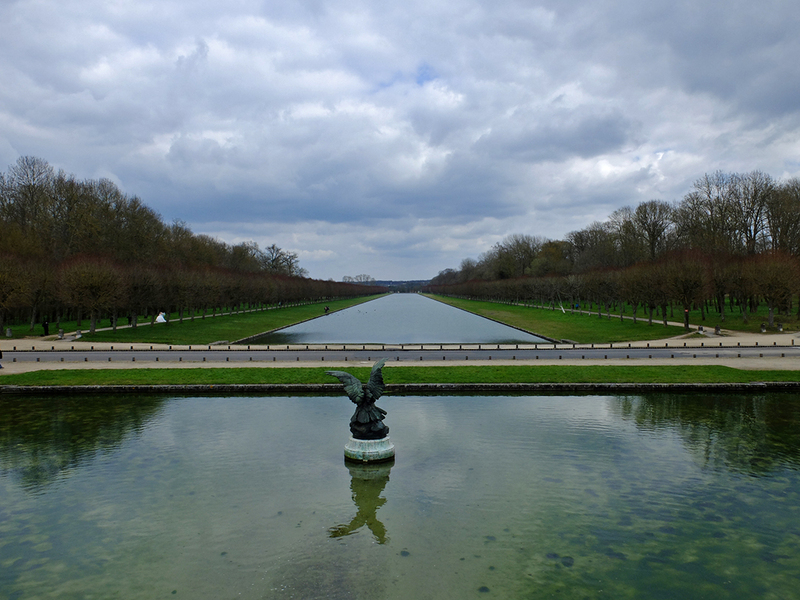 The arrow-straight canal, for example, is 1.2 kilometers long (the one at Versailles is 1.6 km, Louis XIV had to outdo Fontainebleau in every way). We had a lovely picnic on a bench overlooking the palace from the other side of the lake. I was enchanted by Fontainebleau. I loved the organic way that the various wings sprouted out from the original castle over time. I loved the brick detailing, which I think is fairly unique in the Parisian region. The tall roofs and chimneys felt like a romantic overlay contrasting the strict geometries of the Renaissance facades. The interiors were unfathomably rich. The views over the lake and pond to the sprawling palace were straight out of a fairytale. Our last day in Paris, we took a tourist boat along the Seine and up the St. Martin canal. The canal was dug for business and shipping purposes to link up two sides of the winding Seine with northern Paris. It was bustling but unsightly until Haussmann dug the southern part of the canal underground in order to create neighborhoods for the bourgeoisie. The first part of the canal was in this underground tunnel, but then we emerged into daylight in the St. Martin neighborhood. We also went through four double locks and past a few swinging bridges. The tree-lined canal is scenic, but I didn’t fall in love with the St. Martin neighborhood as we strolled through it after our boat trip. It’s a relatively un-touristy neighborhood and I appreciated the “realness” of it, but it just didn’t have the same charm as some of the other neighborhoods that we’ve strolled through. We were excited to get home to Gordon, but our five days in Paris passed all too quickly. We are, as always, looking forward to our next visit.